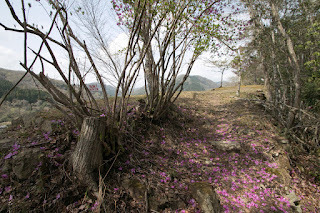 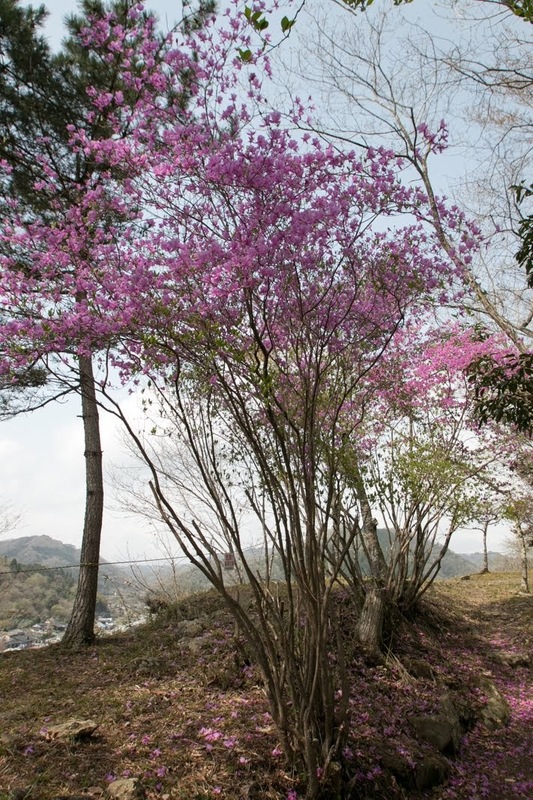 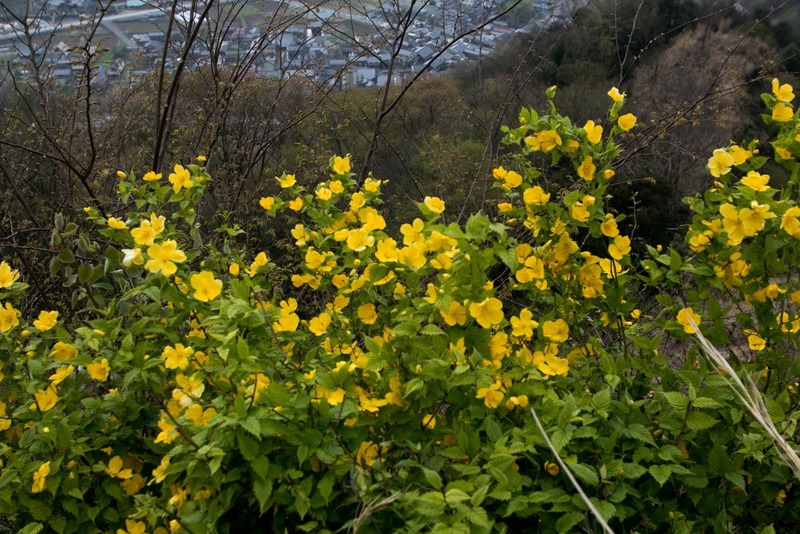 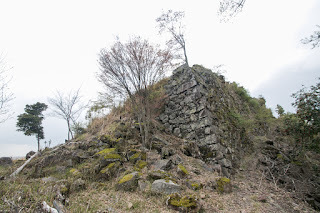 Rikan castle (利神城) is located at Rikanyama mountain, one of over 200 meter height from hillside at the backside of Hirafuku town, in the north of Sayo basin. 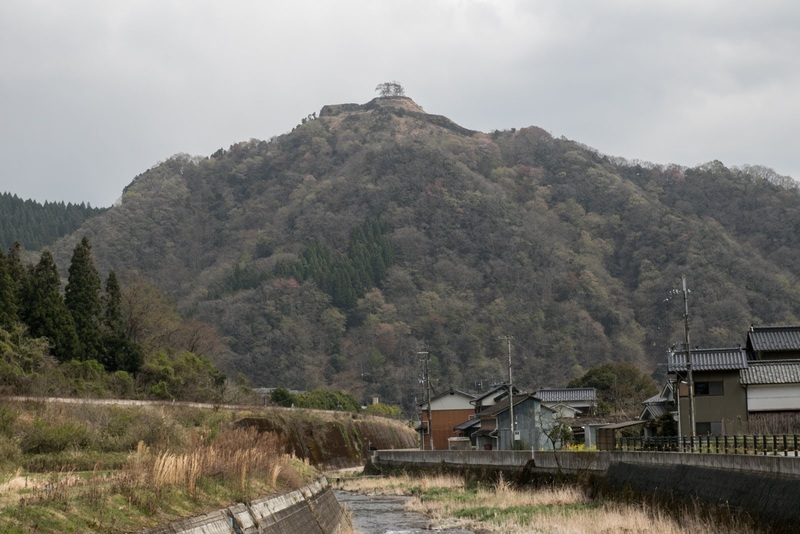 Since medieval area, there is an important route connected Sanyo region and Sanin region passing Chugoku mountains, from Himeji city to Tottori city through Sayo area. 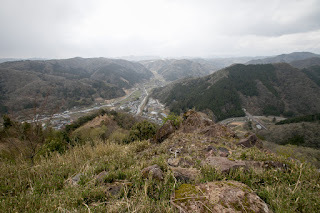 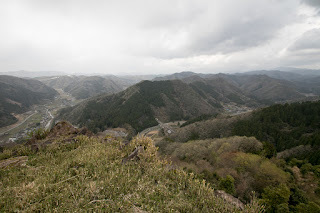 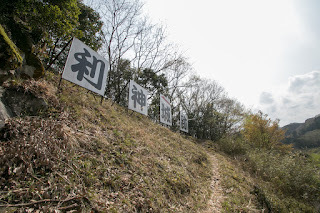 Hirafuku area is located at the place where this road starts to climb up to Chugoku mountains, and an important place to control traffic from Tottori area into Hyogo area. 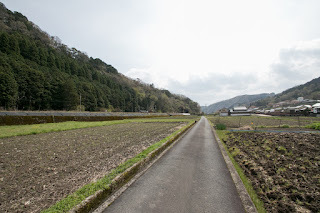 Currently importance of this area is unchanged, and major lines connects Sanyo and Sanin region such as Chizu Kyuko railways or Tottori highway pass this area. Precise year is unknown but Rikan castle might be built by Akamatsu clan, the governor of Harima province (south part of Hyogo prefecture) in 14th century. 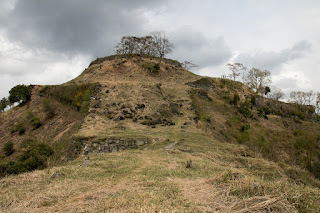 Akamatsu clan was originally a local small lord of Harima province, but in 14th century Norimura Akamatsu (1277-1350) activated at anti Kamakura Shogunate campaign by Emperor Godaigo. 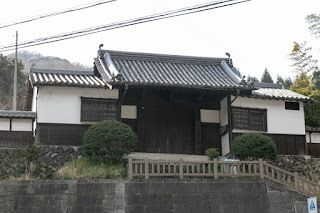 Akamatsu clan contributed to establishment of Muromachi Shogunate by Takauji Ashikaga (1305-1358) and became one of the major retainers of Shogunate. 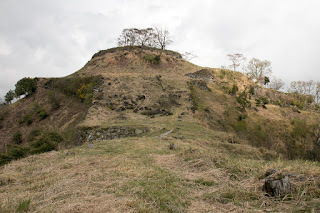 In 1441 Mitsusuke Akamatsu, leader of the clan, killed autocratic sixth Shogun Yoshinori Ashikaga (1394-1441), and was subjugated by Shogunate then Akamatsu clan once fell. After decades, survived descendant of Akamatsu clan activated in the battle of Onin, and came back to the governor of Harima province, Bizen province and Mimasaka province. 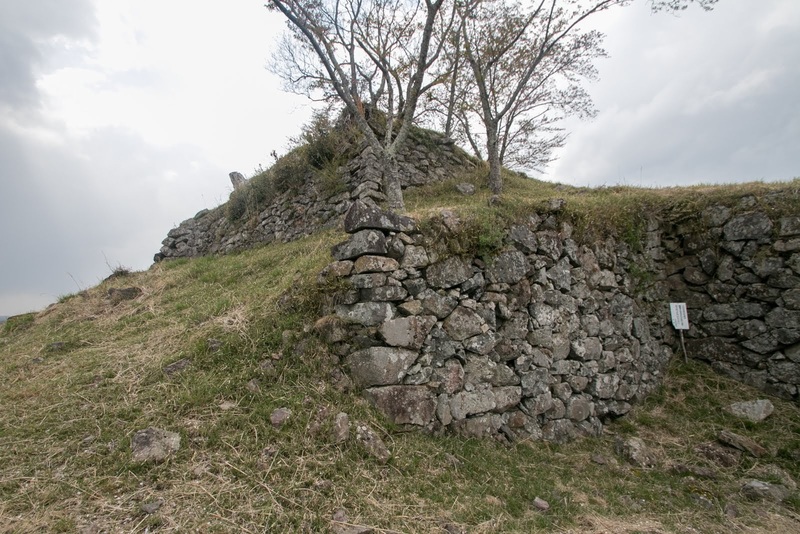 In the former half of 16th century Akamatsu clan proceeded centralization, but could not defeat deputy governor Uragami clan and could not transform into warlords. 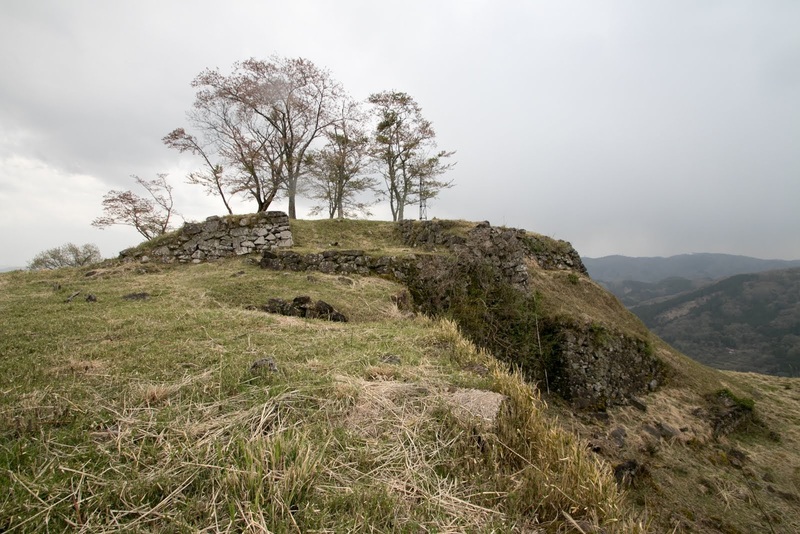 At the middle of 16th century, Akamatsu clan lost its authority and power, and decendants individually located at west half of Harima province. 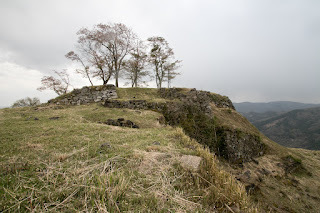 For Rikan castle, Akamatsu clan placed people of Bessho clan, a large local lord under Akamatsu clan at Miki castle (Hyogo prefecture). 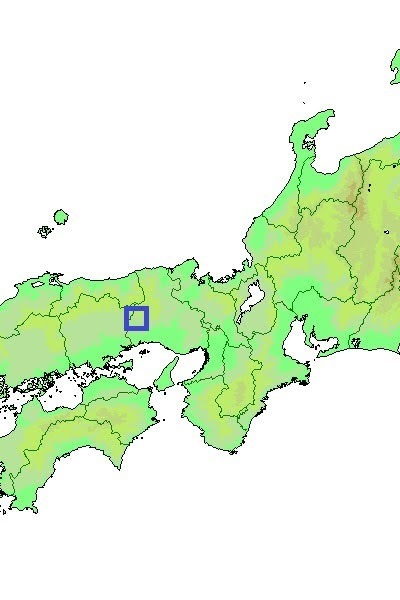 In 1577, central ruler Nobunaga Oda (1534-1582) aimed at expansion toward westward and sent his general Hideyoshi Hashiba (1537-1598, later Hideyoshi Toyotomi) as a commander of the region. 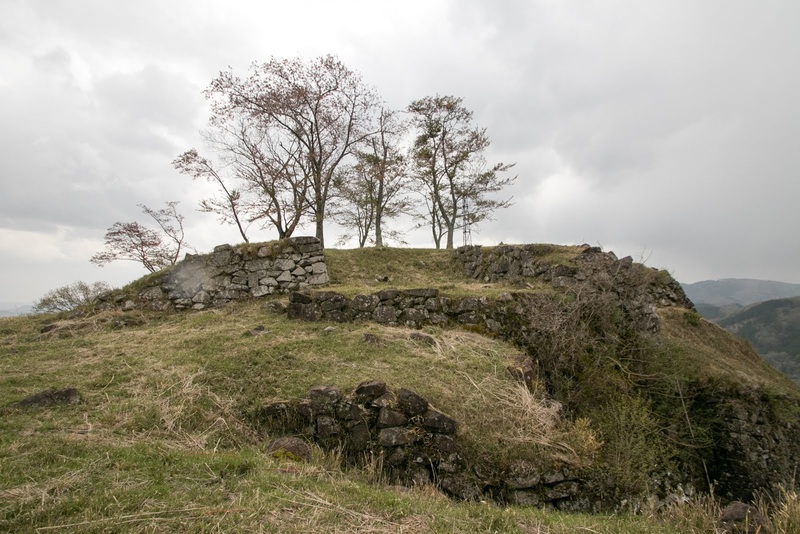 At first Hideyoshi gathered local lords of Harima province including Bessho clan, and Rikan castle once belonged to Hideyoshi. 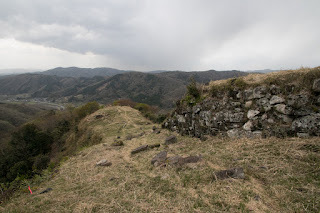 But seeing the slaughter of Hideyoshi at Kouzuki castle, Nagaharu Bessho (1558-1580), leader of Bessho clan, felt antipathy to Hideyoshi and changed to Mouri clan in 1578 spring. 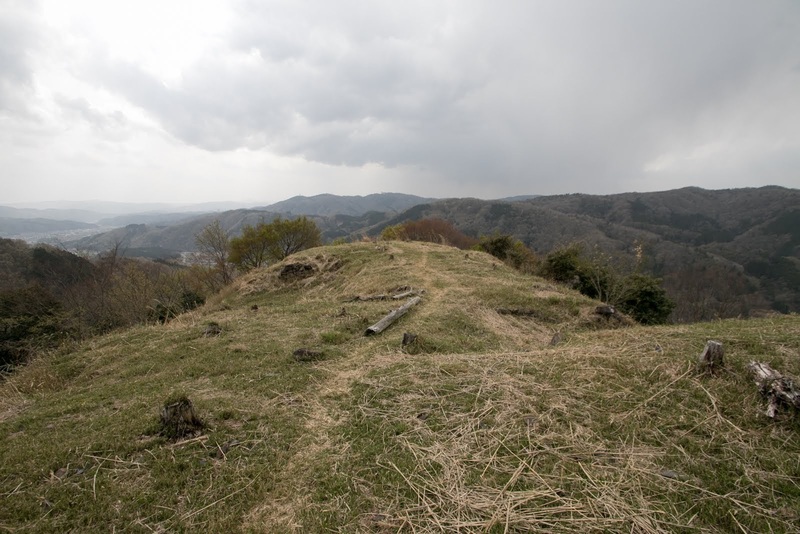 Rikan castle obeyed their head family and also hostiled to Hideyoshi. 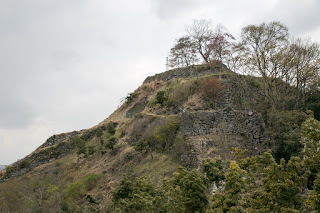 In response to this, in 1578 spring, Katsuhisa Amago (1553-1578) and Yukimori Yamanaka (1545-1578) who stayed at Kouzuki castle under Hideyoshi attacked Rikan castle. 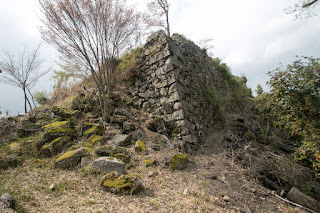 Rikan castle fell under attack of Oda army, and commander of the castle shared his fate with the castle. 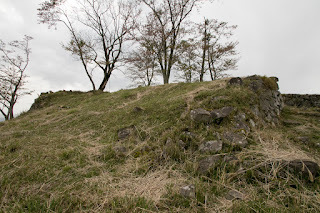 But several month after, because of counter attack of Mouri army, Katsuhisa Amago and Yukimori Yamanaka died at Kouzuki castle. 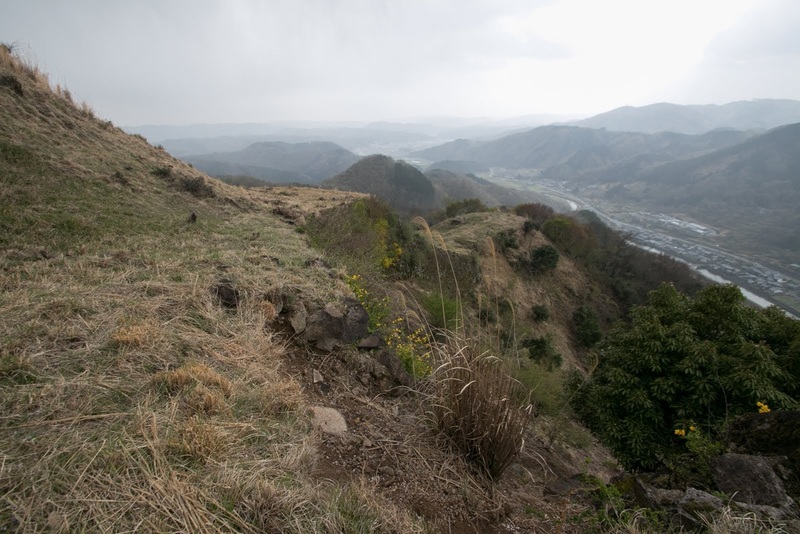 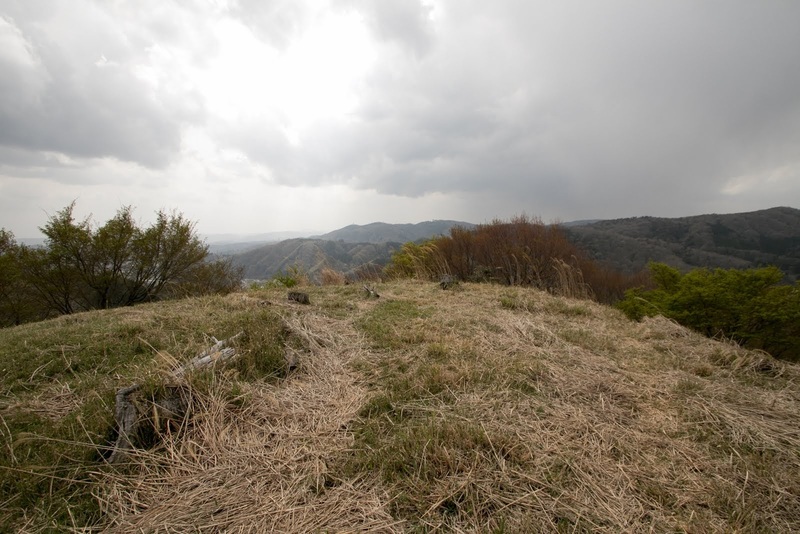 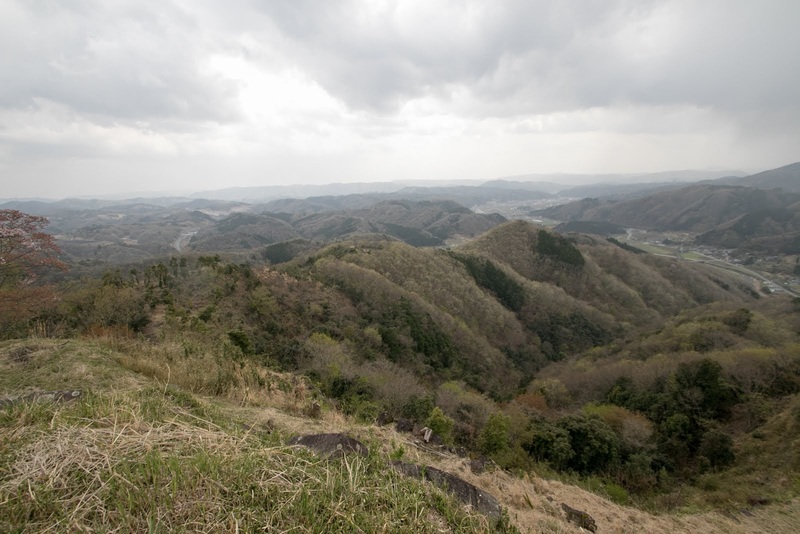 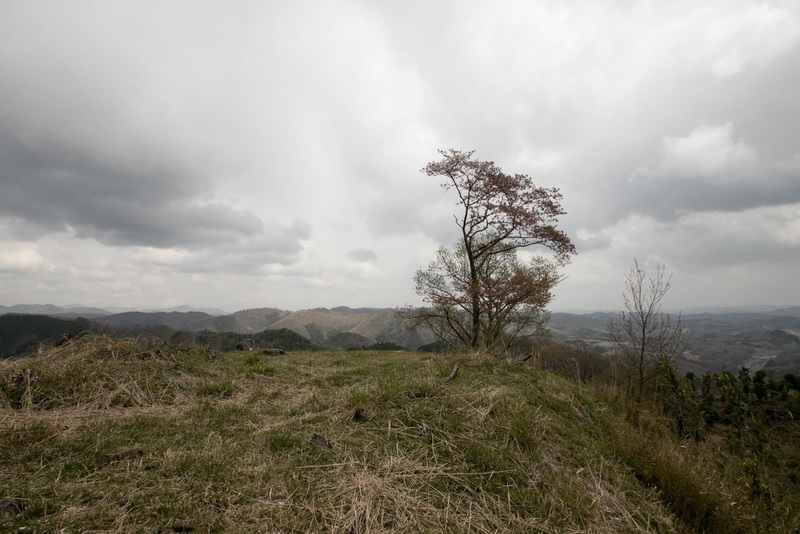 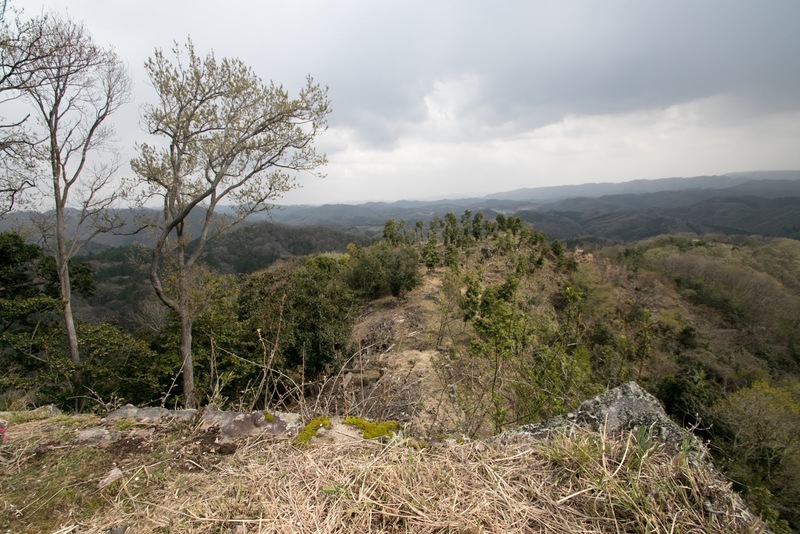 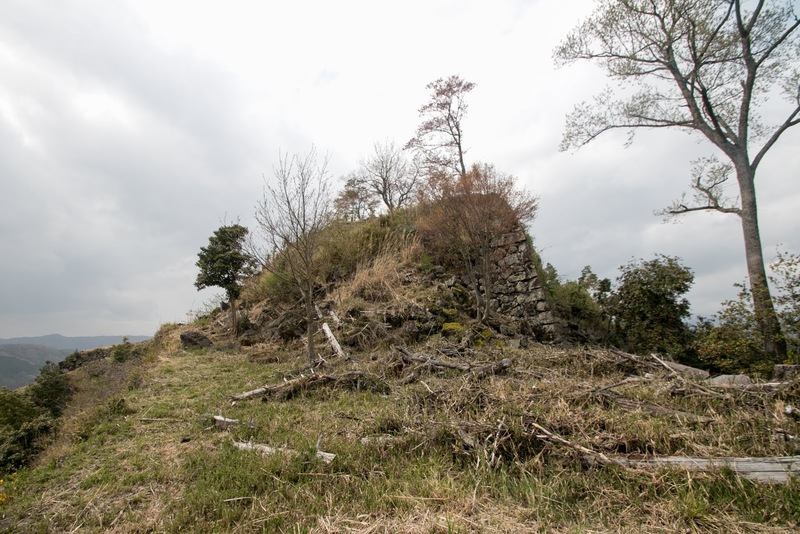 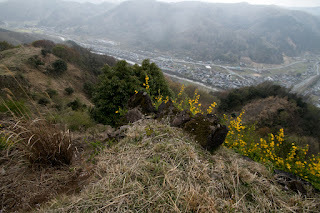 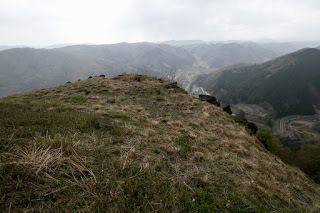 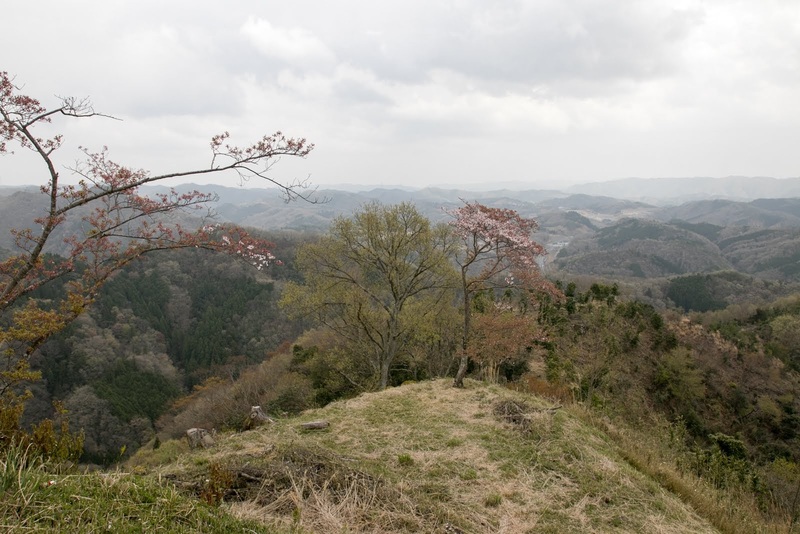 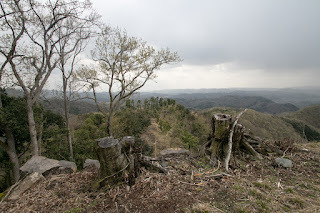 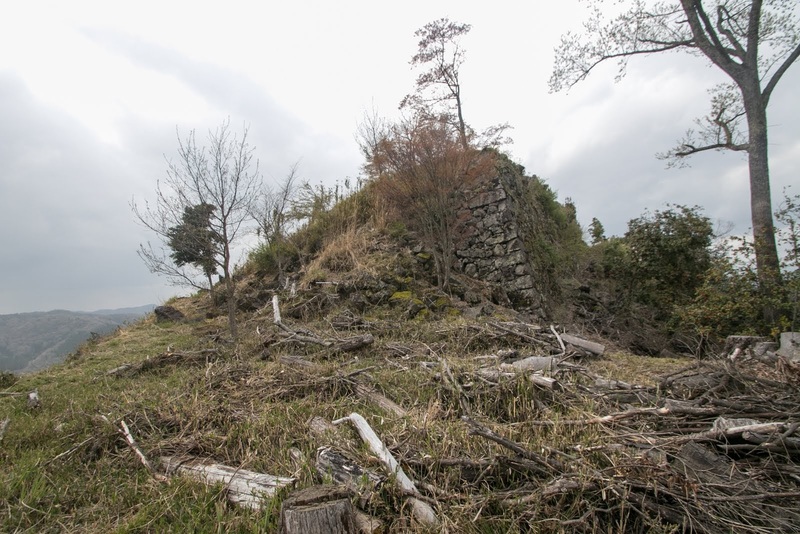 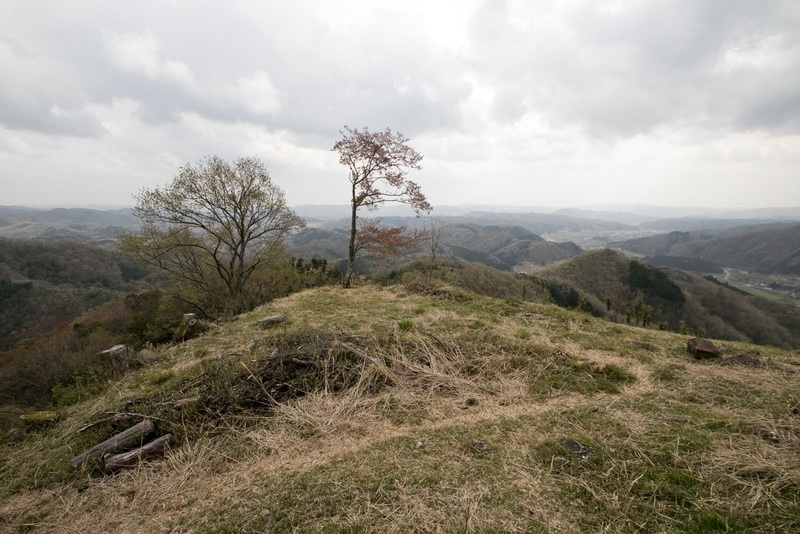 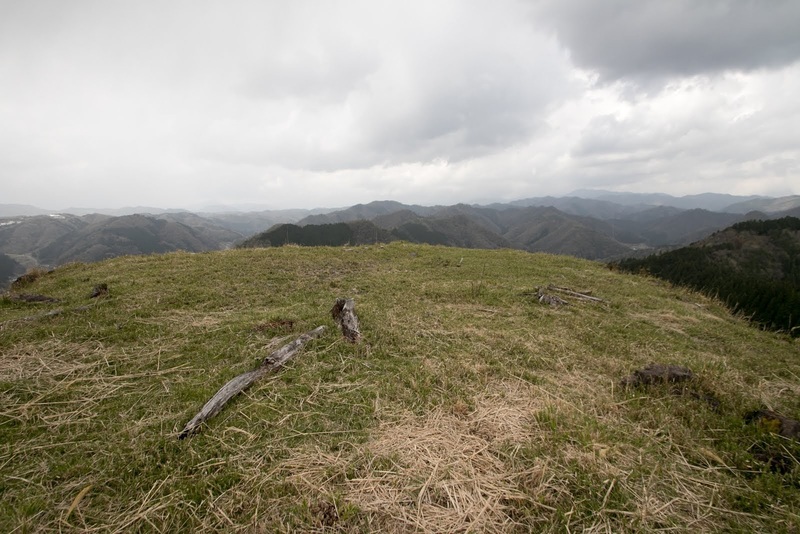 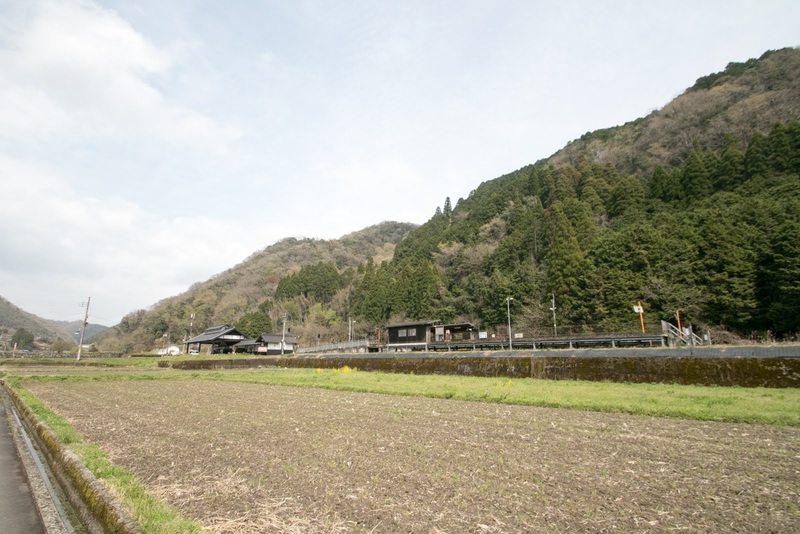 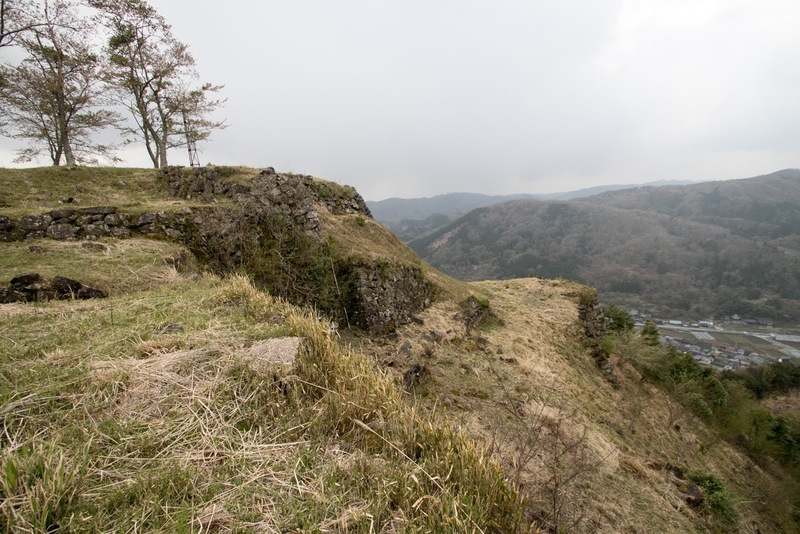 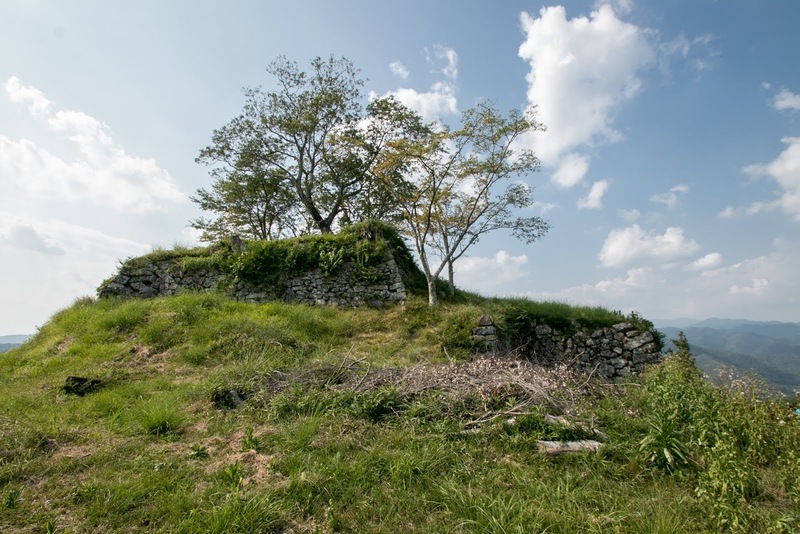 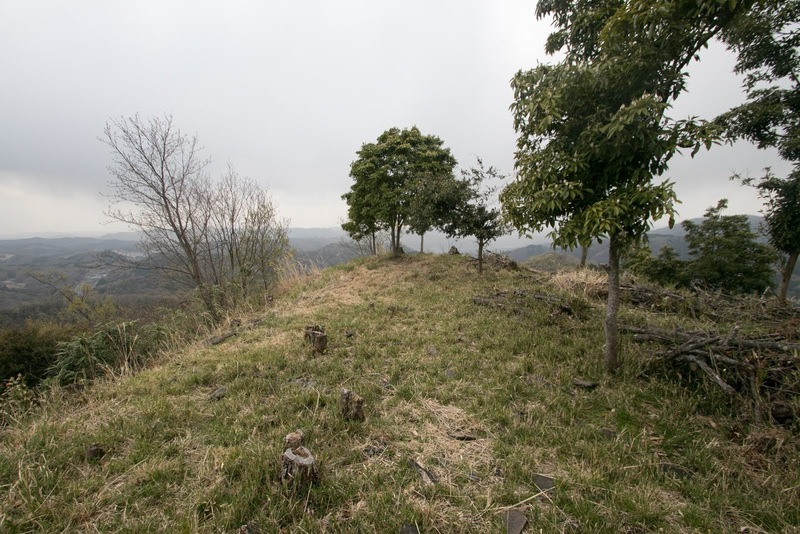 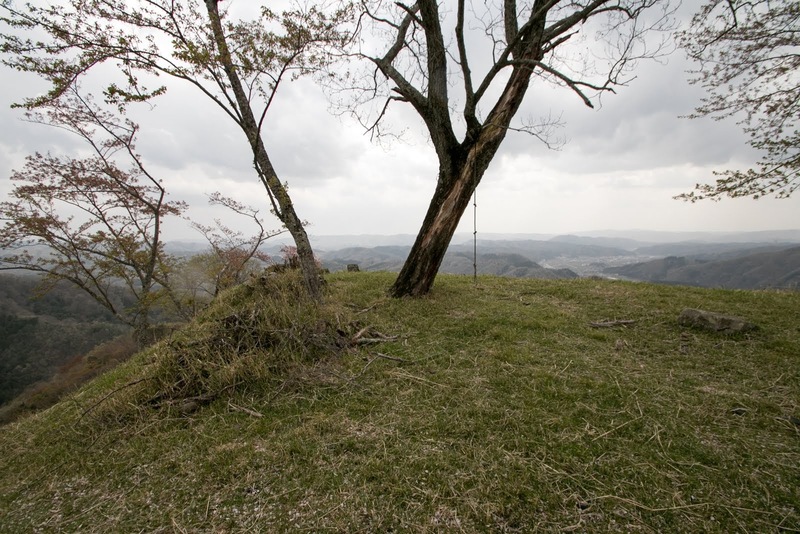 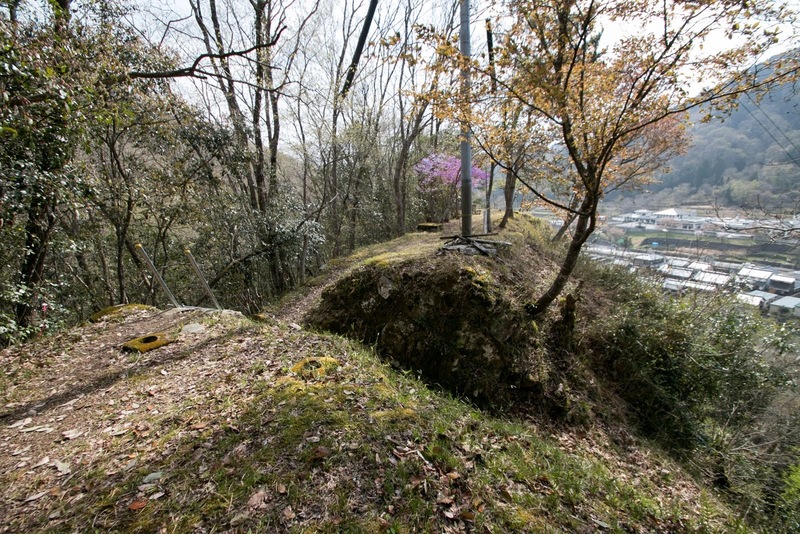 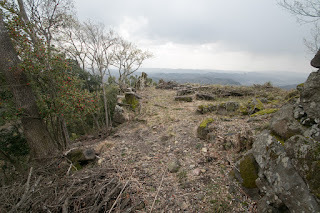 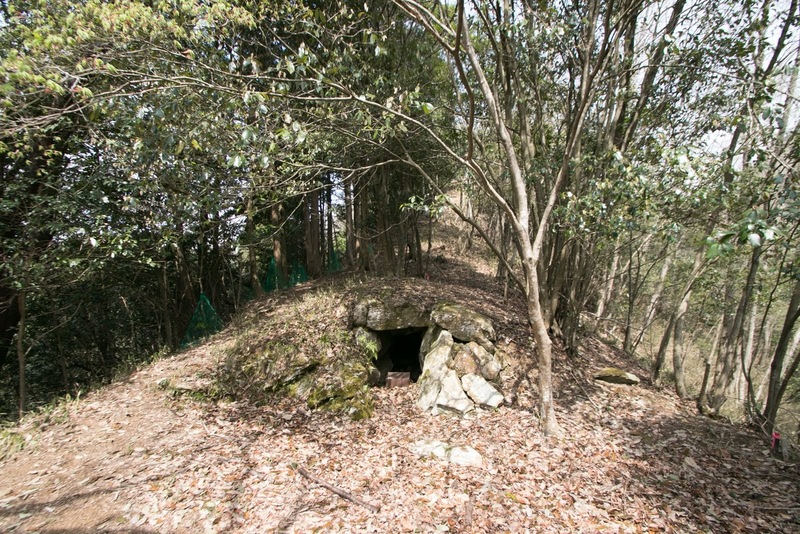 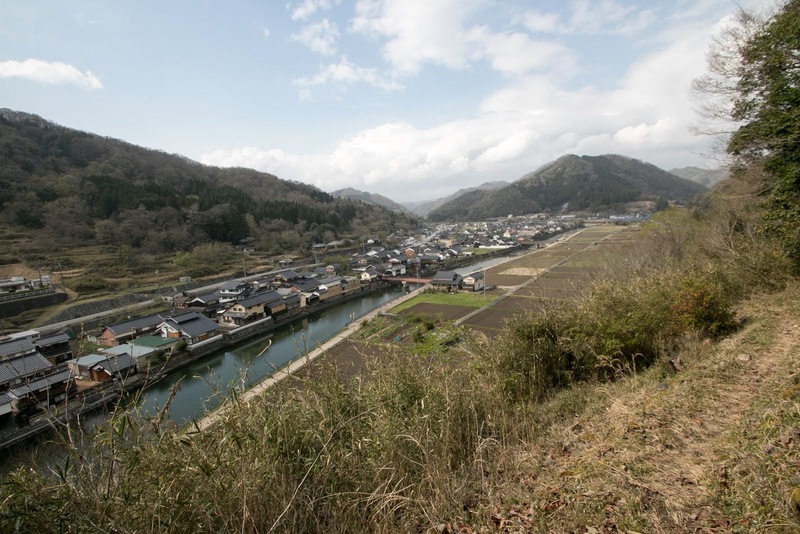 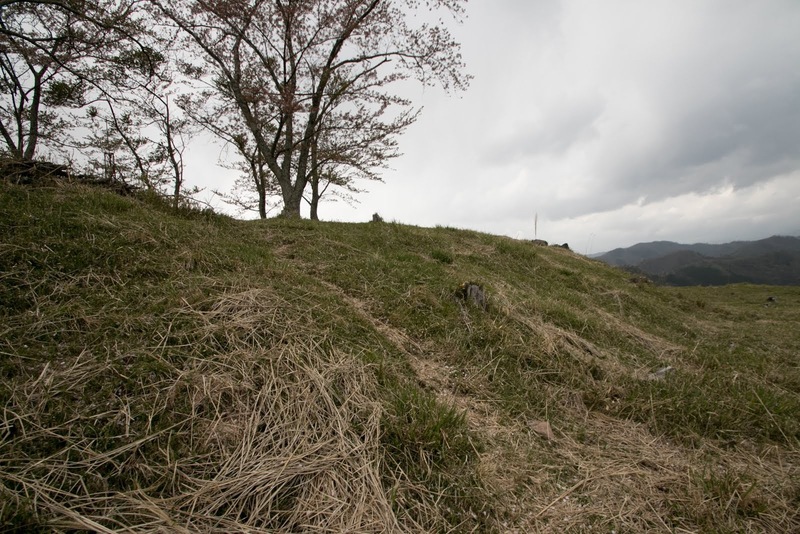 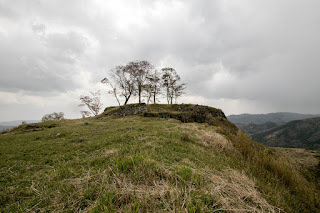 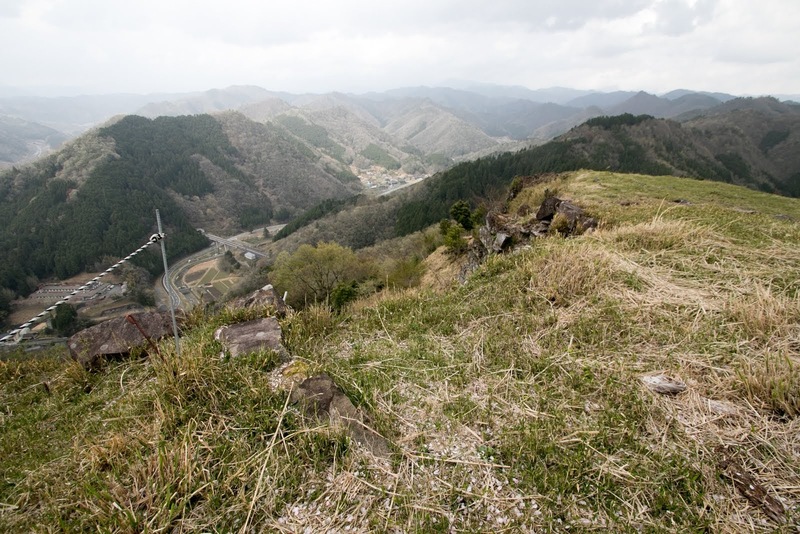 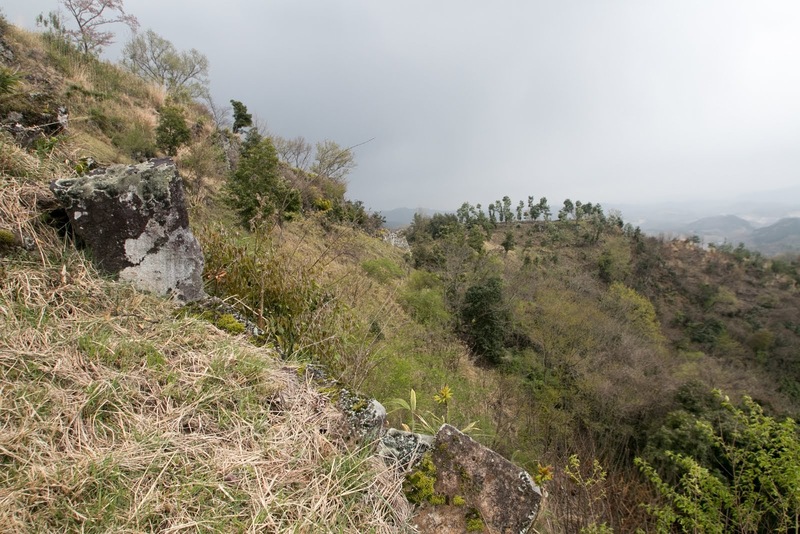 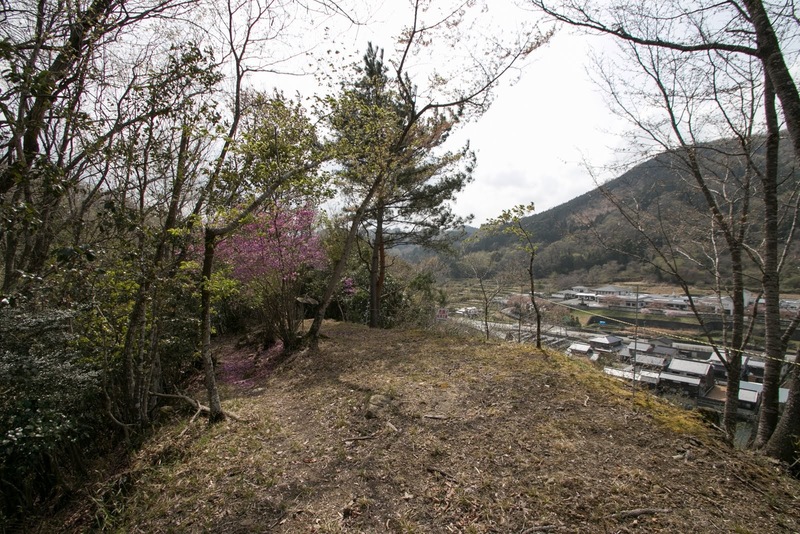 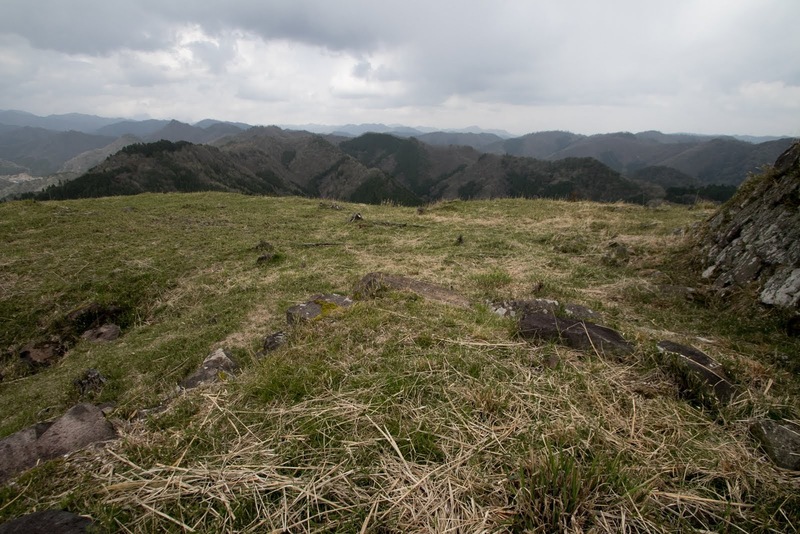 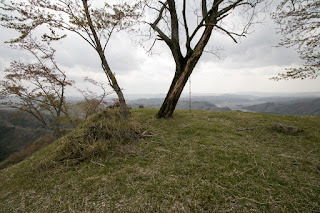 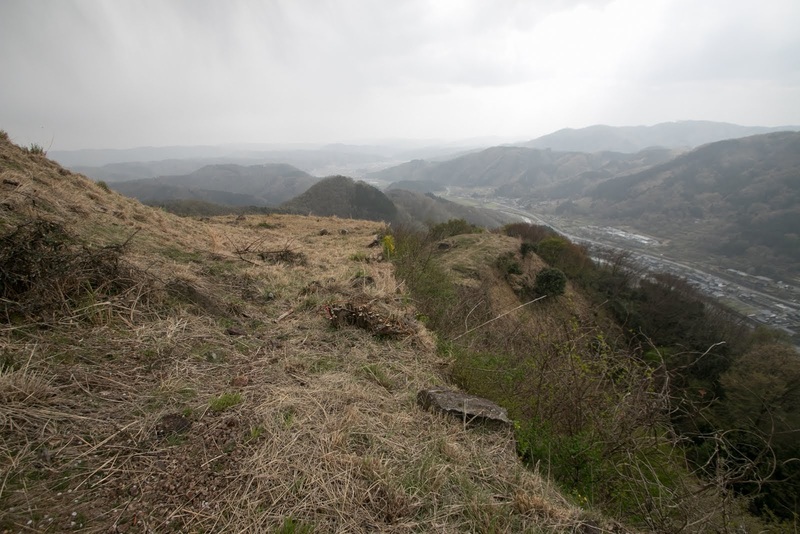 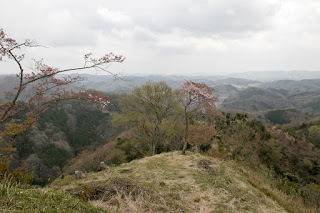 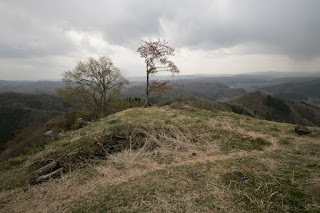 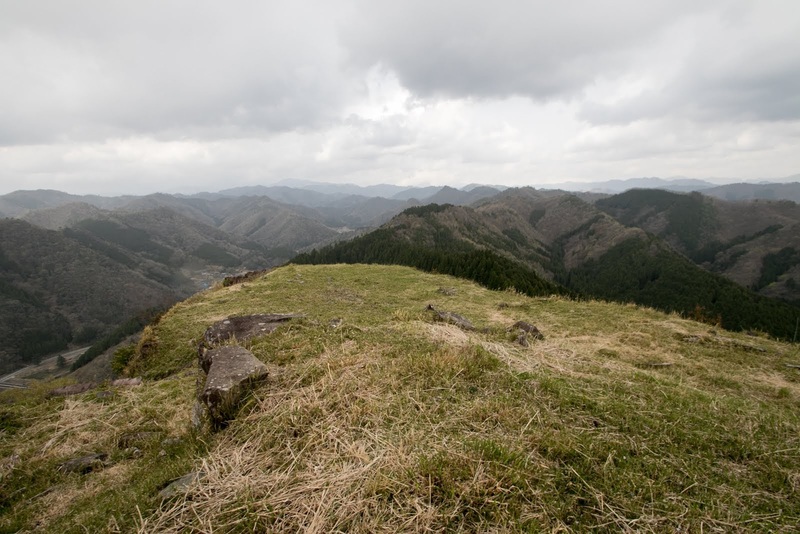 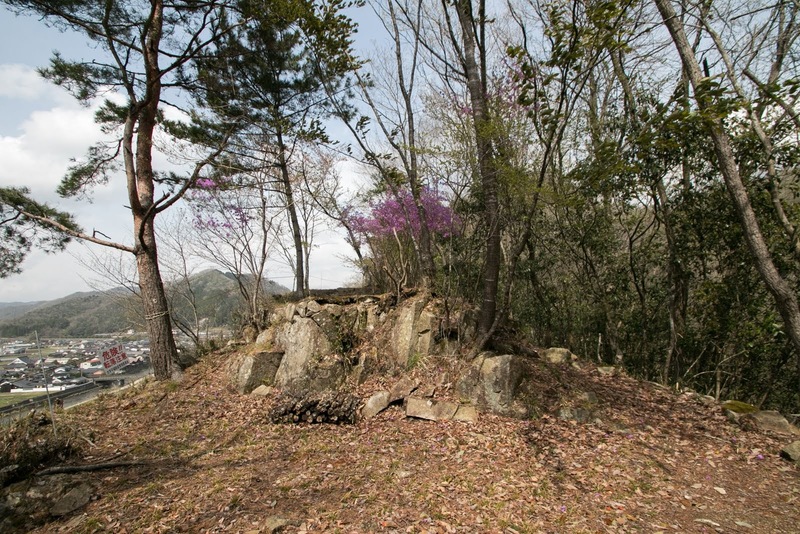 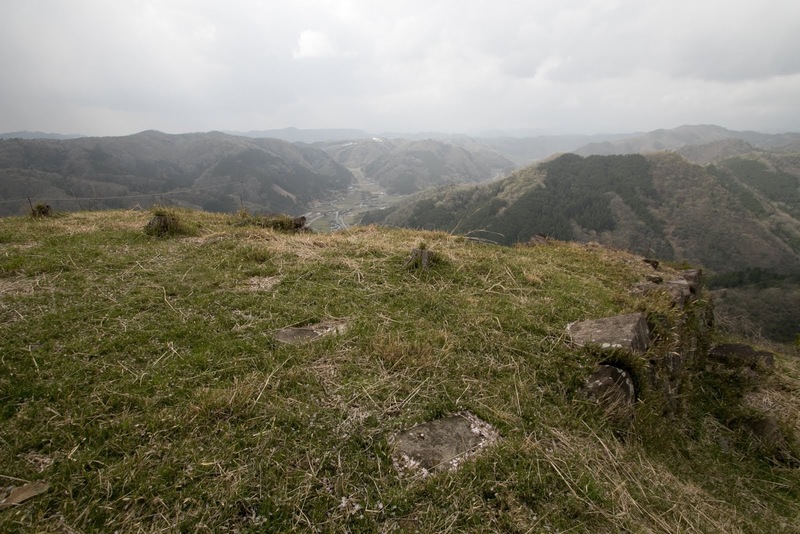 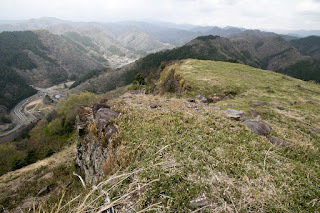 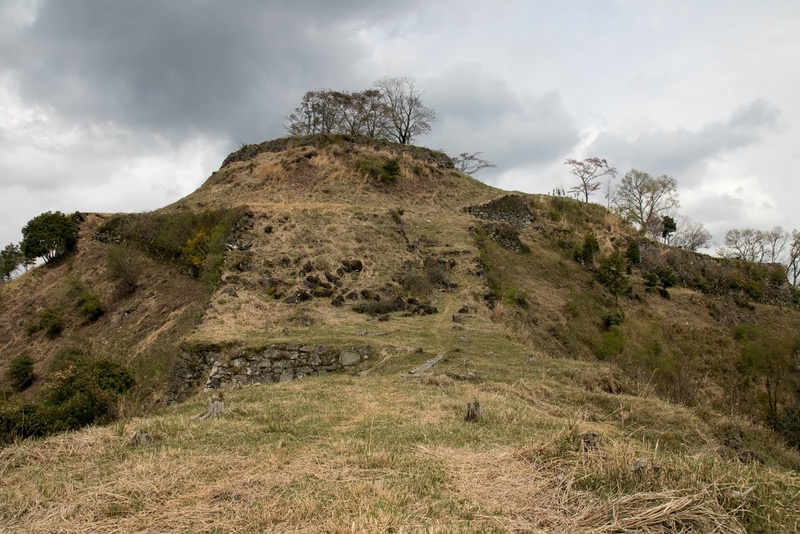 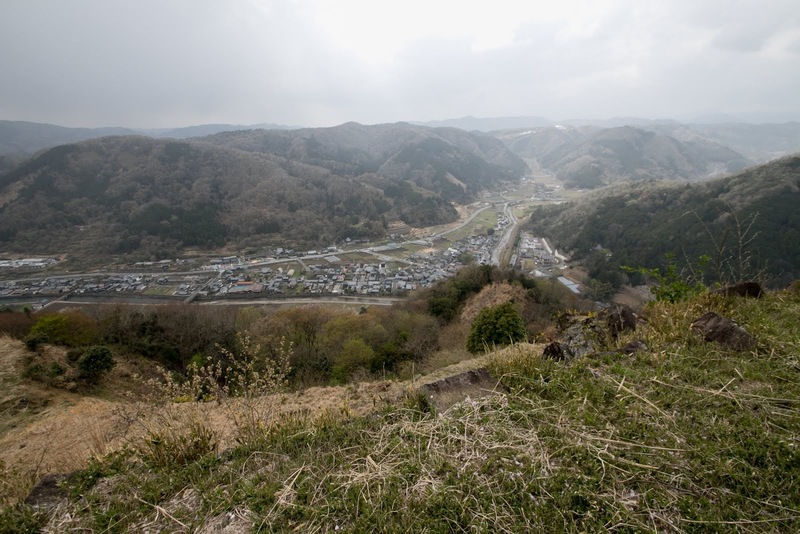 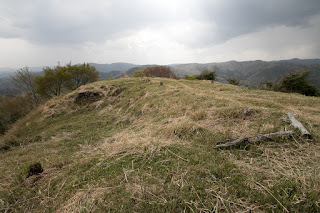 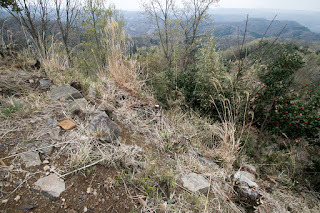 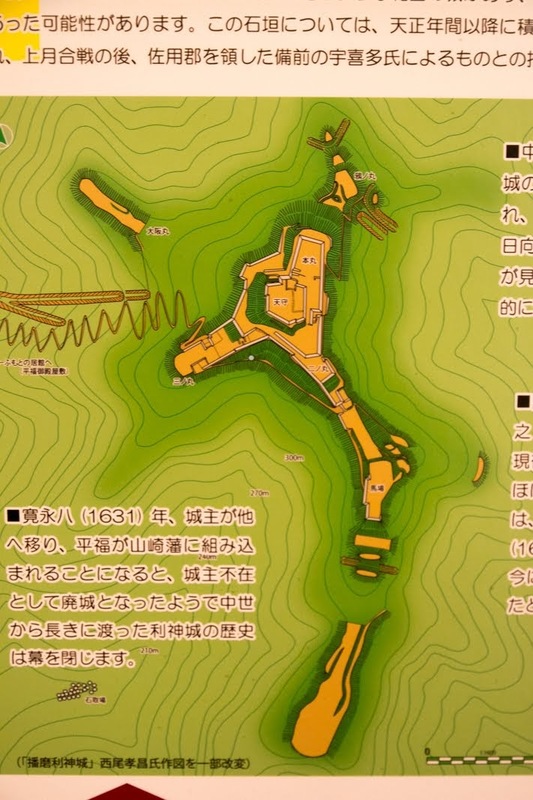 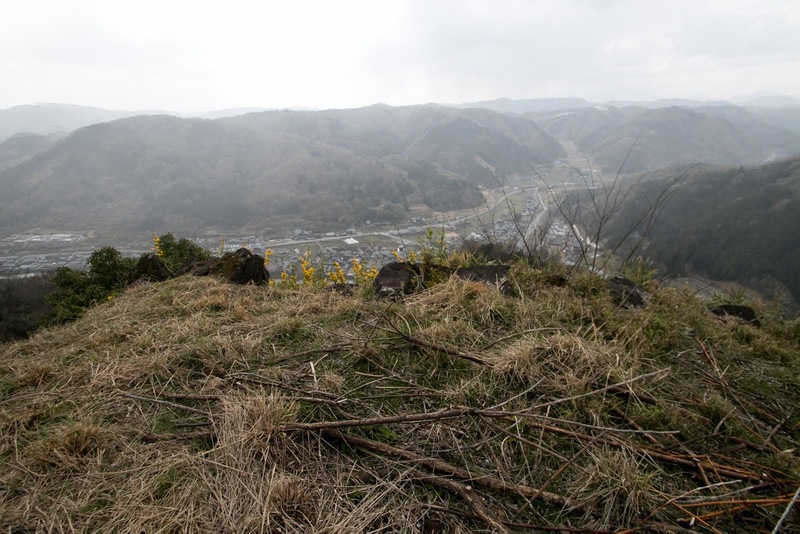 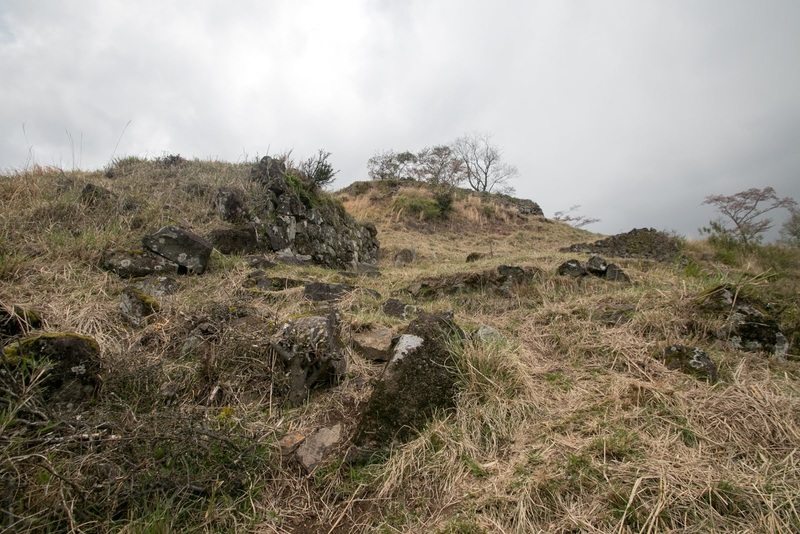 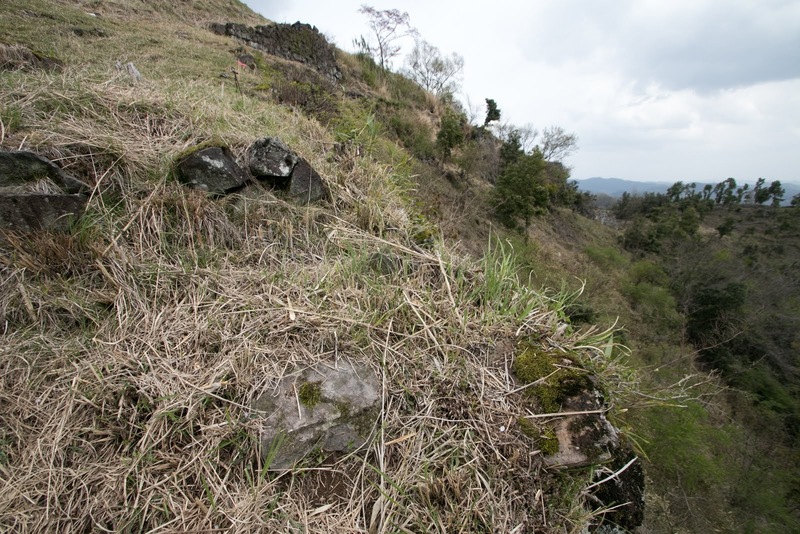 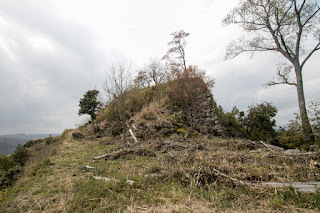 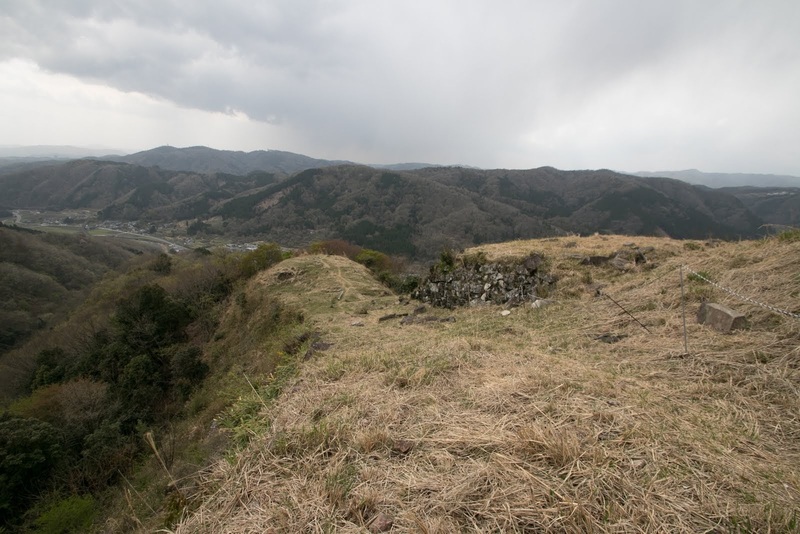 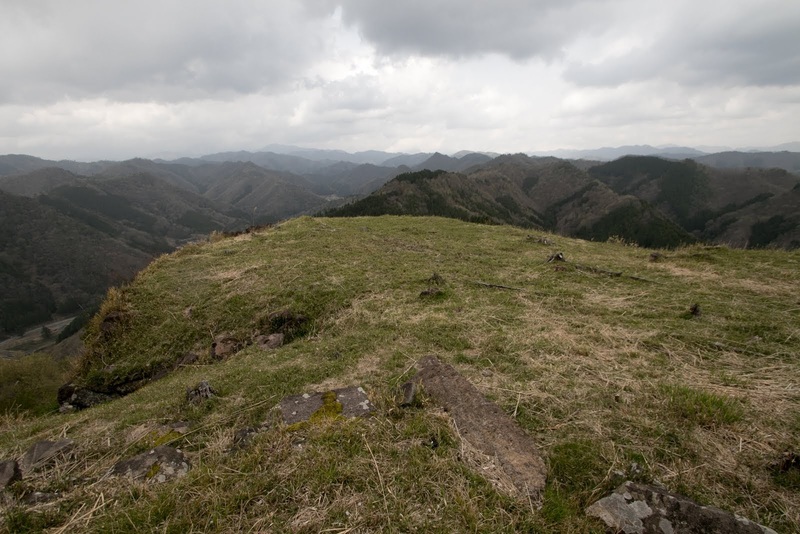 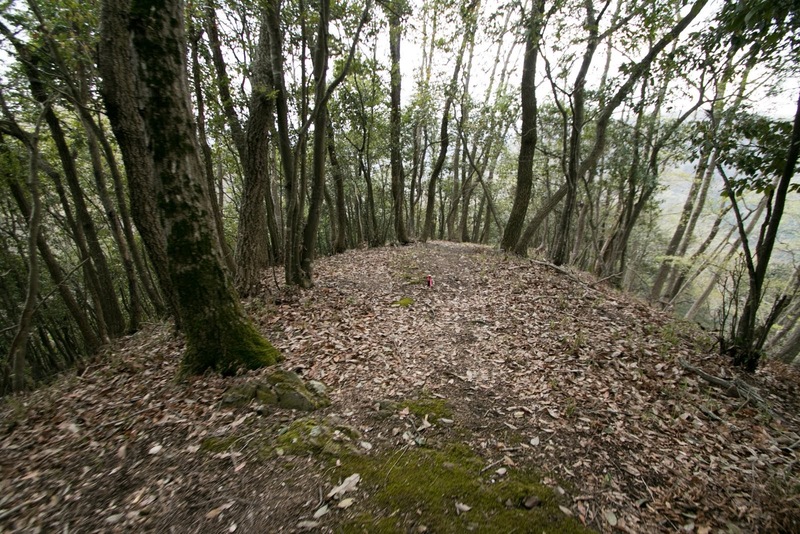 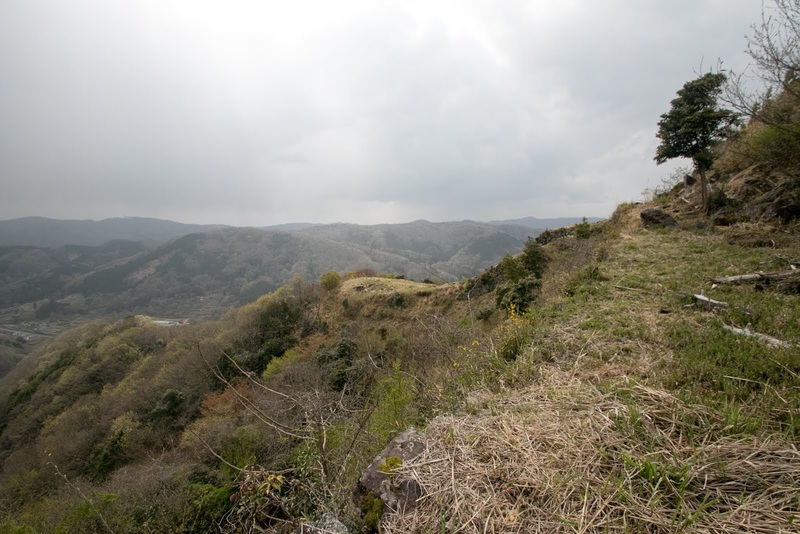 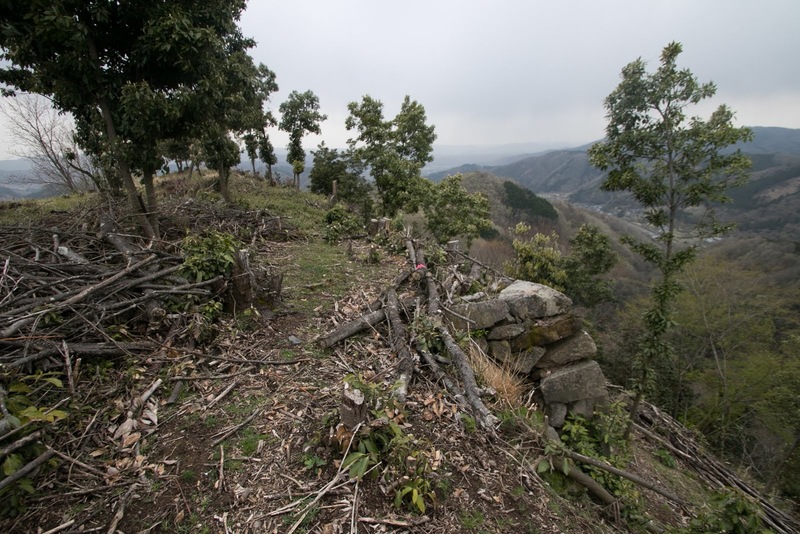 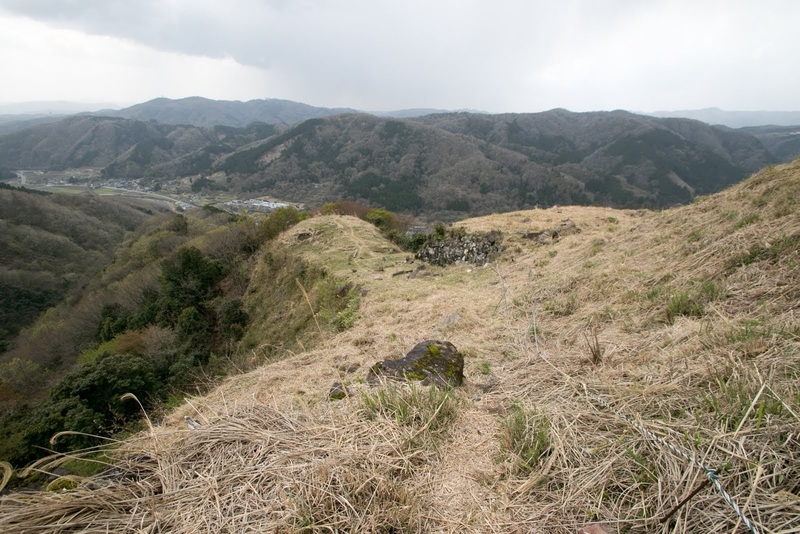 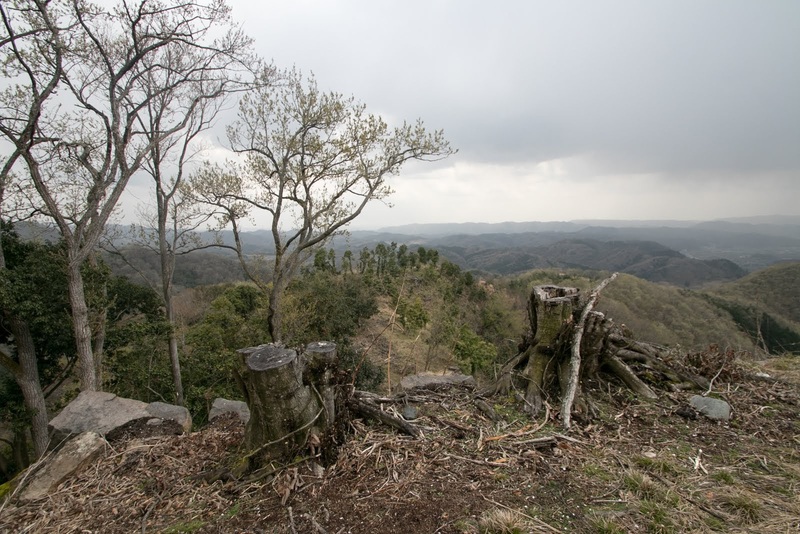 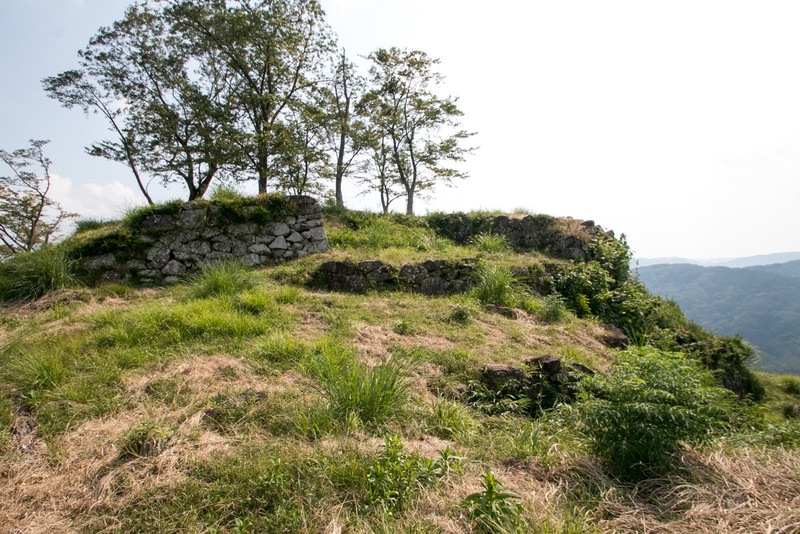 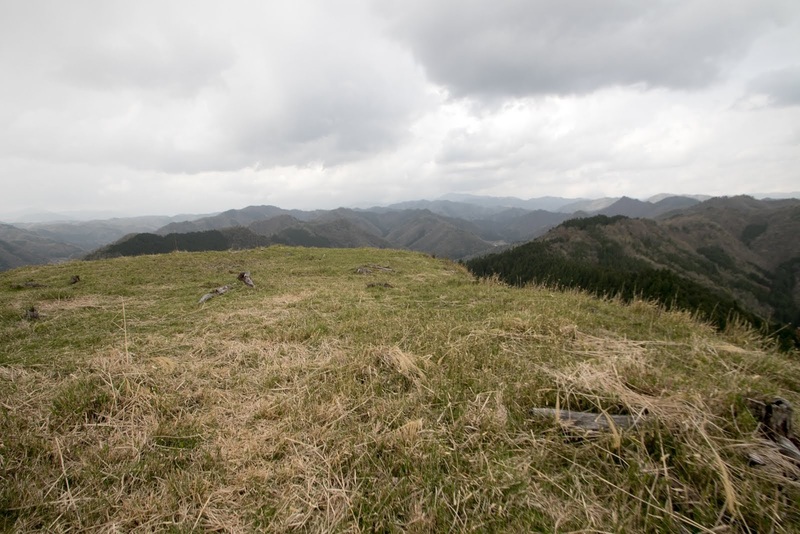 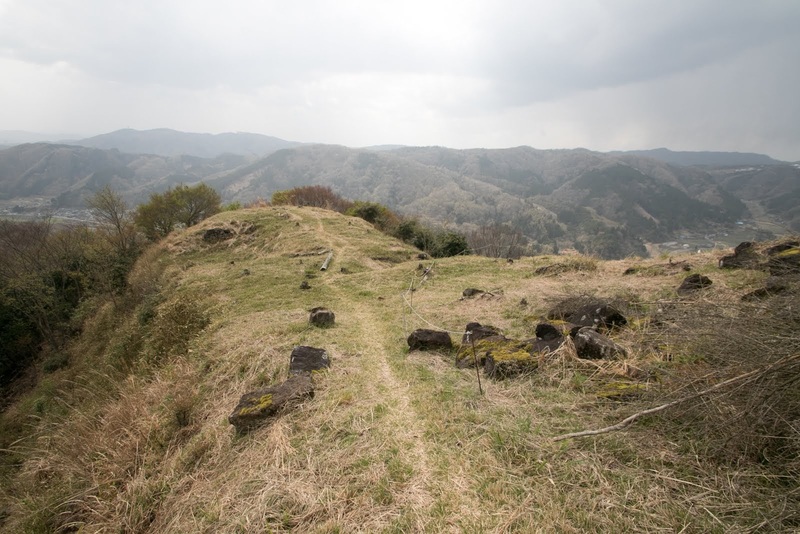 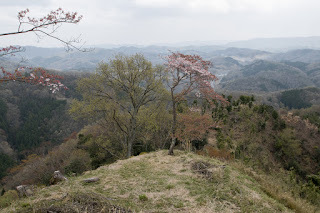 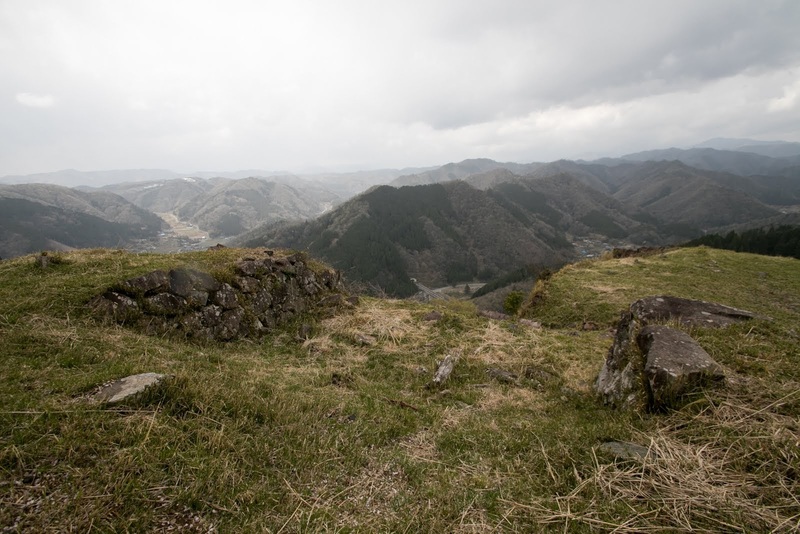 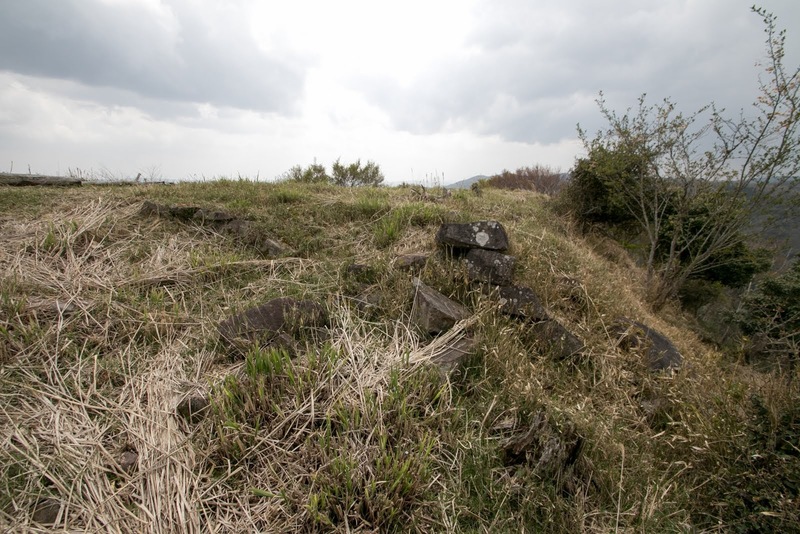 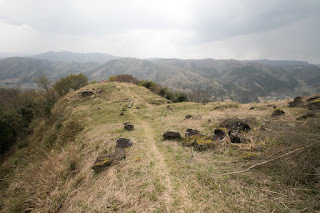 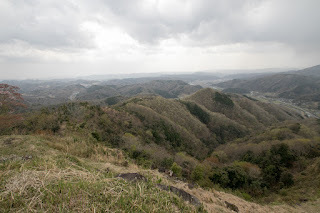 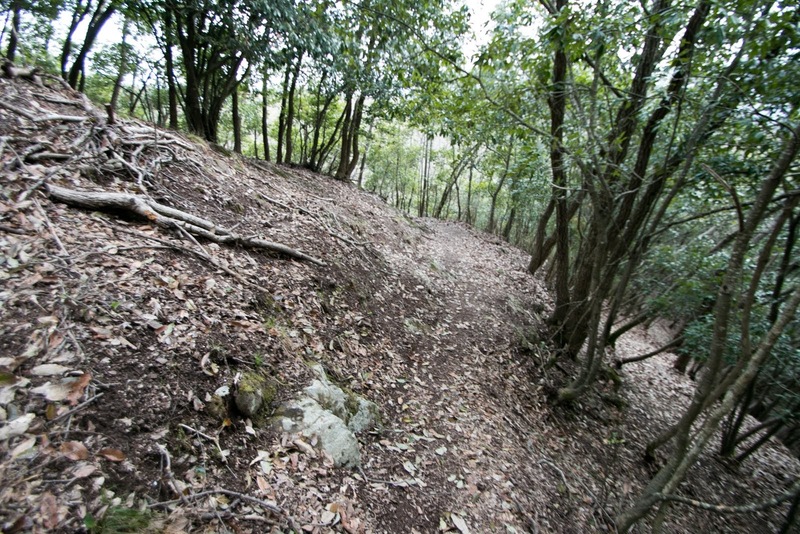 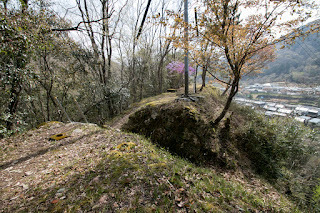 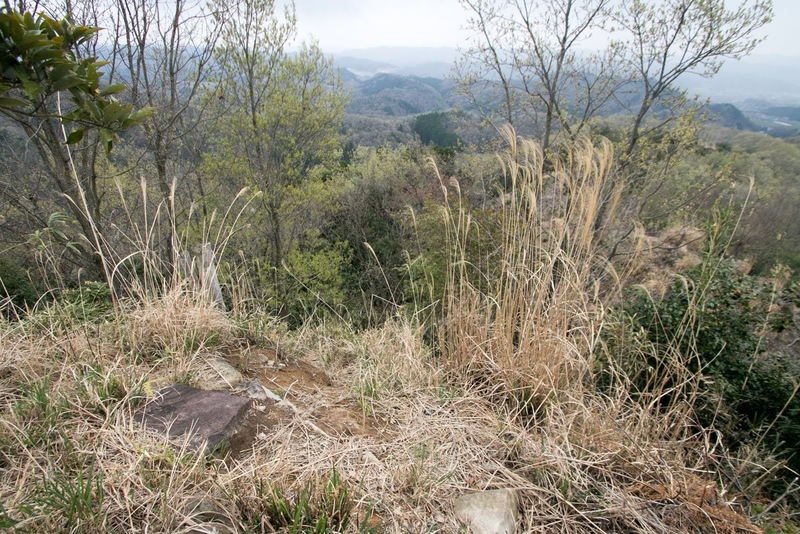 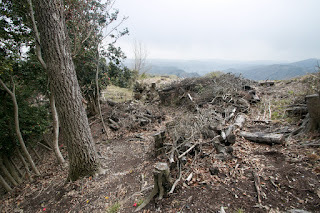 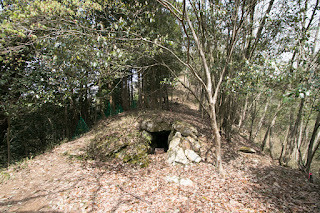 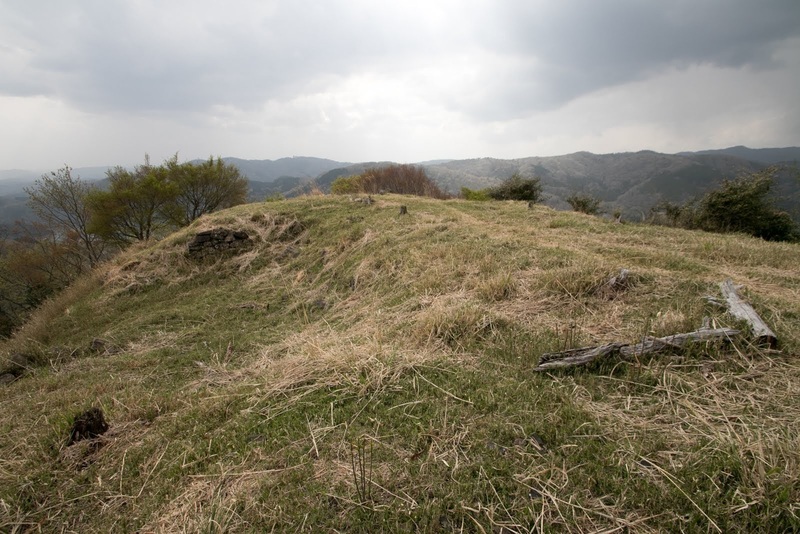 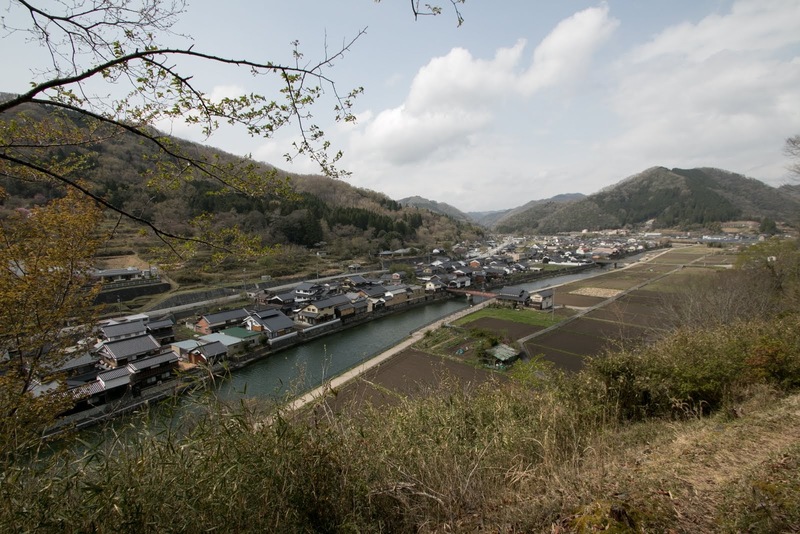 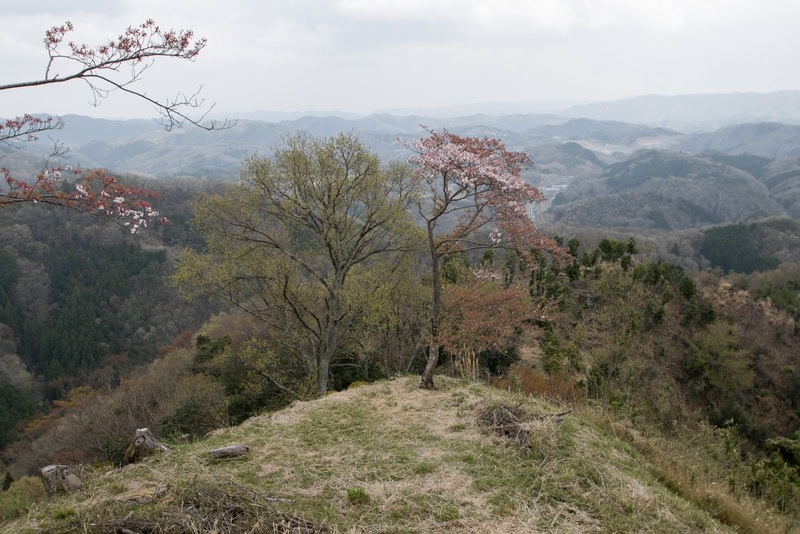 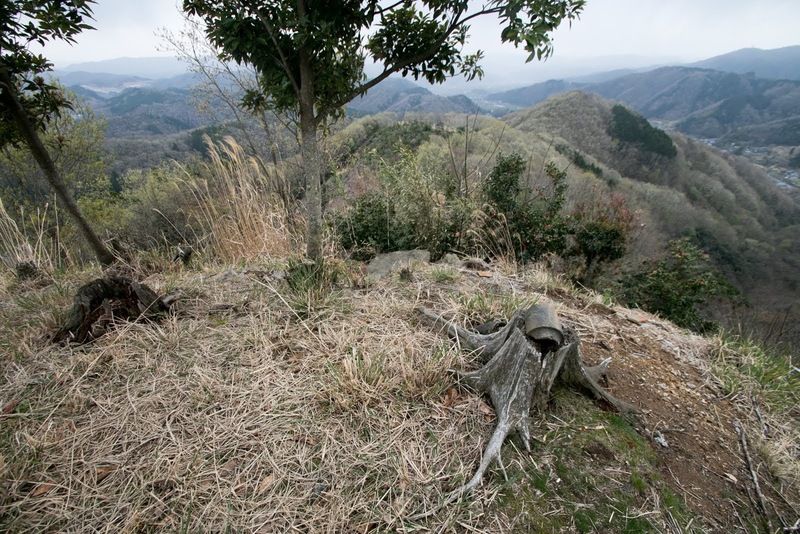 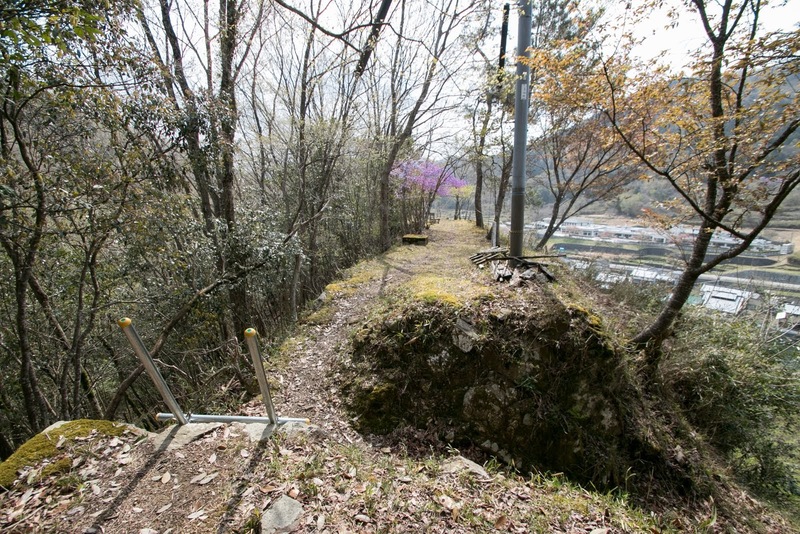 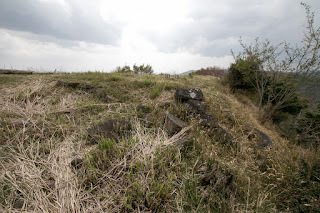 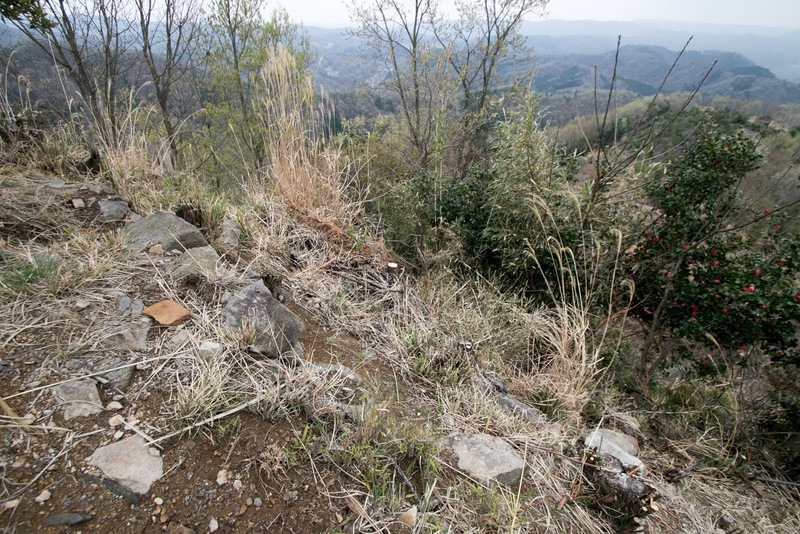 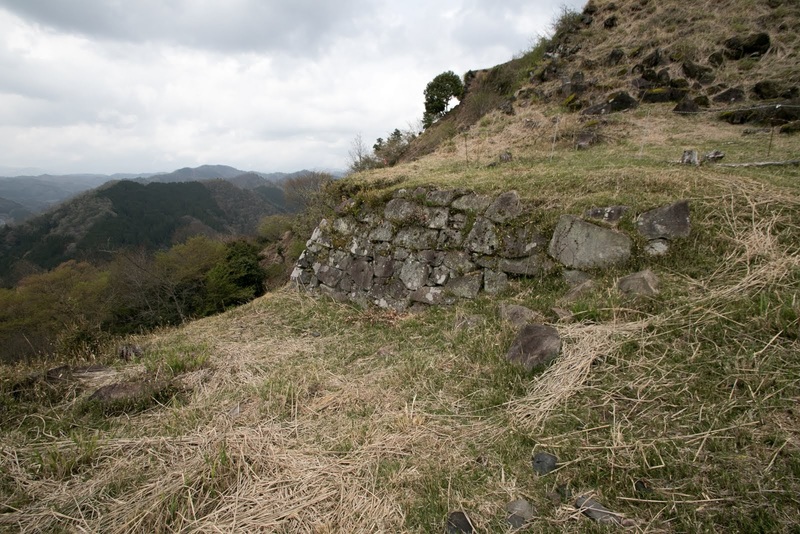 Hideyoshi retreated from Sayo area, and Rikan castle belonged to Ukita clan. 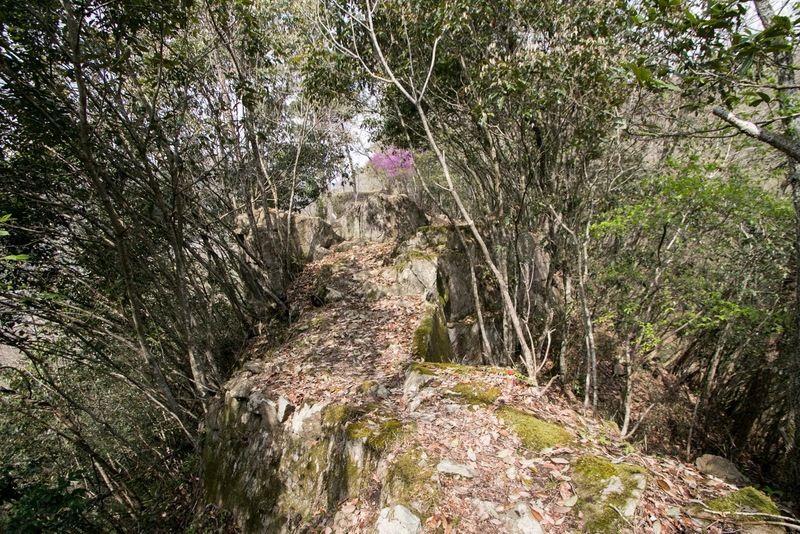 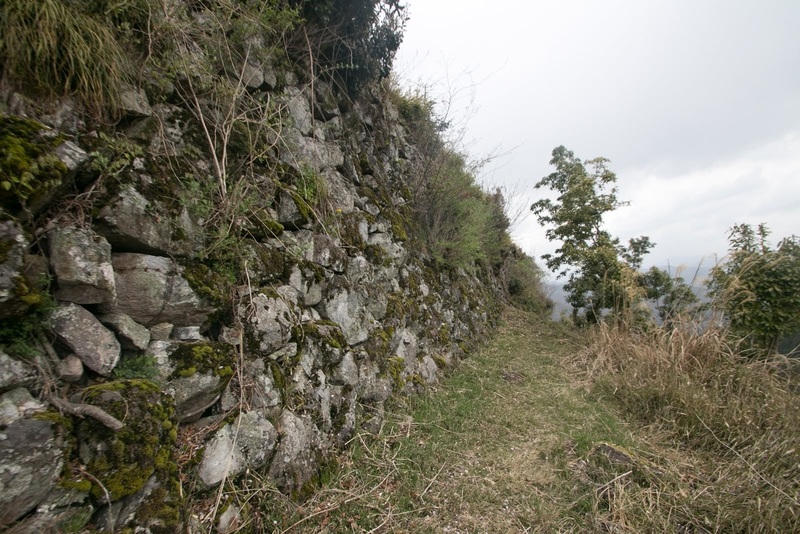 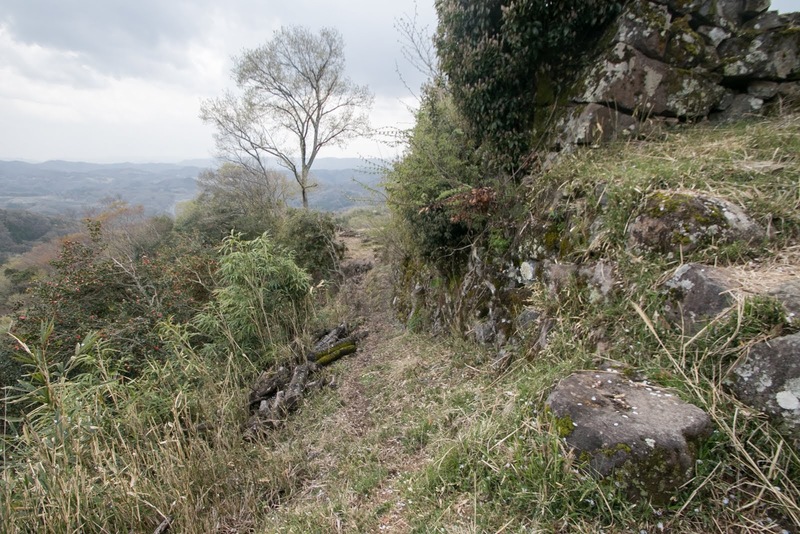 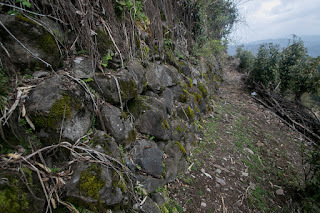 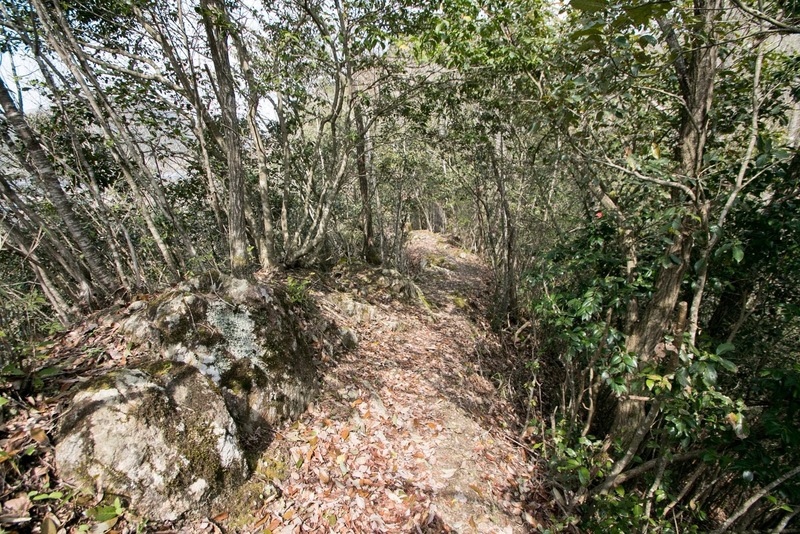 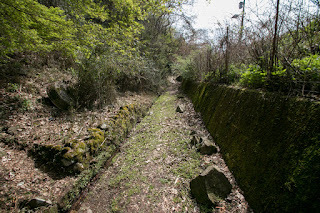 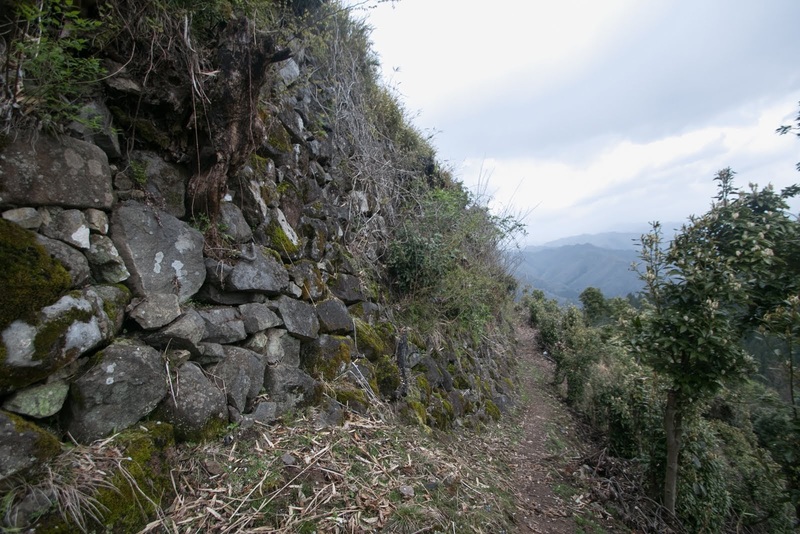 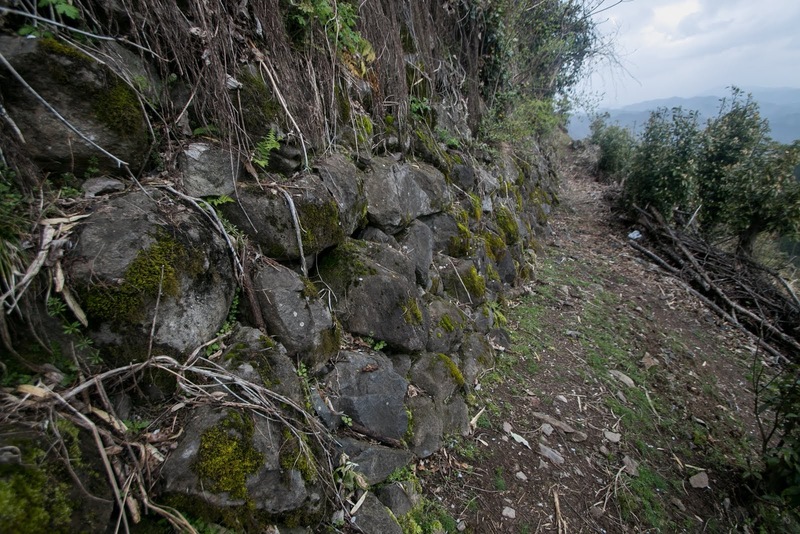 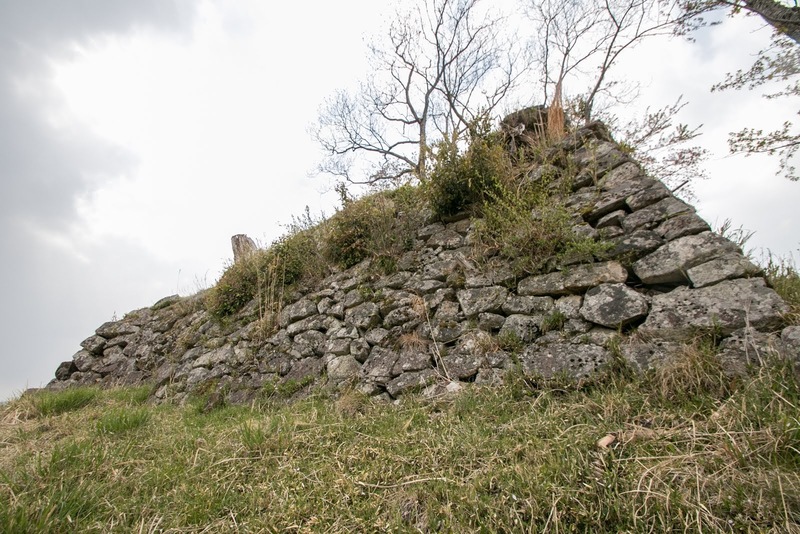 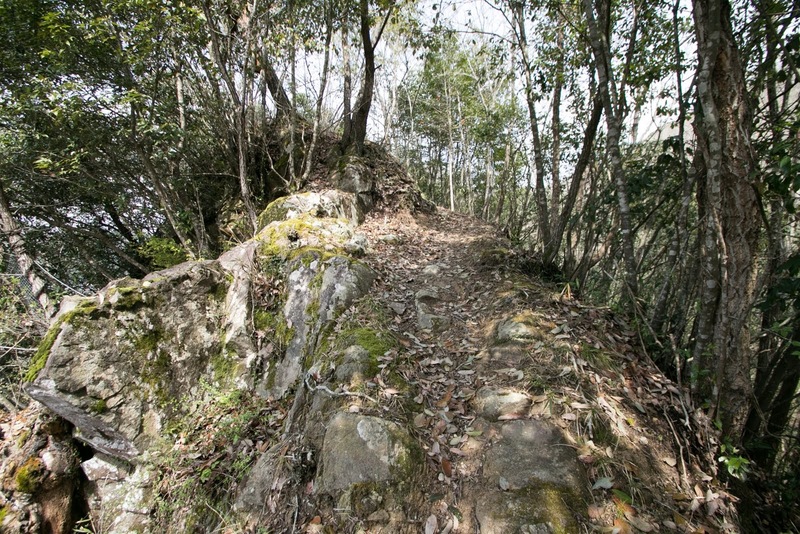 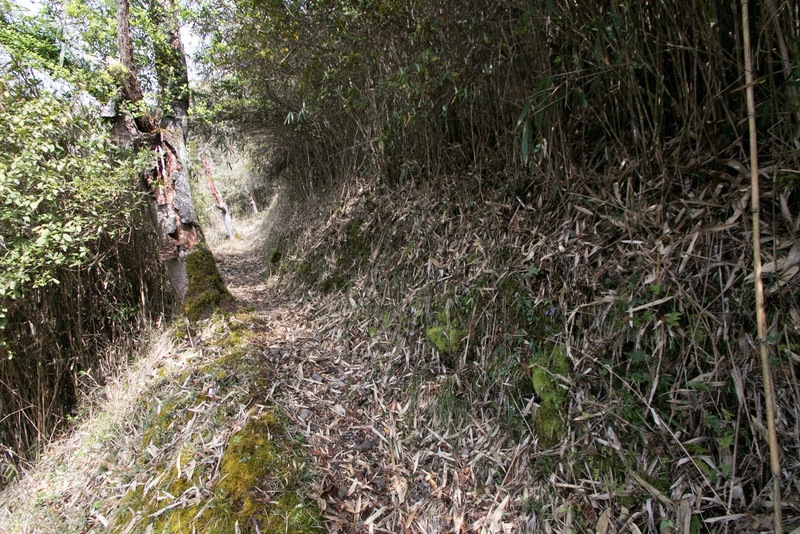 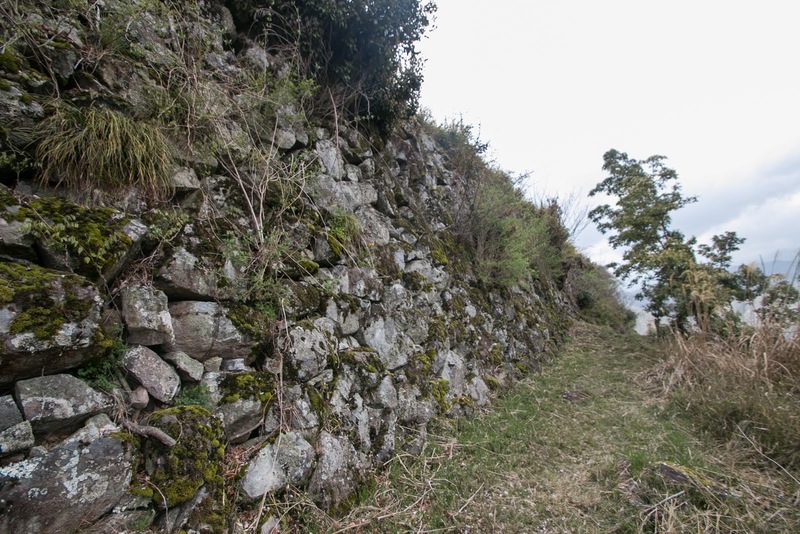 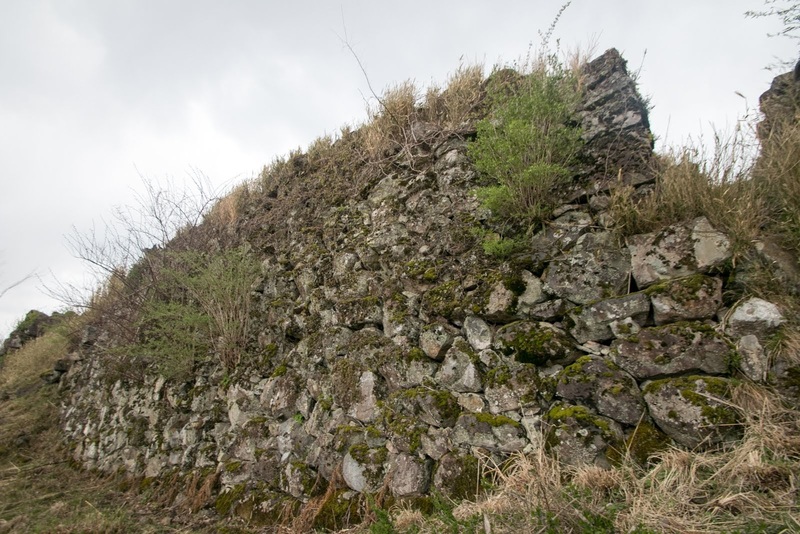 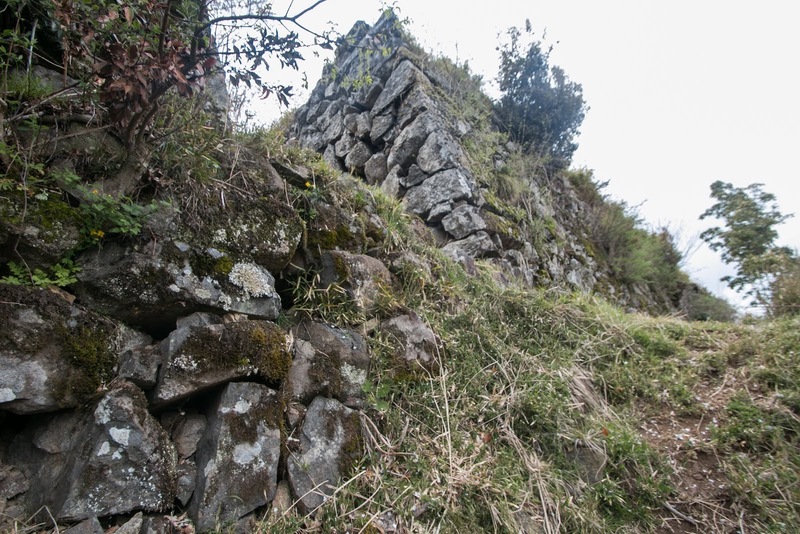 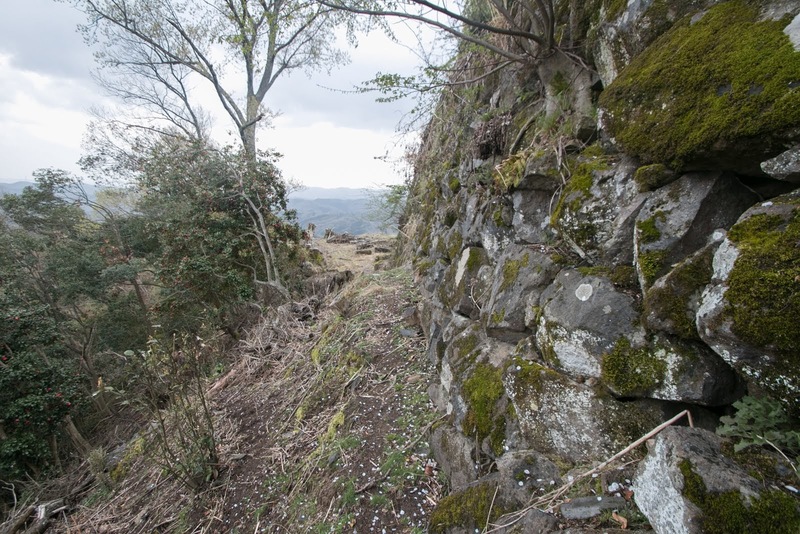 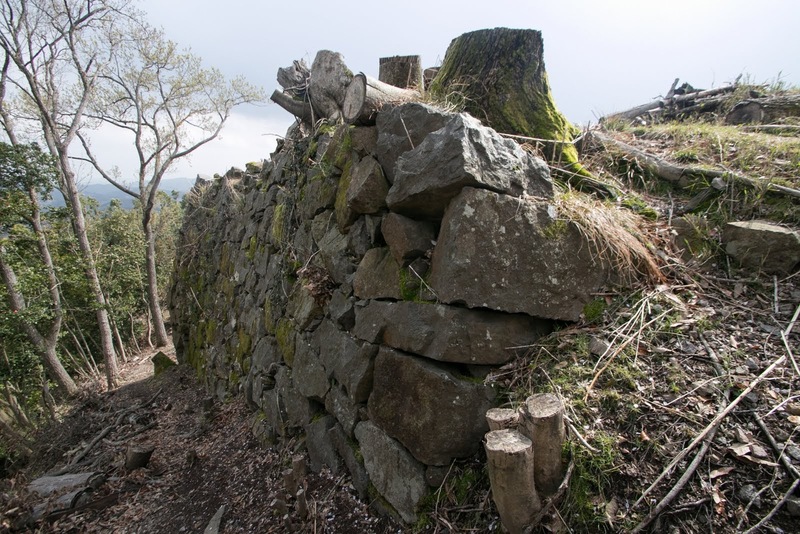 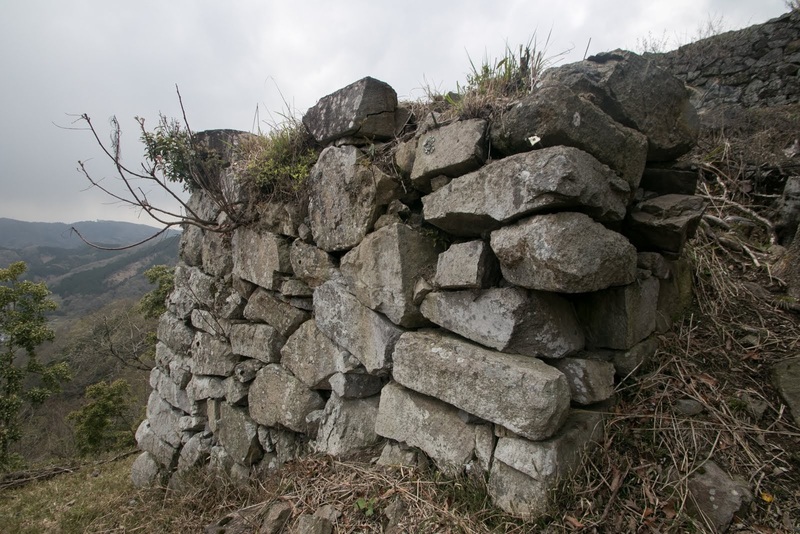 North side wall of central area is a old style stone wall consist of rough small stones, and might be built during this Ukita period. 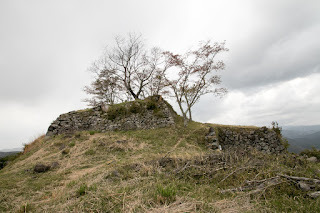 Ukita clan held Rikan castle by 1600, but as a result of battle of Sekigahara at that year, Ukita clan lost their territory and was expelled.After Ukita clan, Rikan castle was held by Terumasa Ikeda (1565-1615) who became the lord of Harima province at Himeji castle. 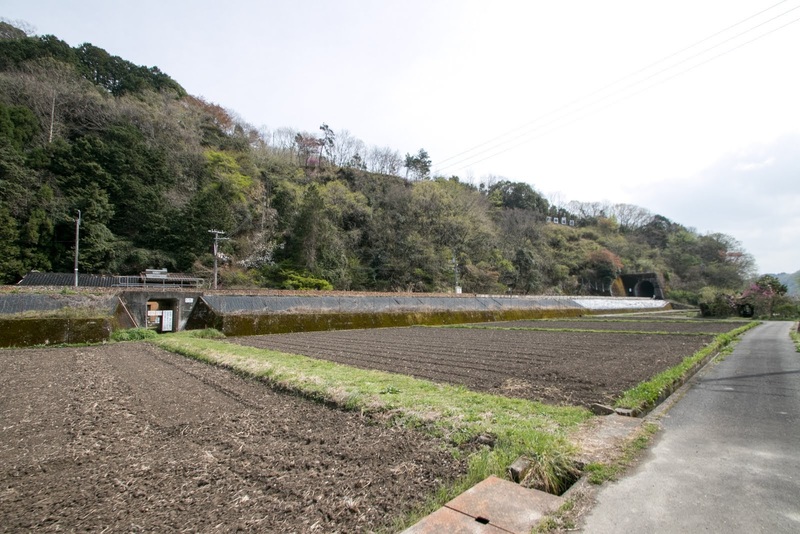 To protect this important place of communication, Terumasa placed his uncle Yoshiyuki Ikeda (1577-1618), as a commander of the castle. 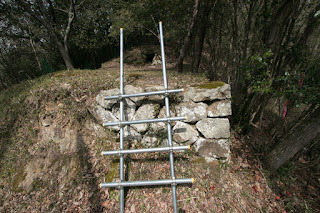 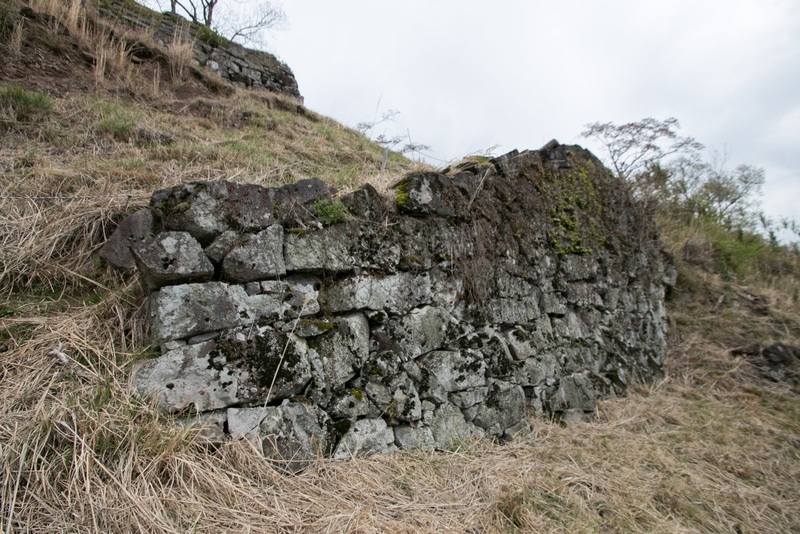 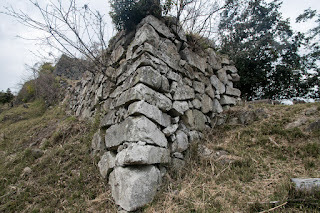 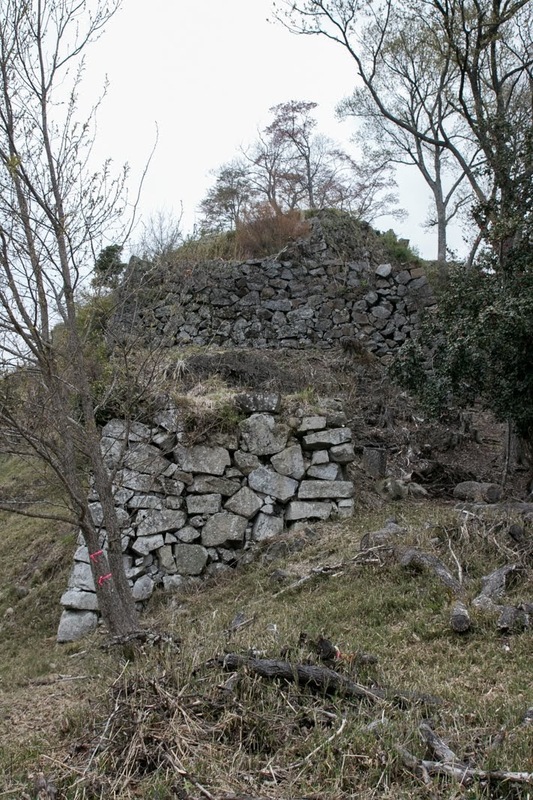 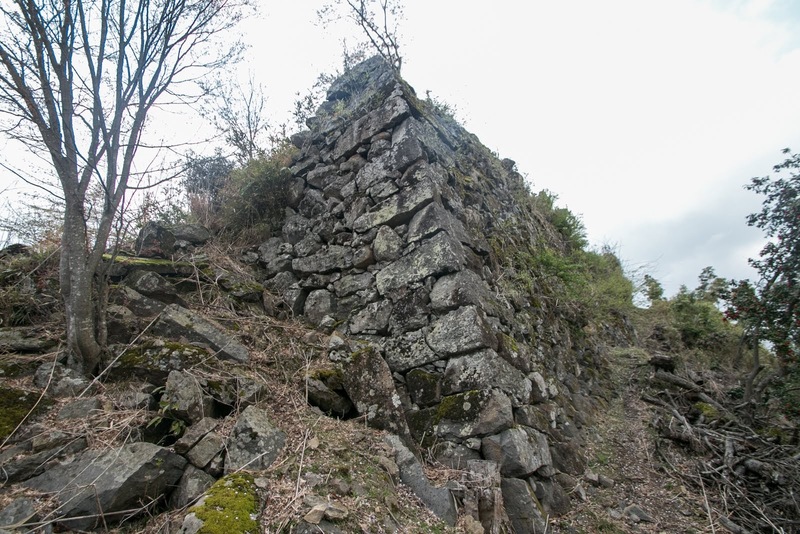 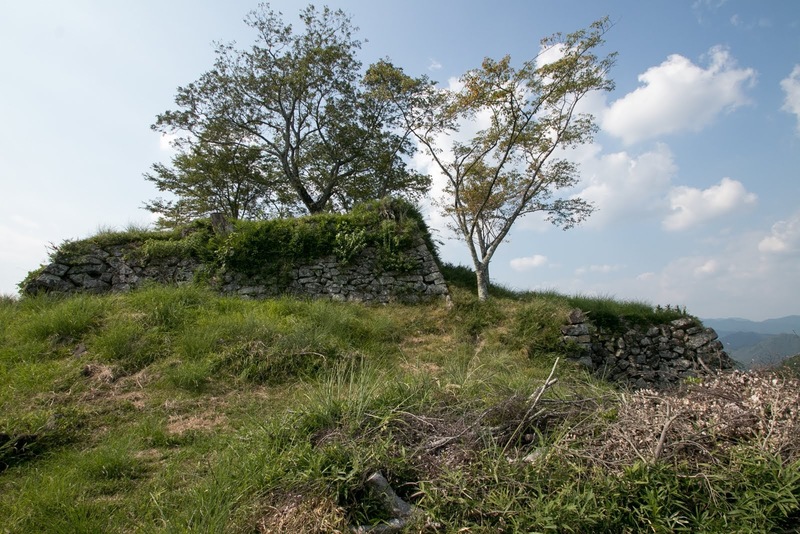 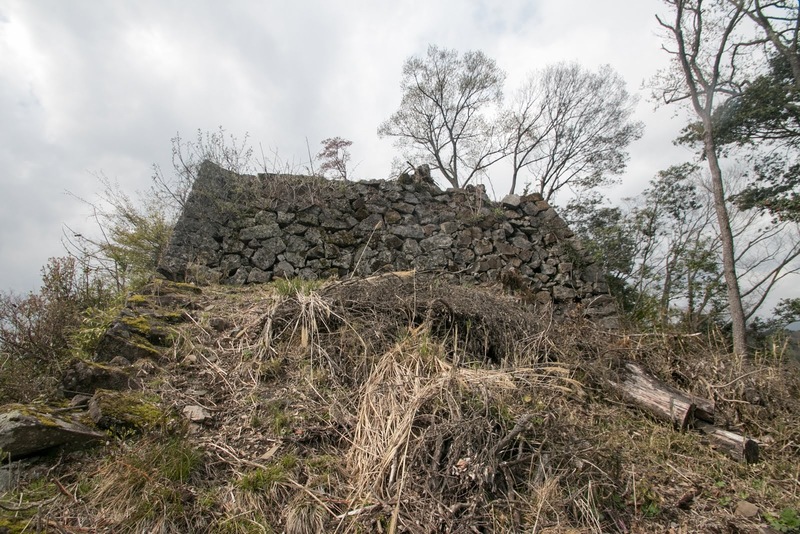 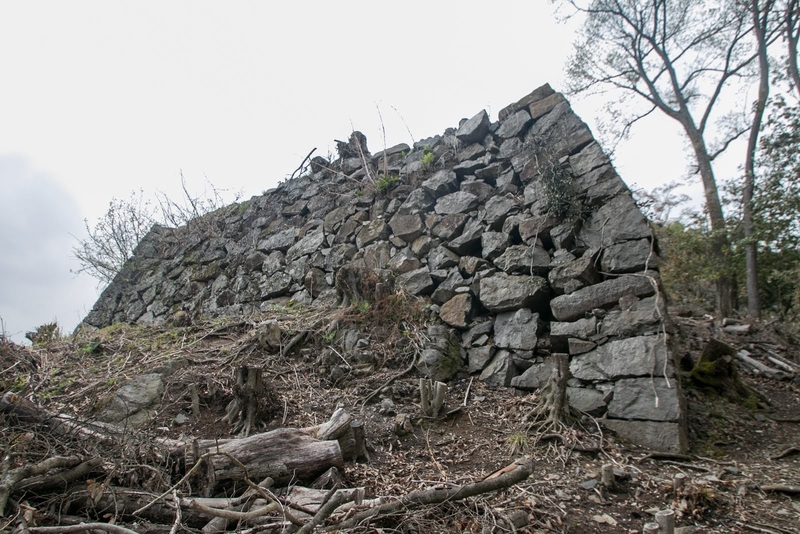 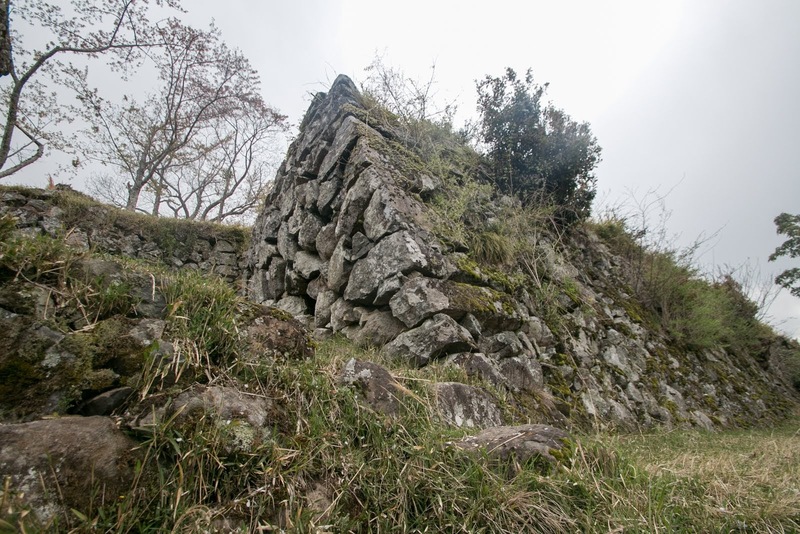 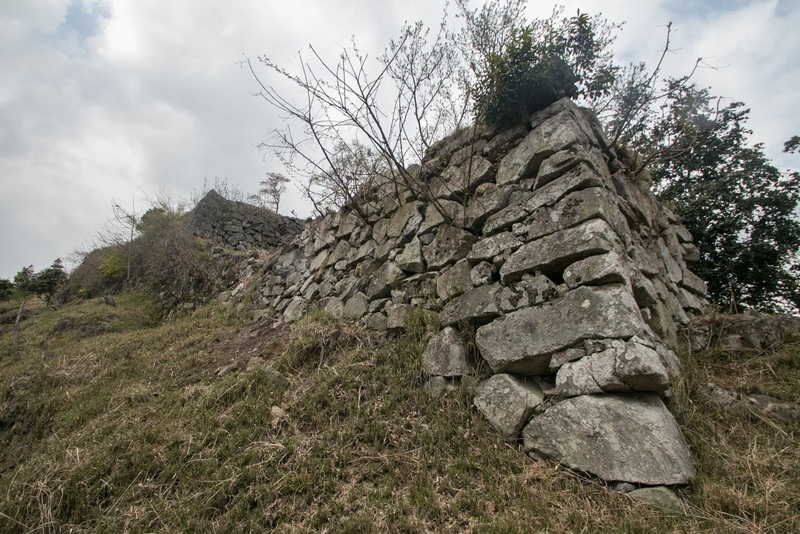 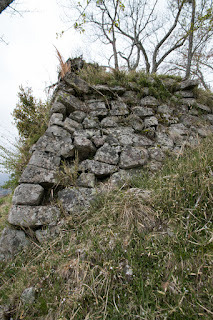 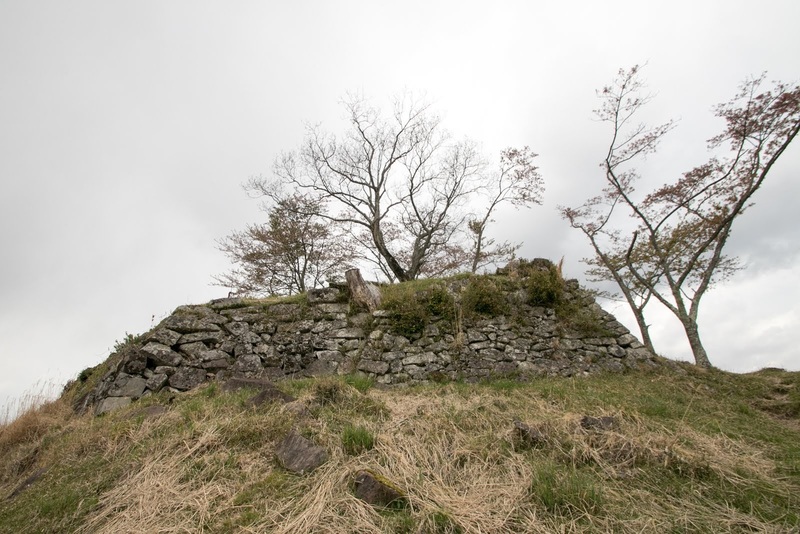 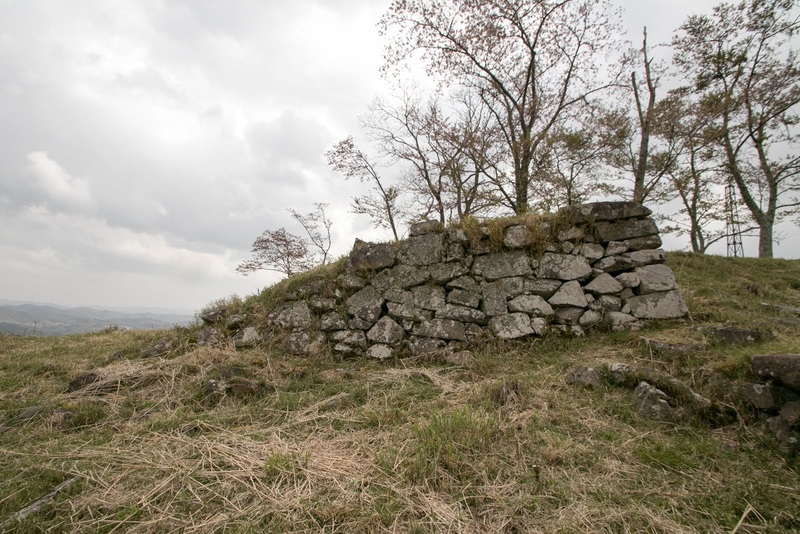 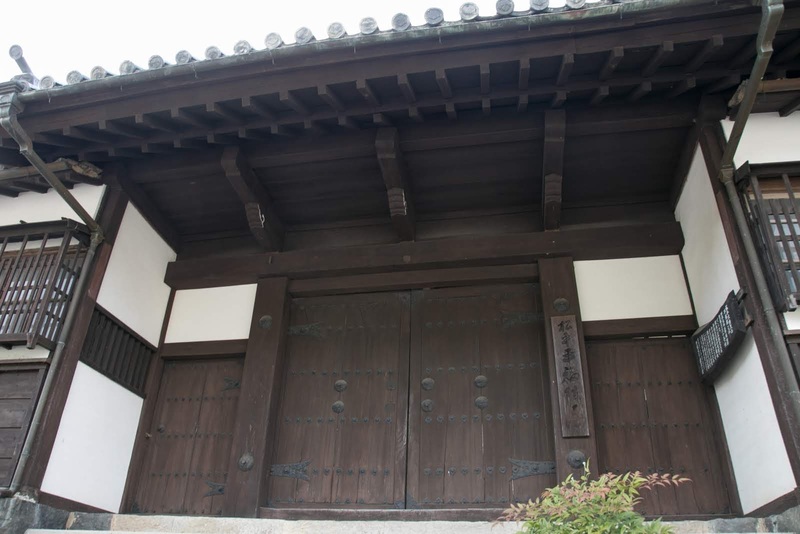 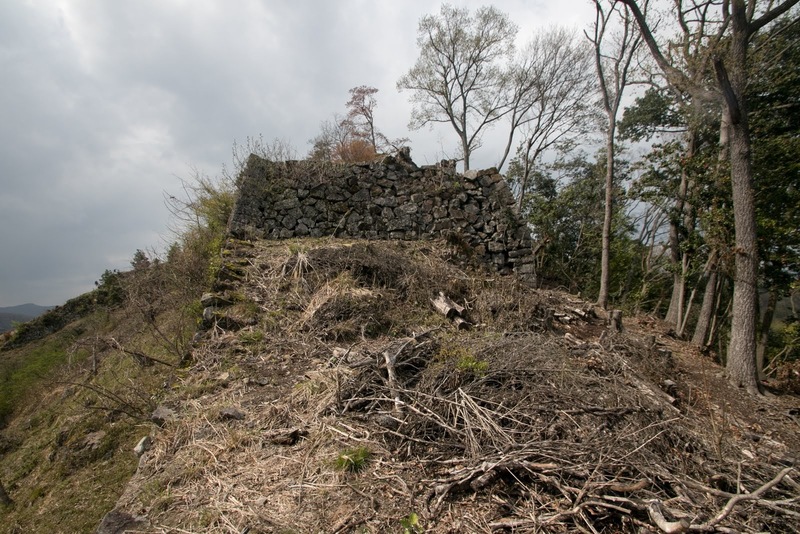 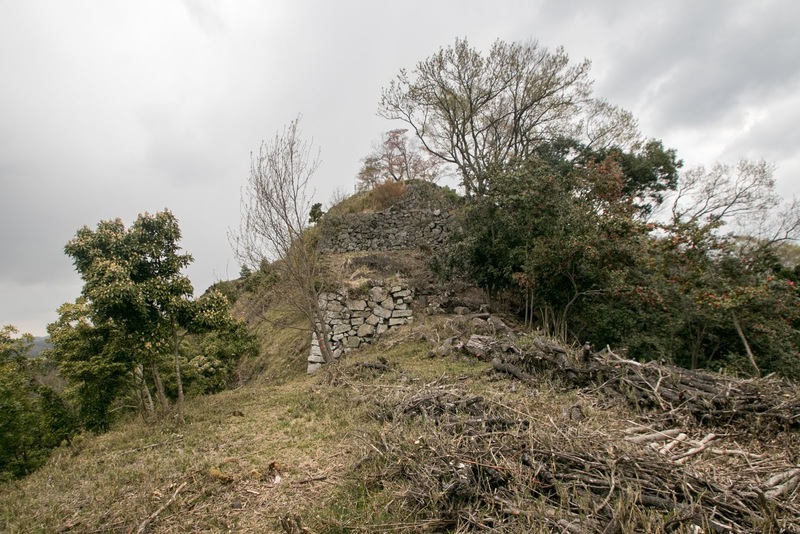 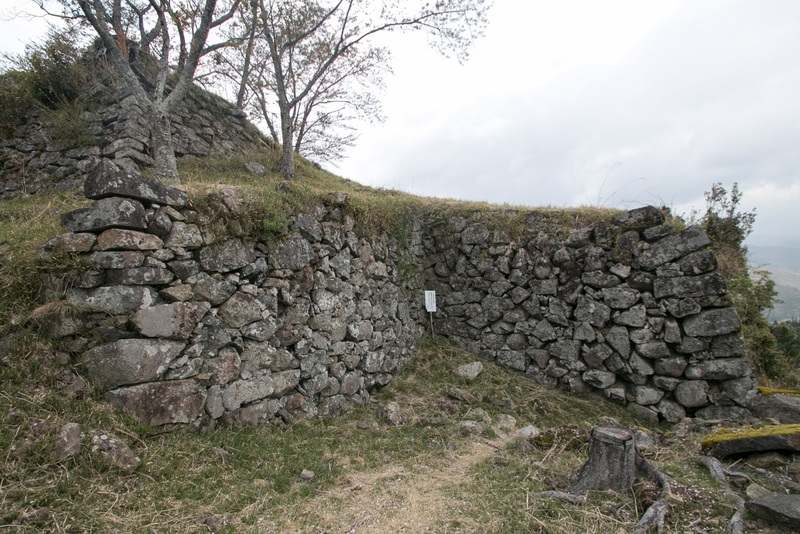 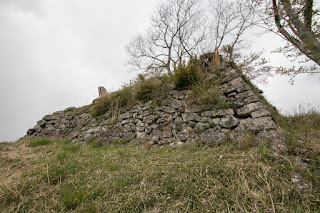 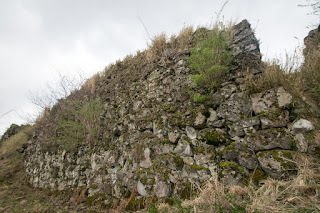 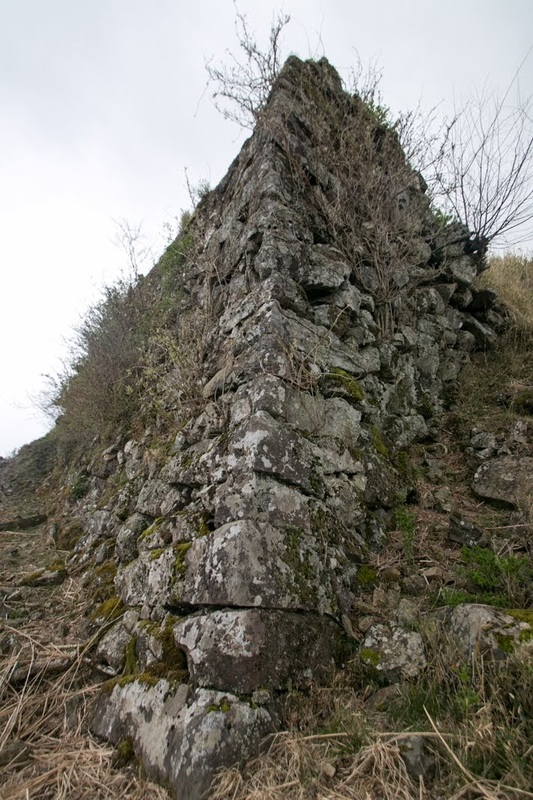 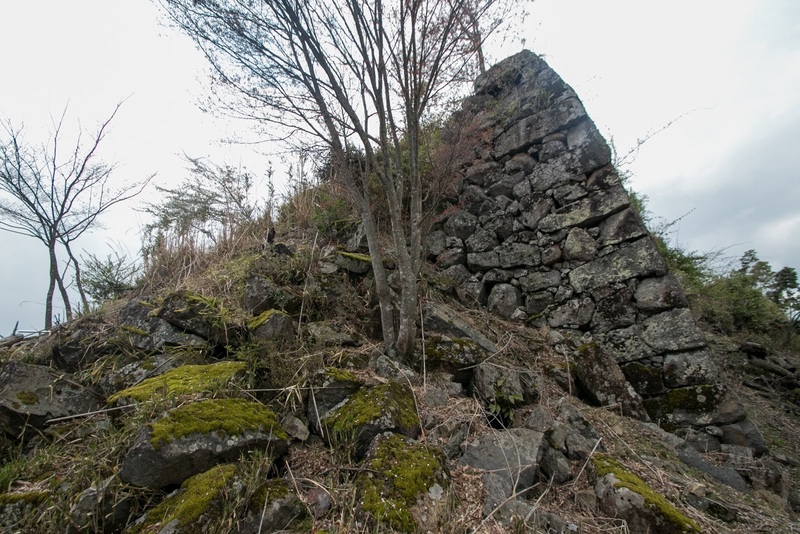 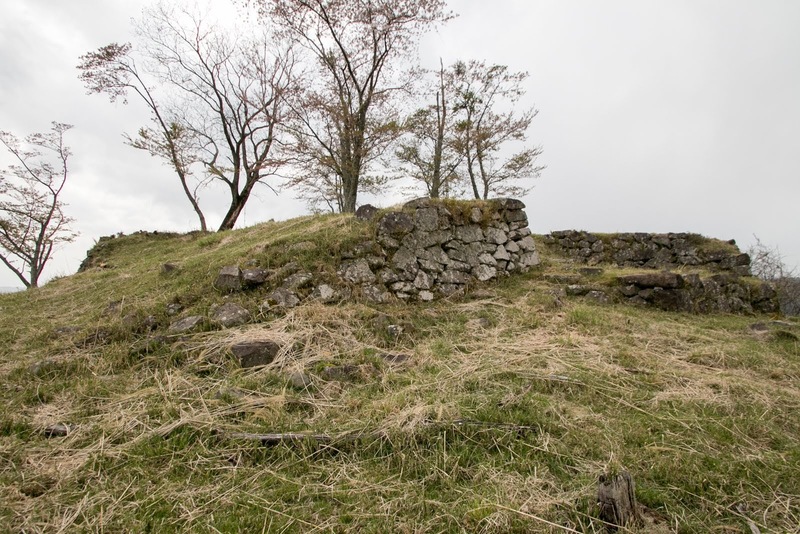 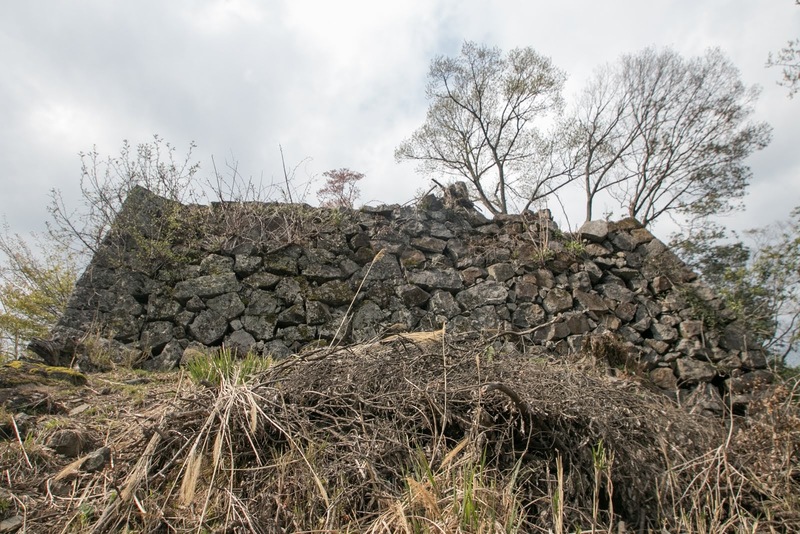 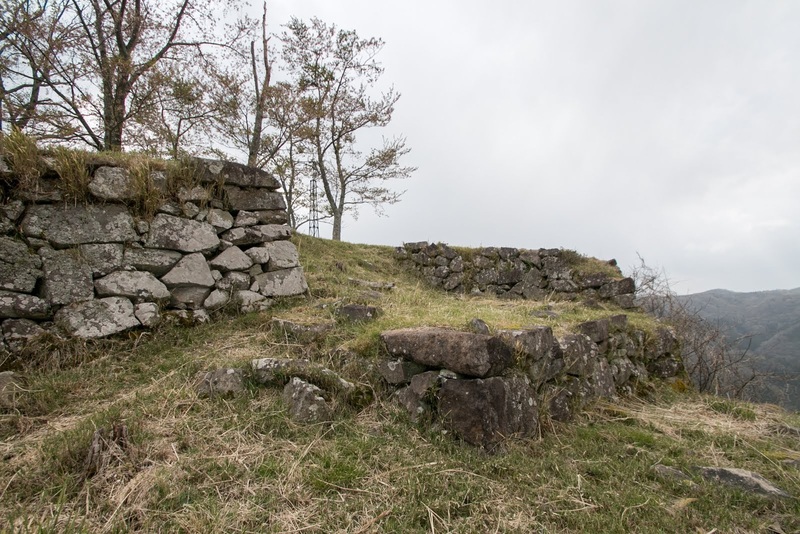 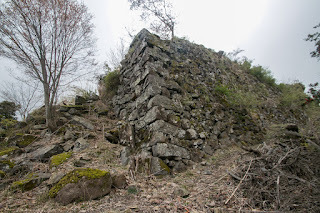 Yoshiyuki renovated Rikan castle into a modern one equipped stone walls. 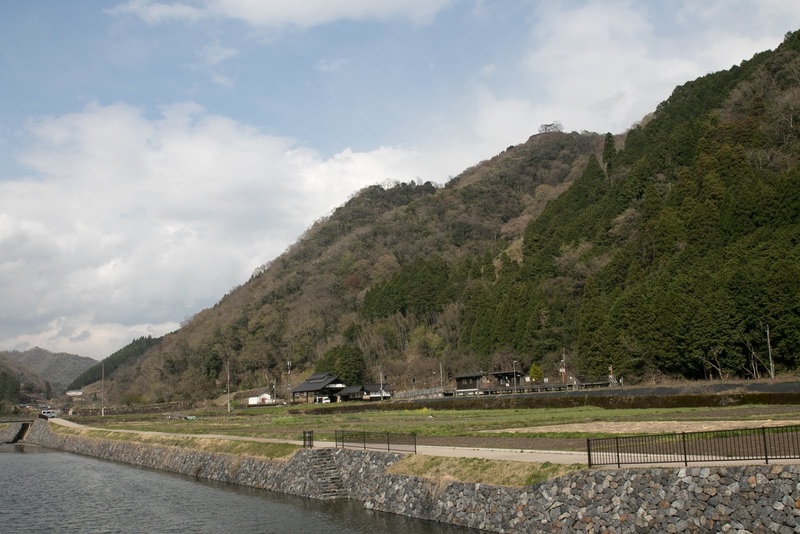 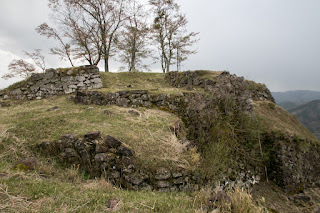 Rikan castle is built at a long ridge continues from northeast to southwest along with Sayogawa river. Main tower area locates at the peak of the mountain and is said that there was a three story main tower. Central area exists at northeast of main tower area and guarded by stone walls because this area is directly connected to backside mountains. 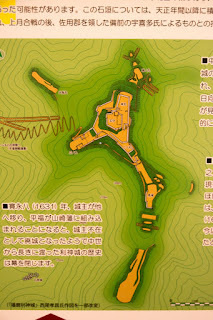 Corridor area surrounds main tower area and central area. 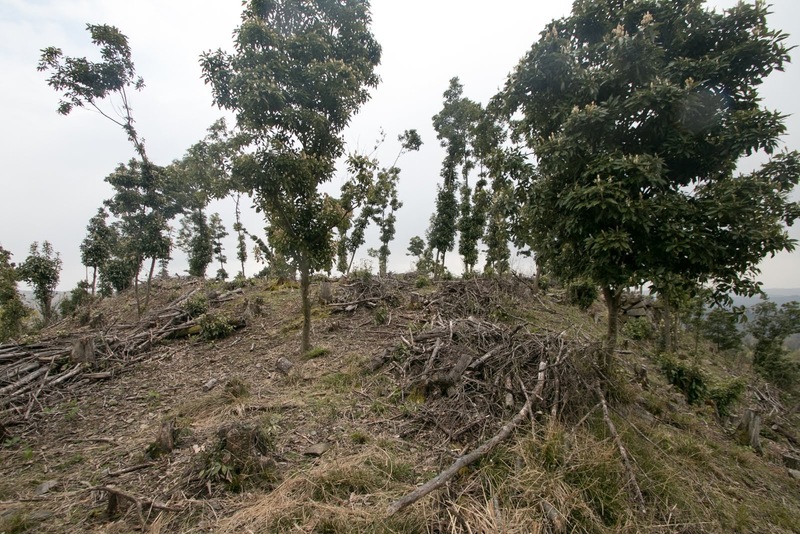 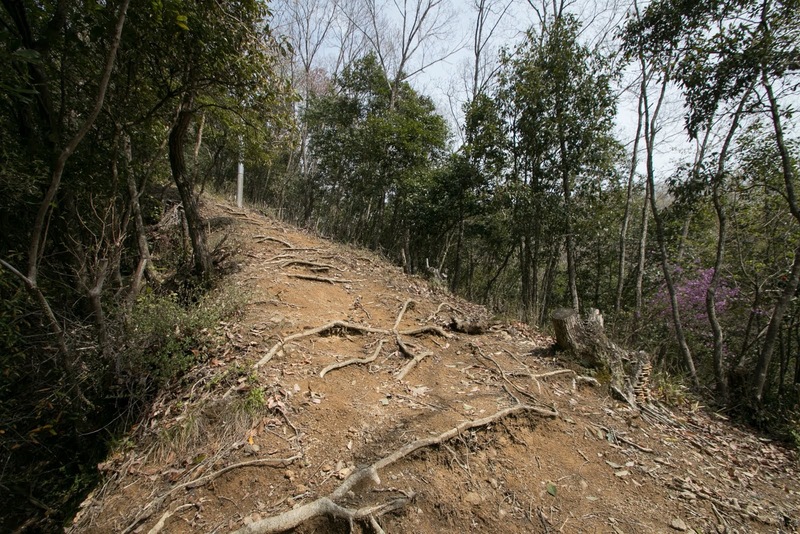 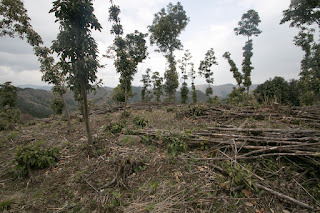 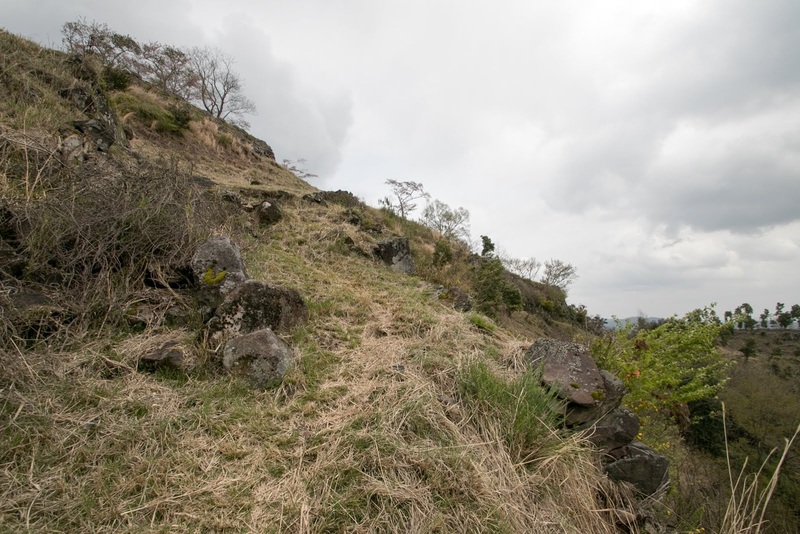 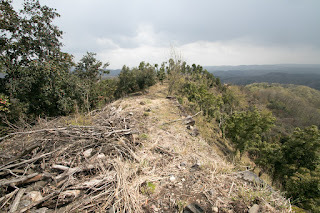 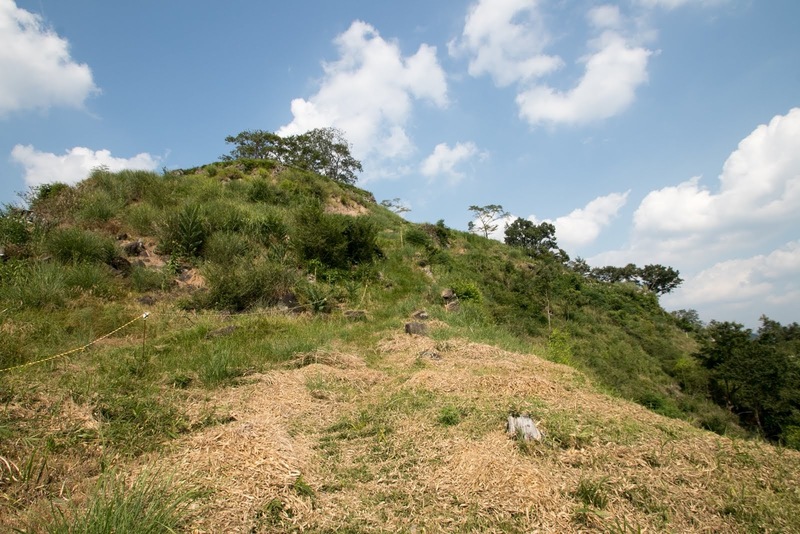 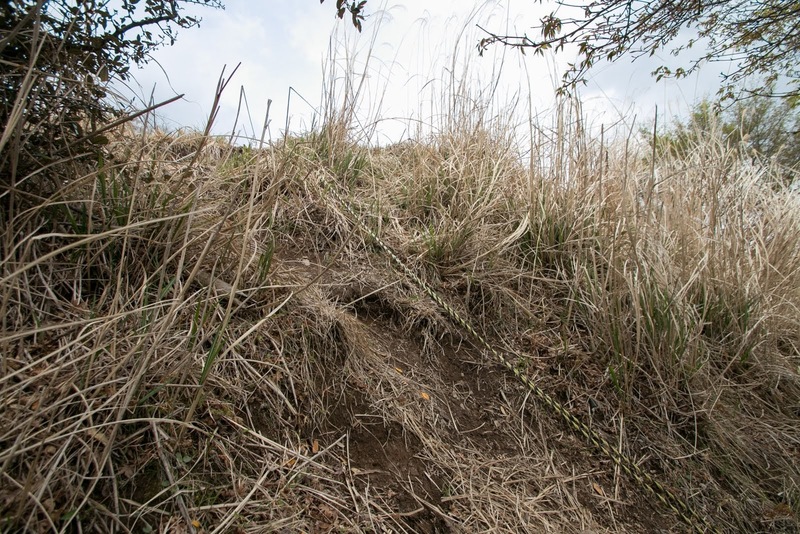 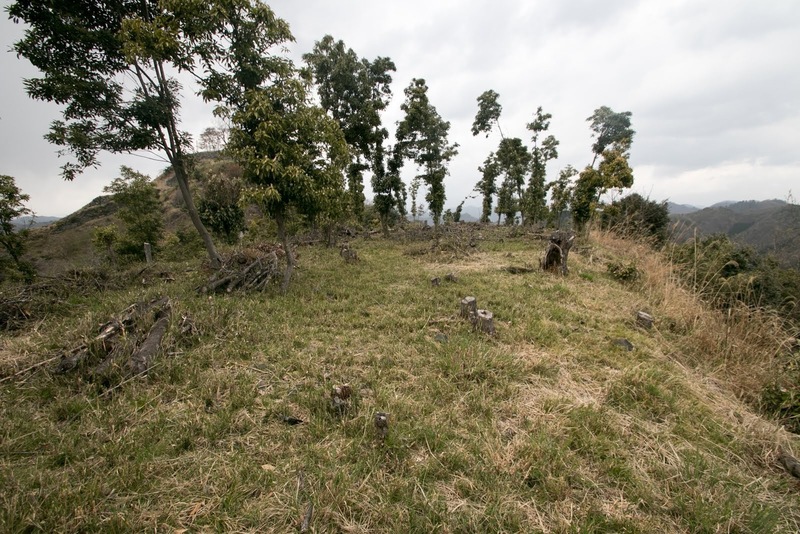 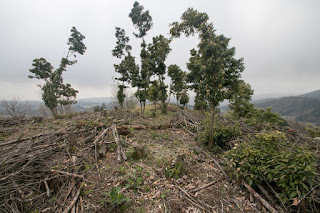 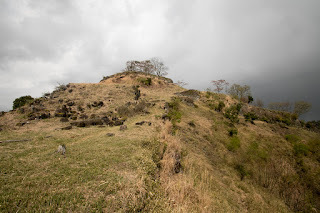 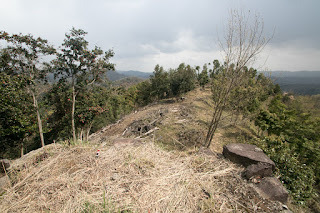 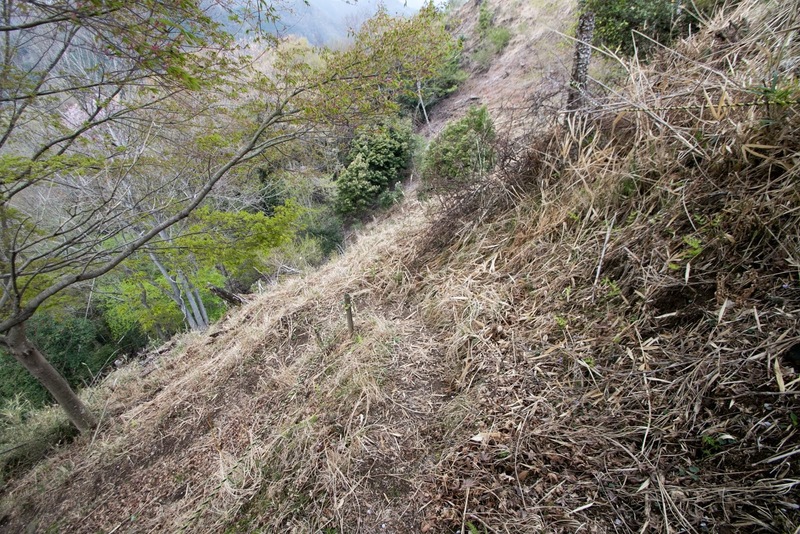 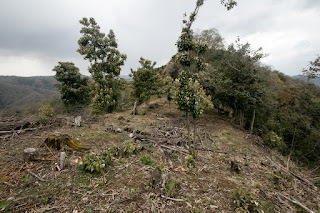 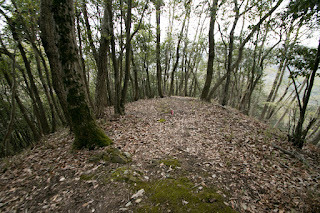 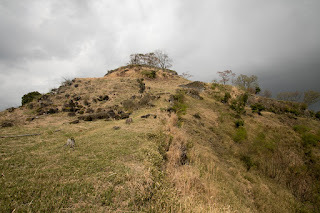 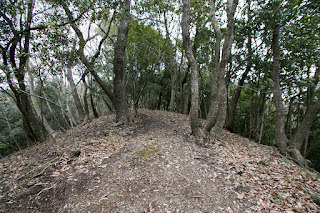 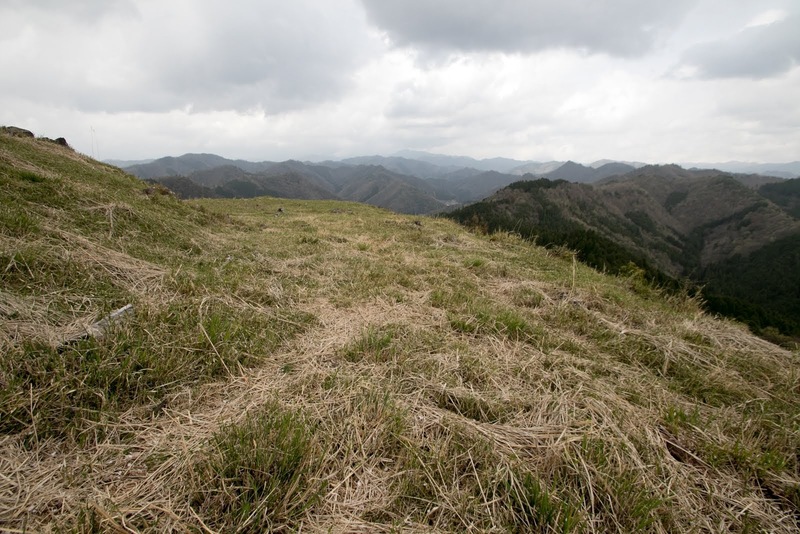 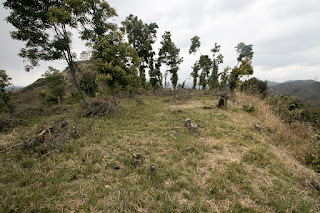 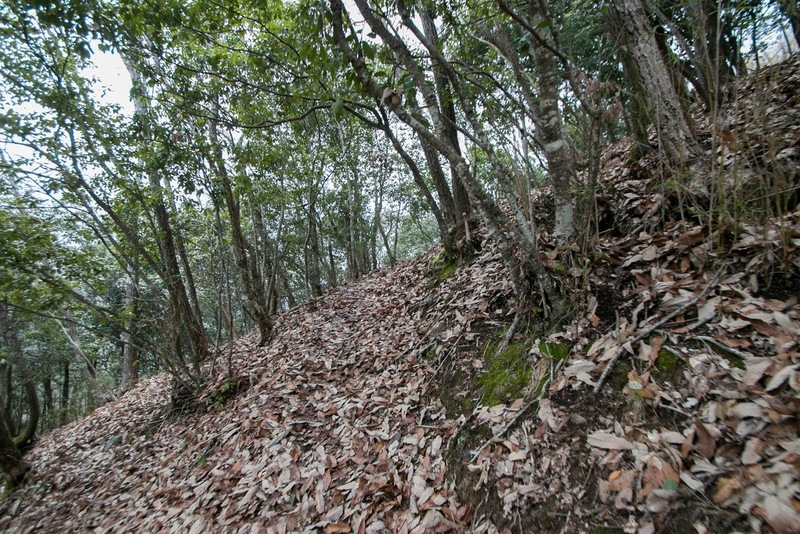 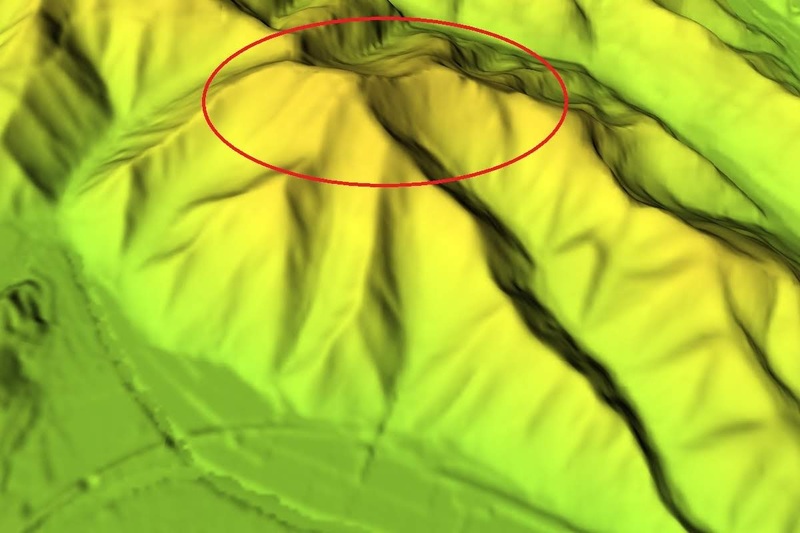 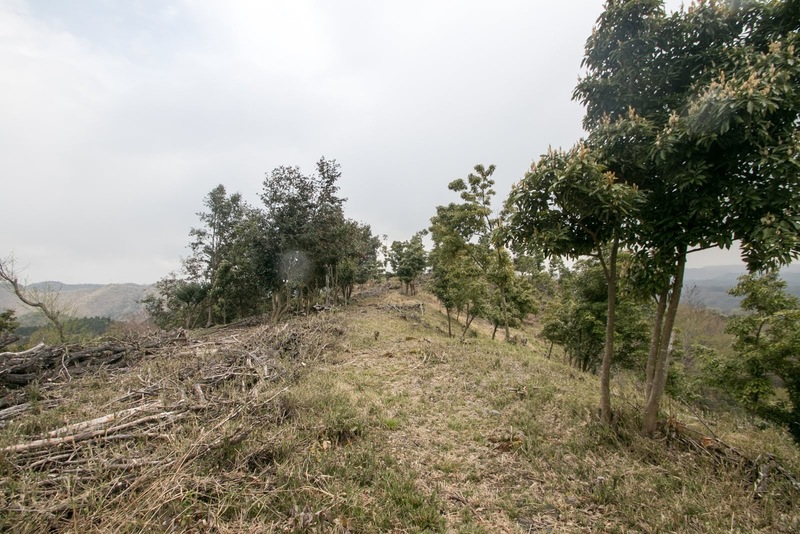 Secondary area spreads over main ridge toward southward, and ahead of secondary area there is another long and narrow area called as “Baba” (riding place). 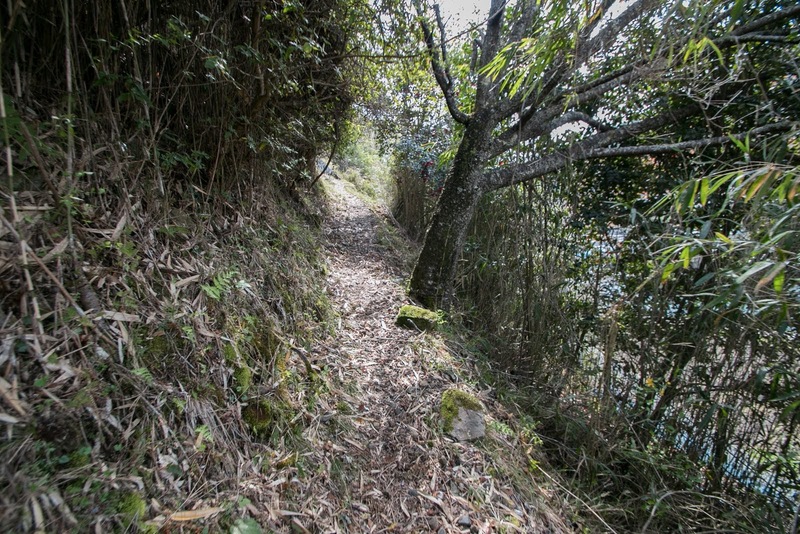 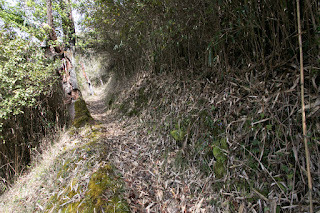 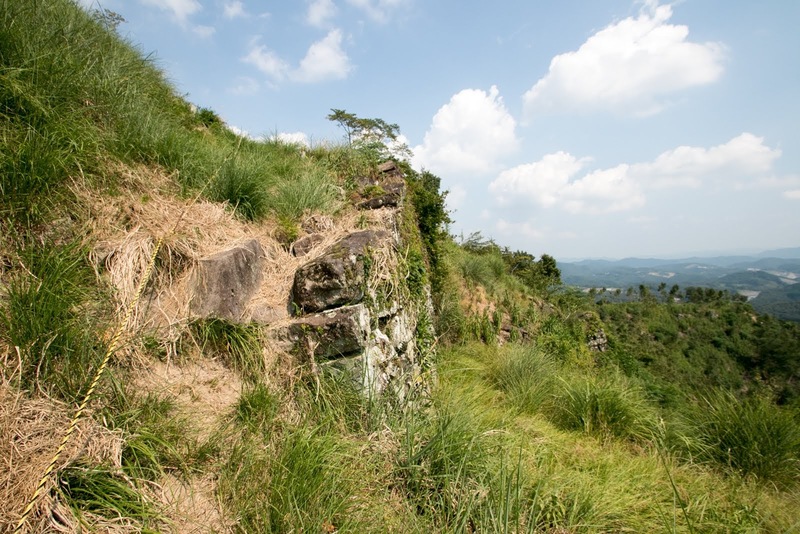 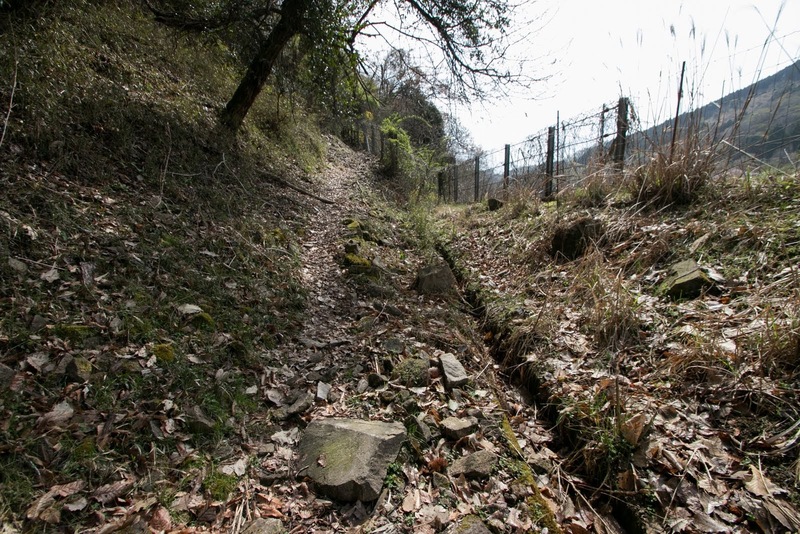 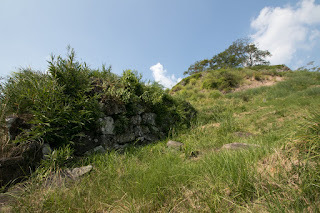 South edge of Baba area is guarded by deep dry moat and sheer cliff protected by stone walls. 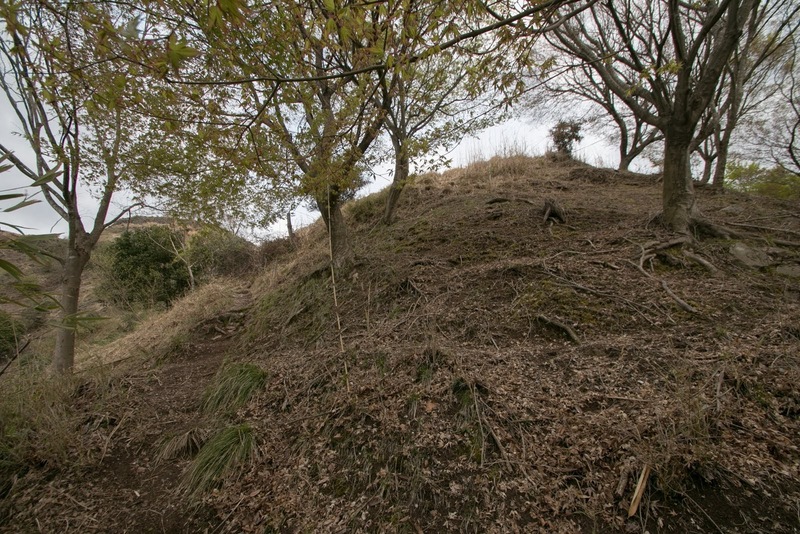 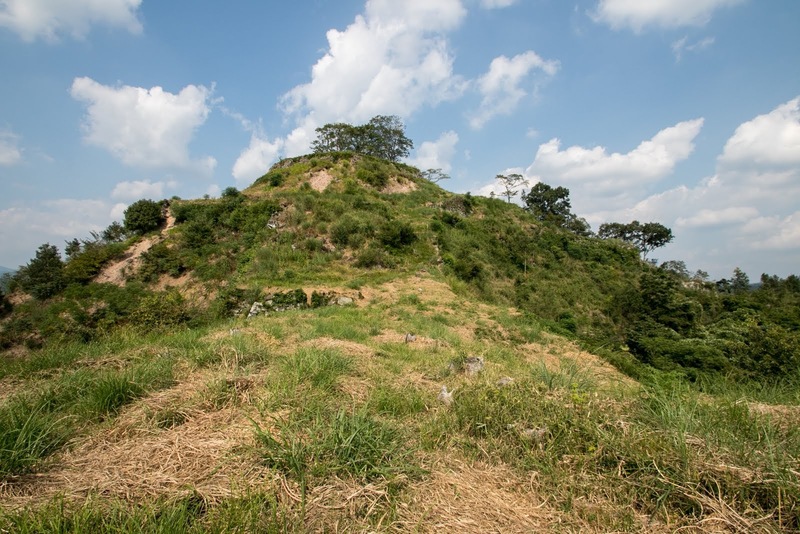 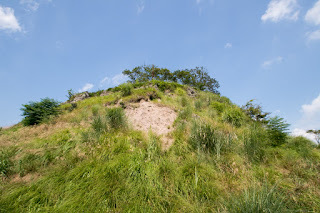 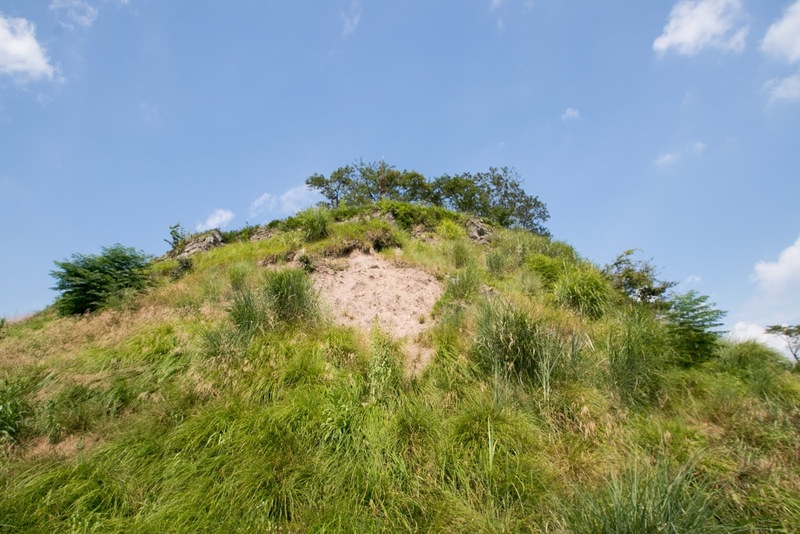 At southwest of main tower area there is another short peak, and is used as third area. 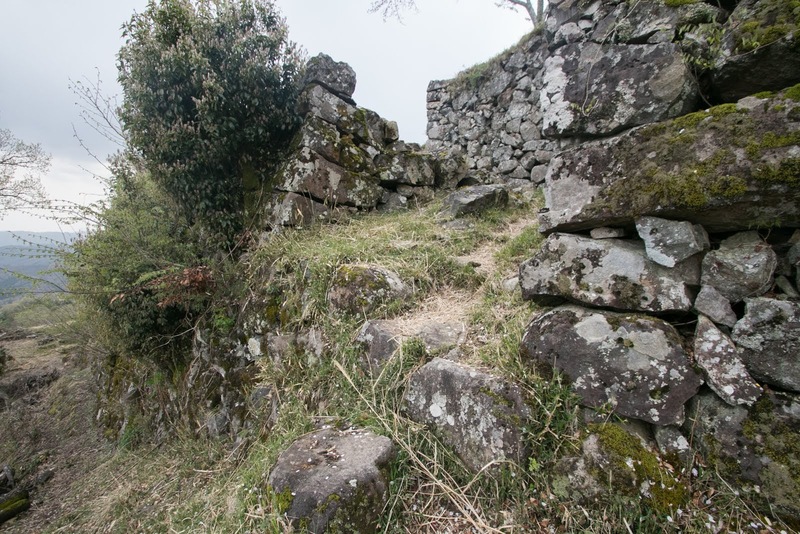 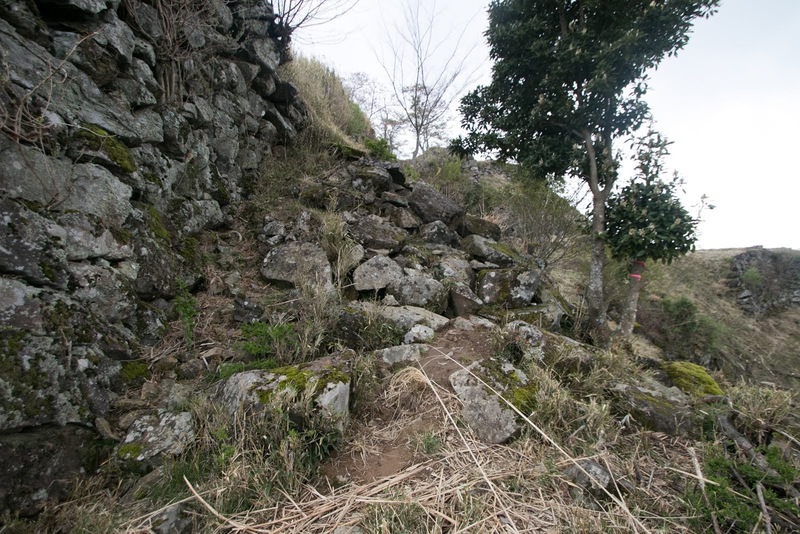 As this direction faces to castle town, third area is also protected by tall stone walls and combined gates, and used as a main route from hillside. 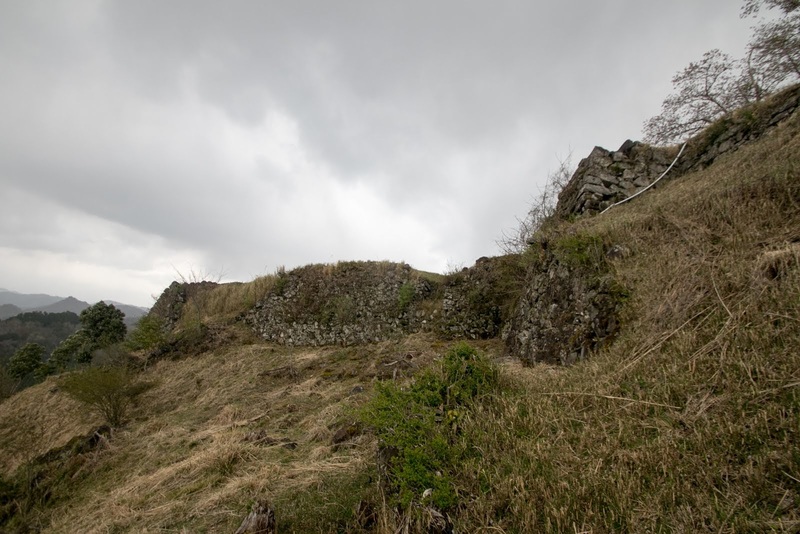 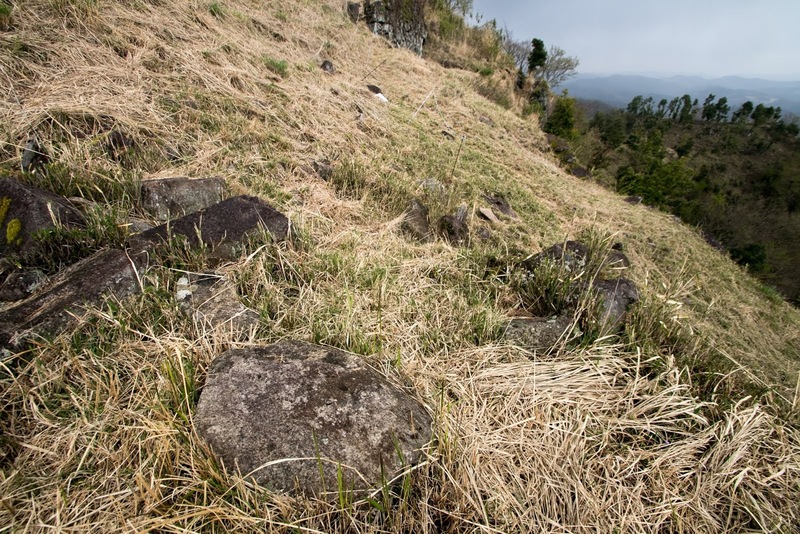 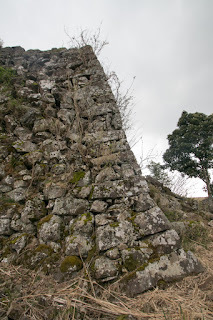 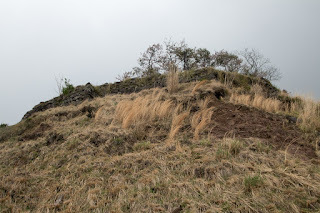 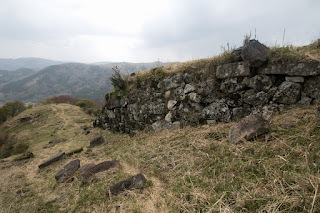 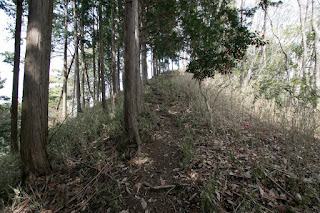 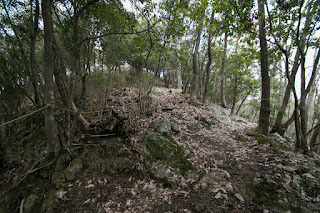 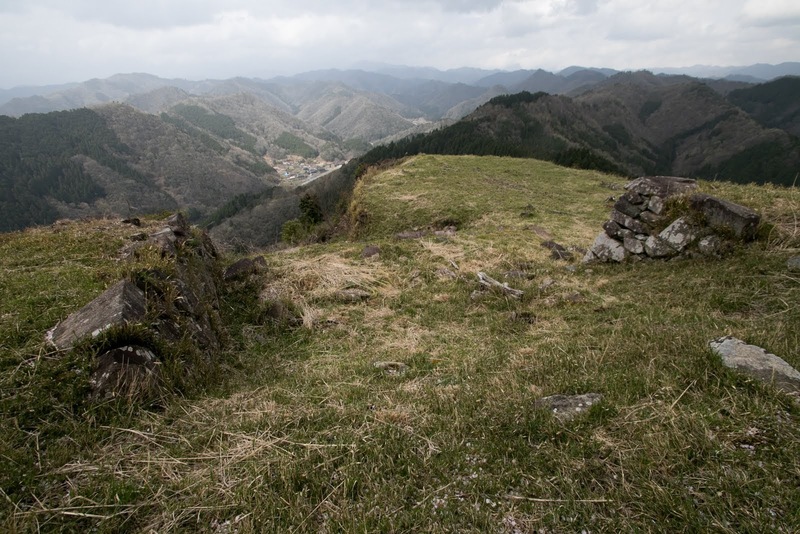 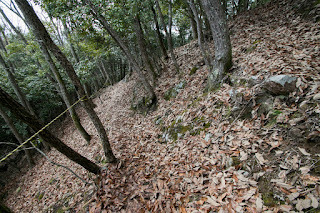 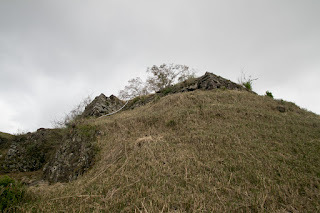 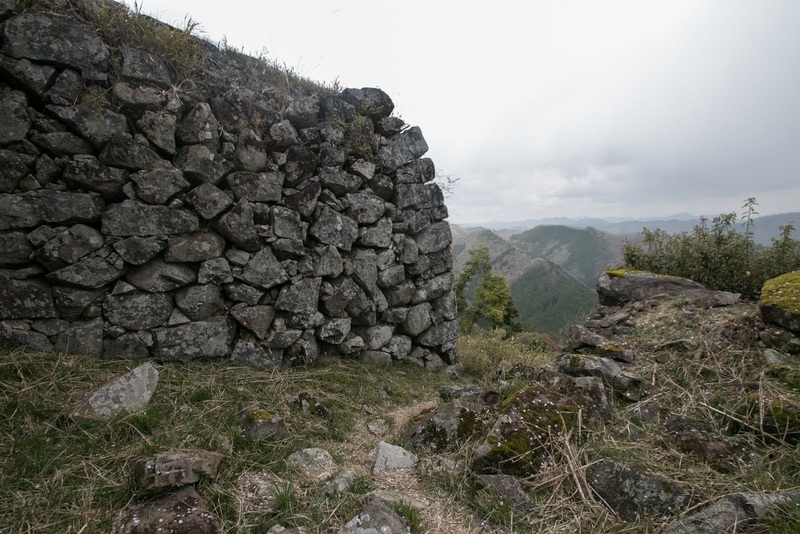 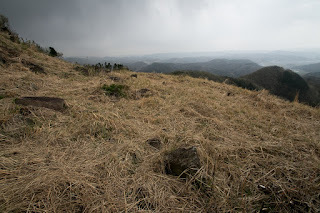 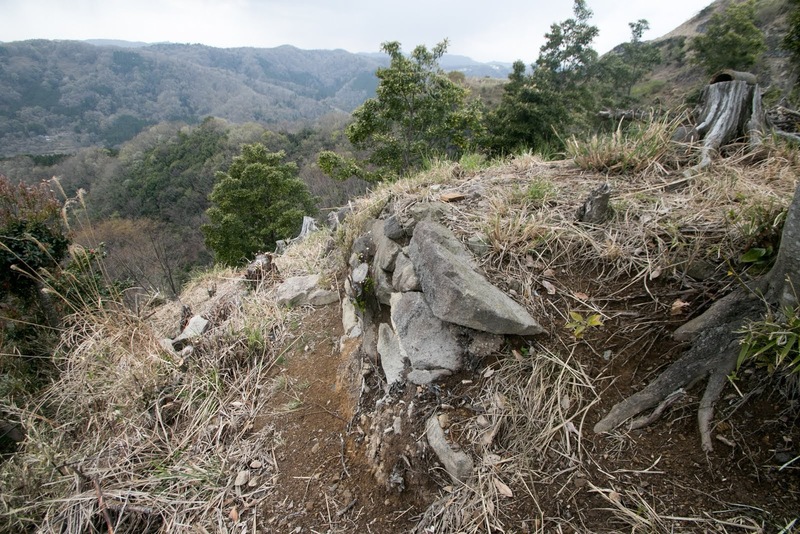 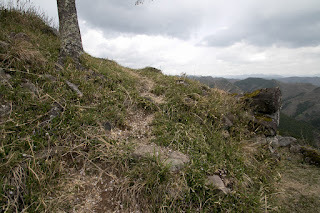 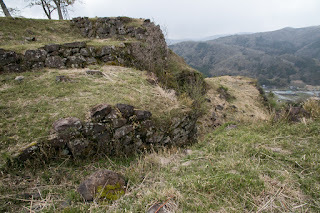 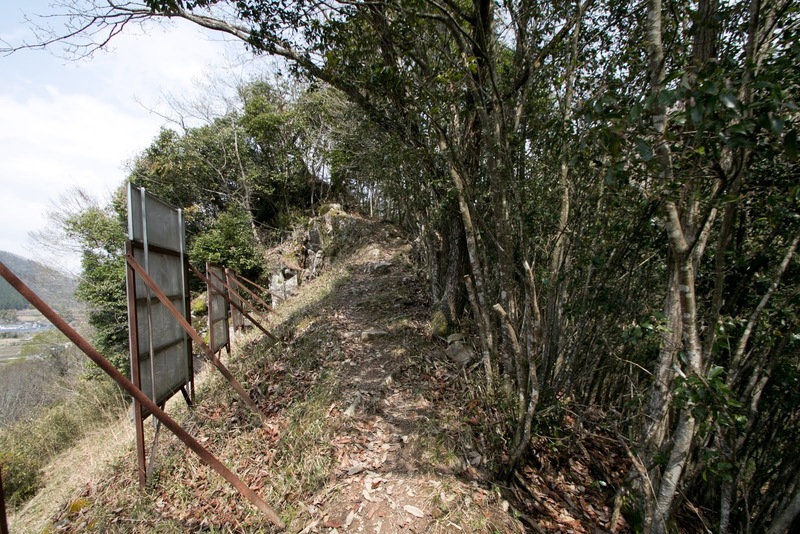 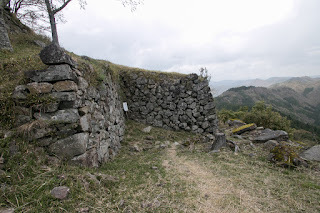 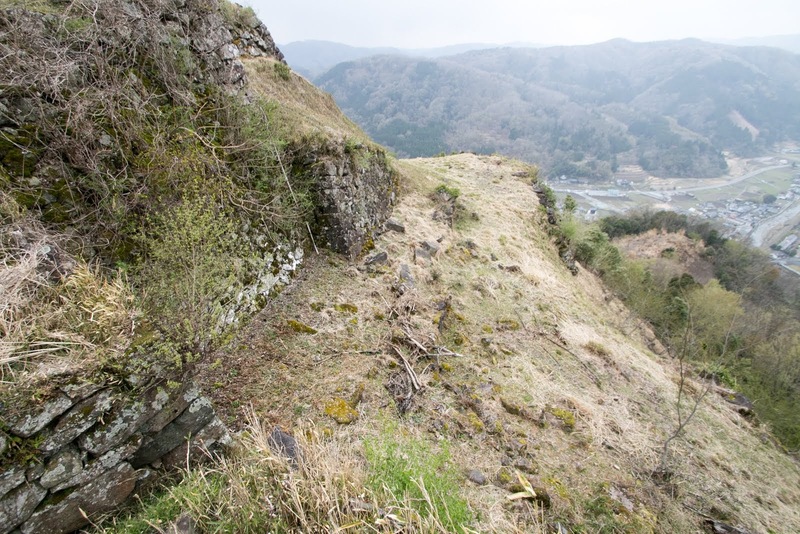 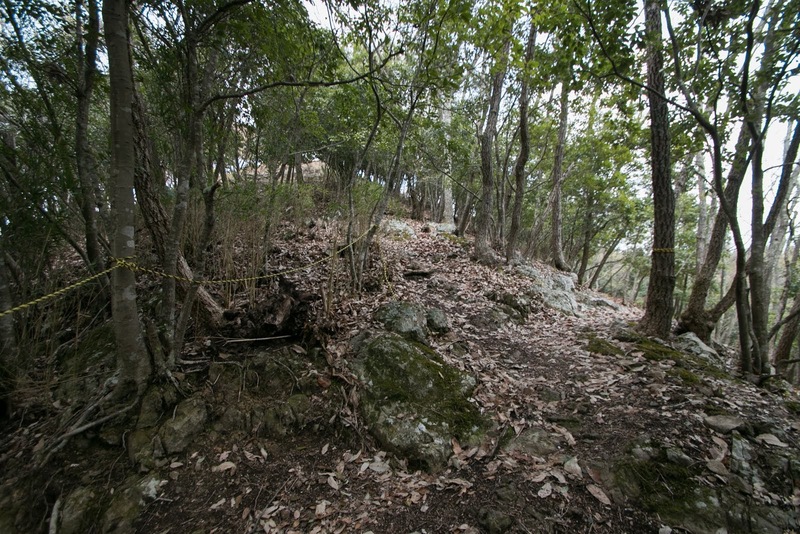 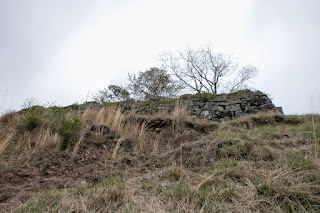 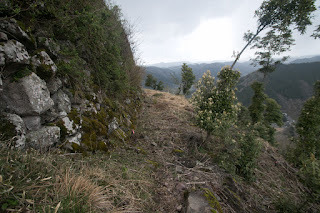 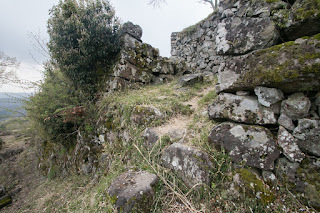 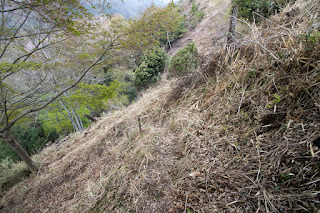 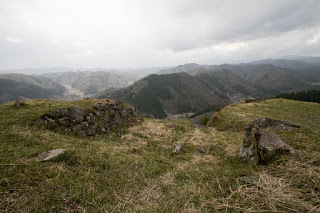 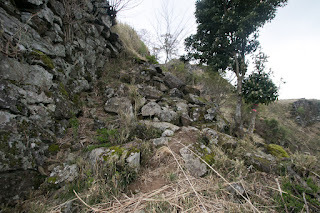 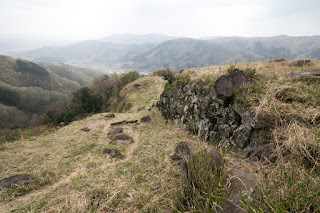 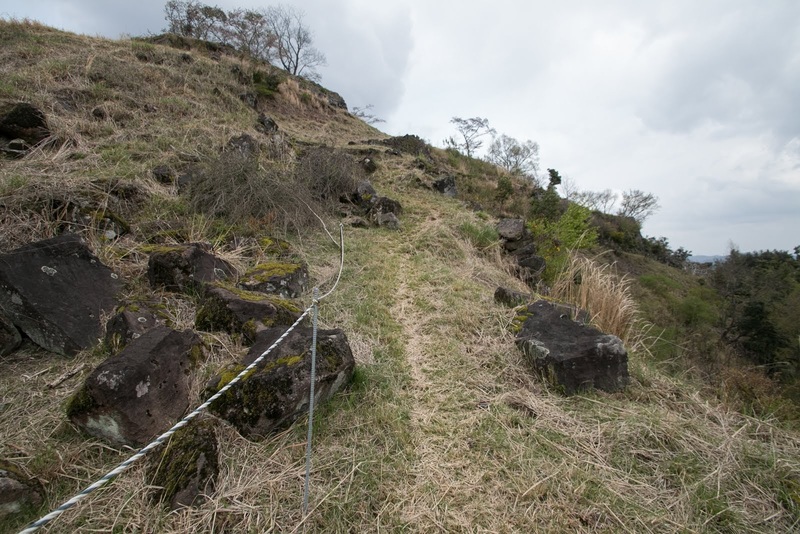 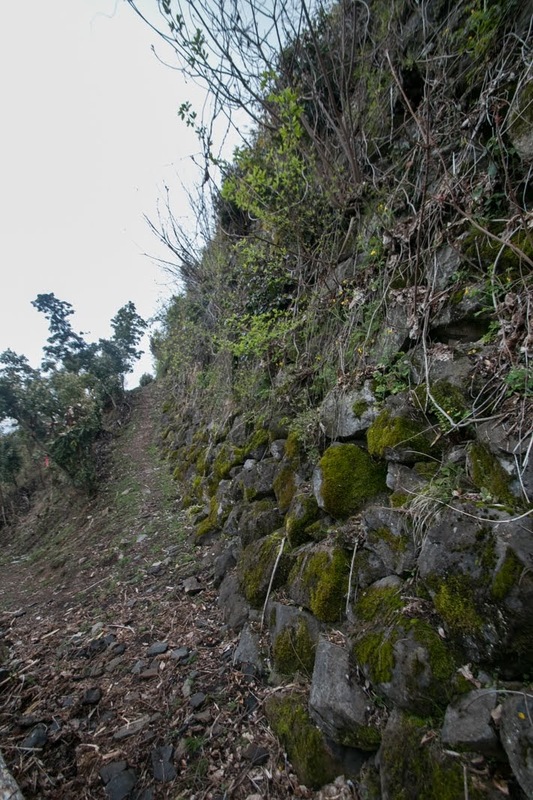 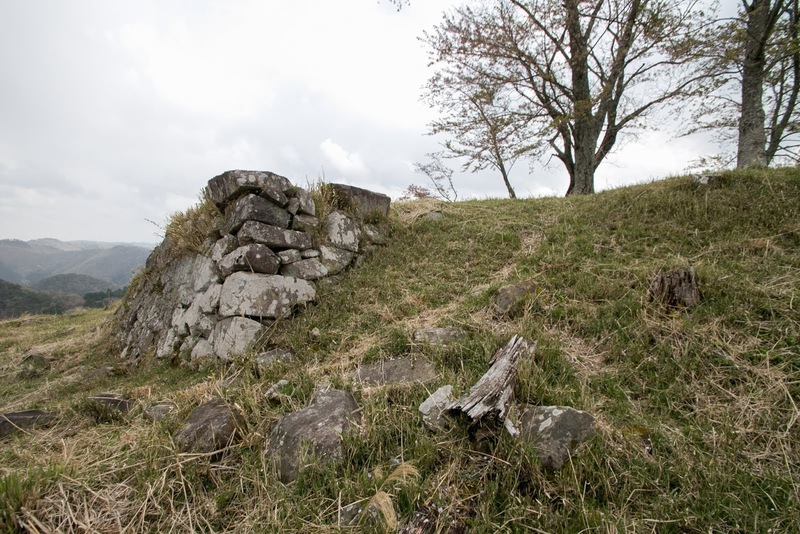 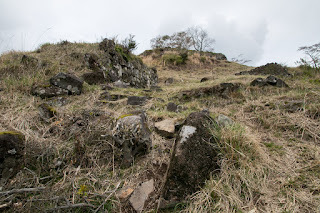 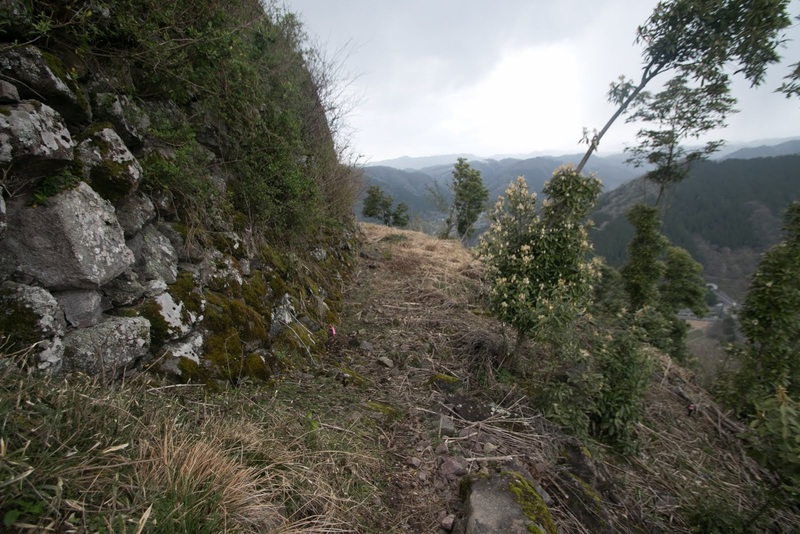 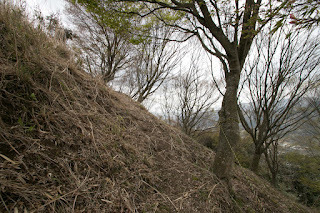 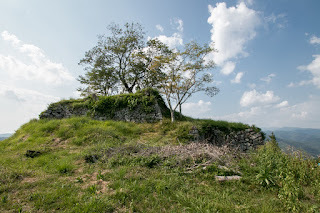 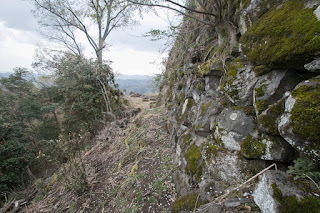 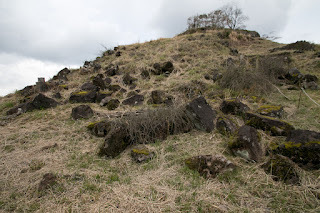 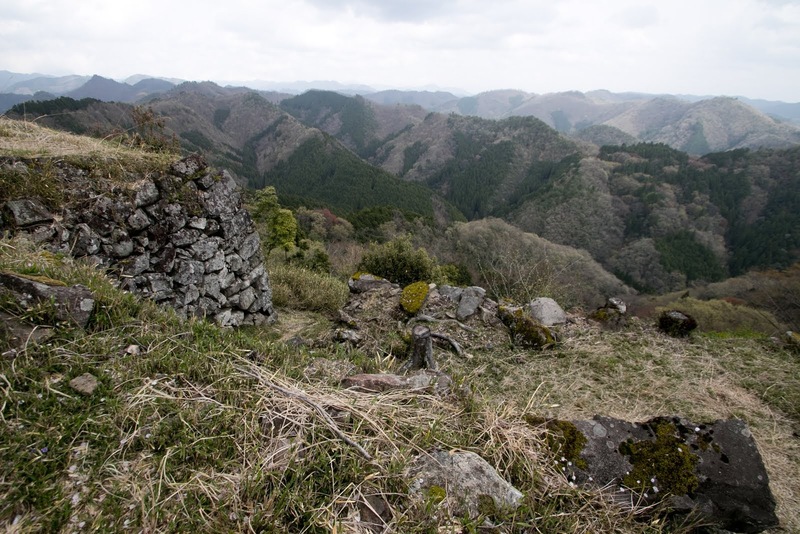 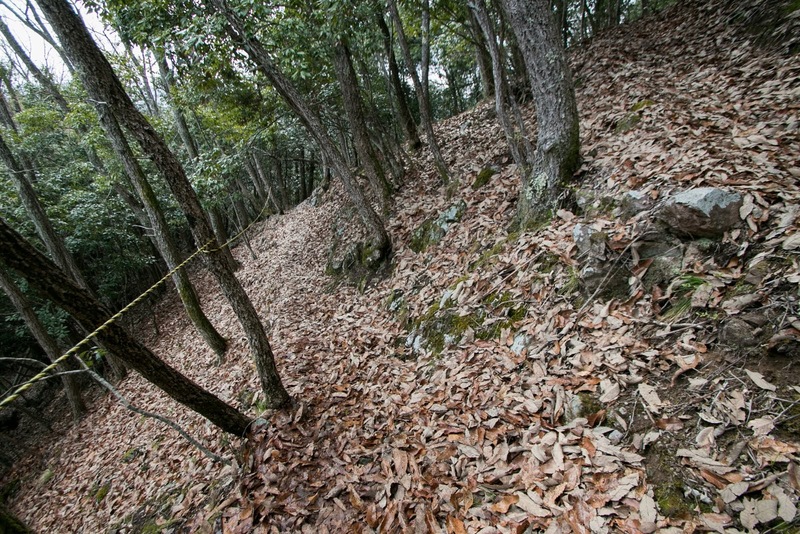 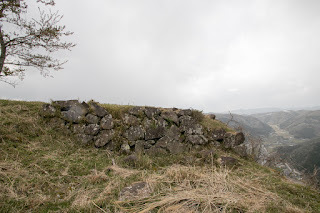 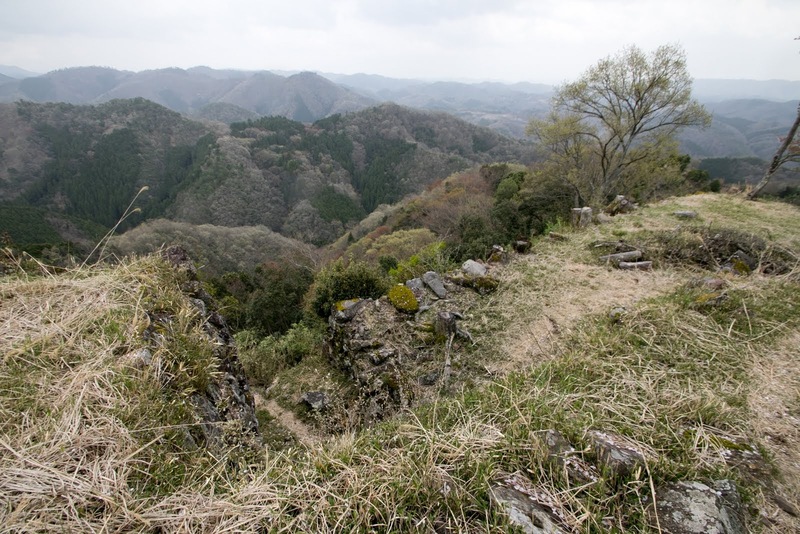 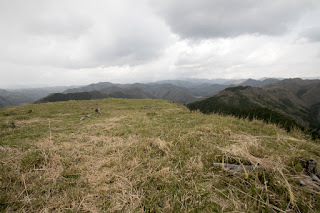 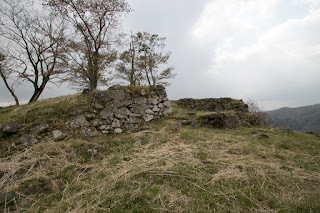 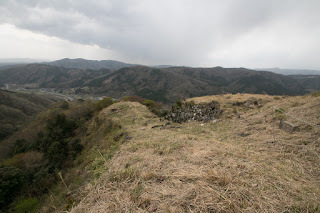 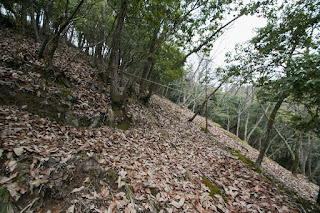 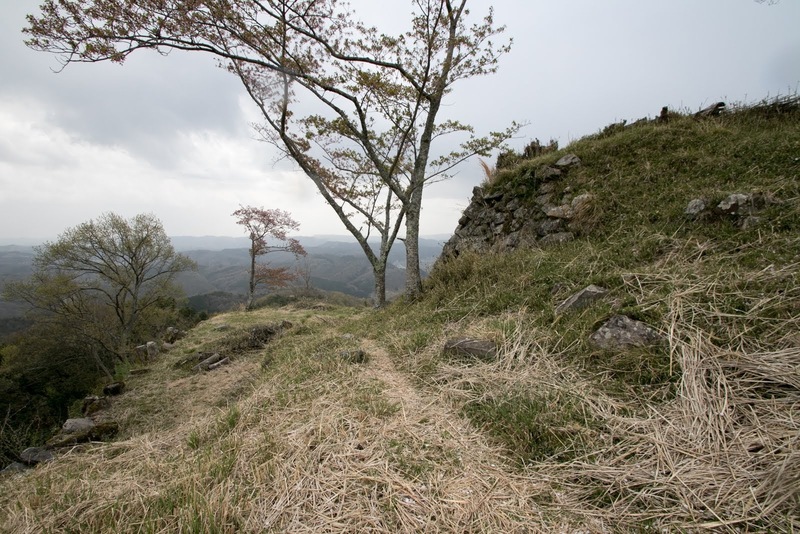 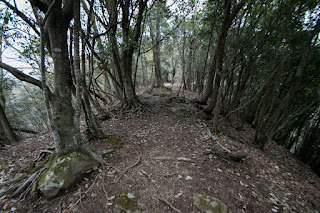 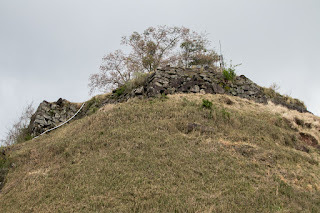 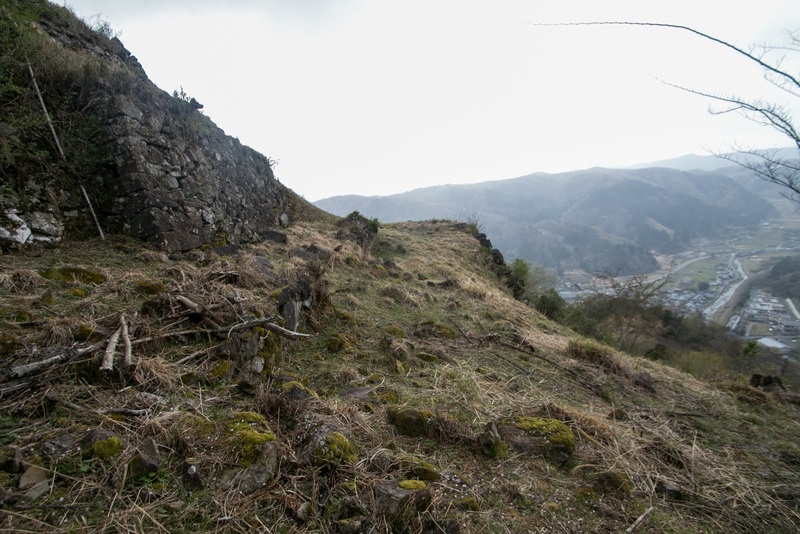 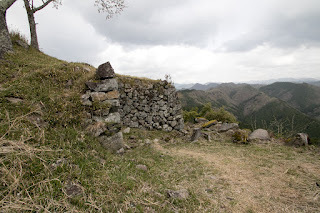 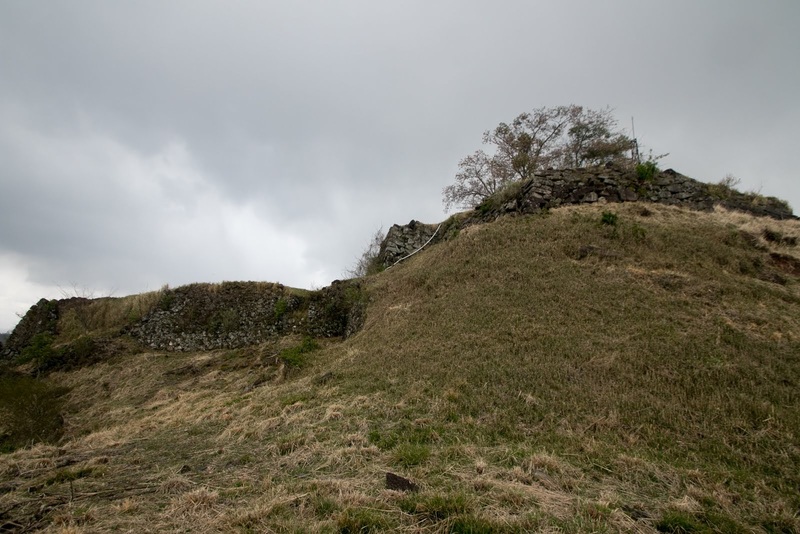 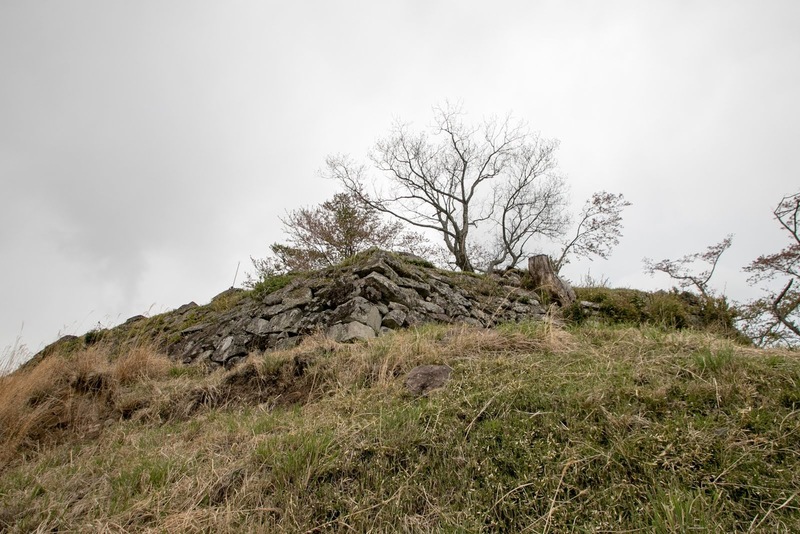 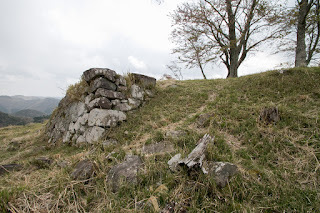 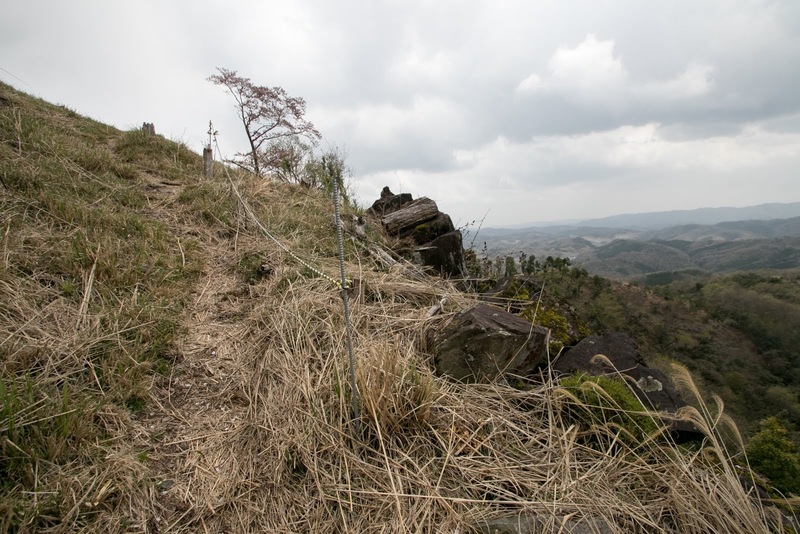 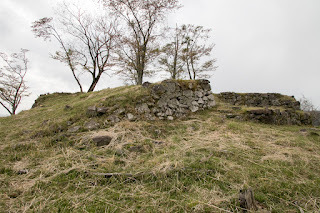 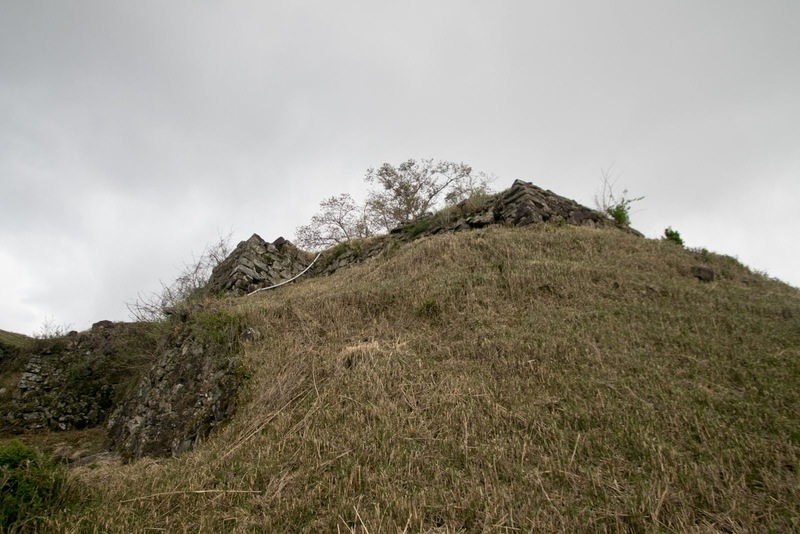 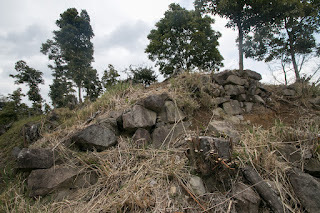 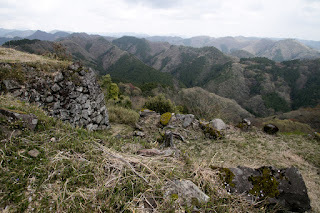 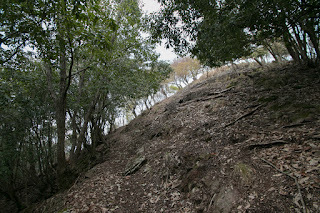 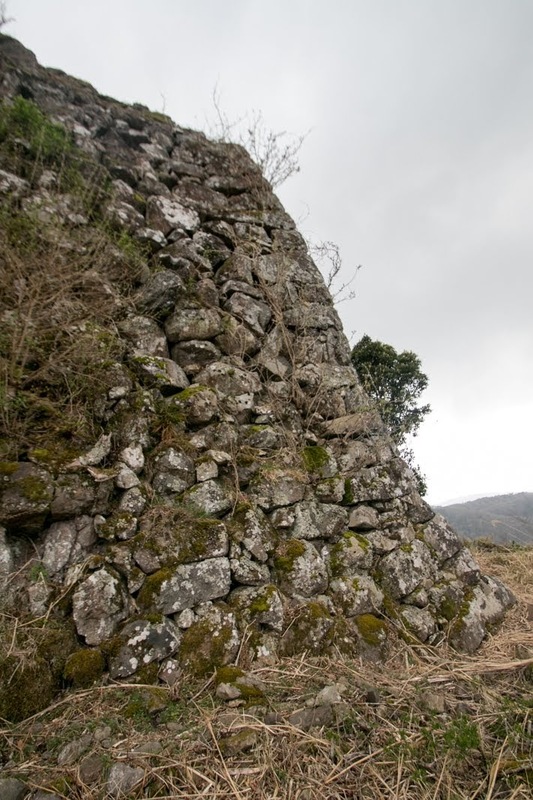 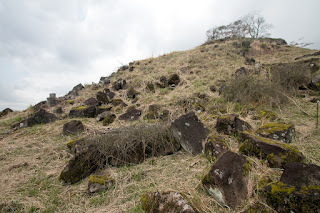 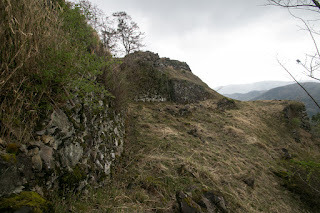 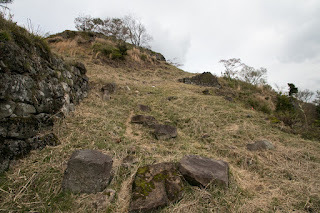 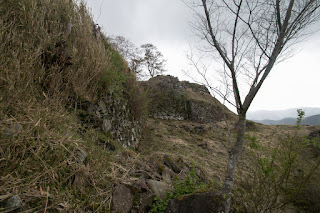 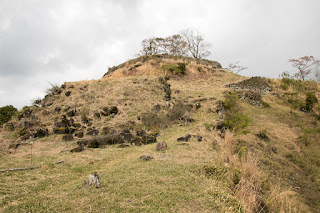 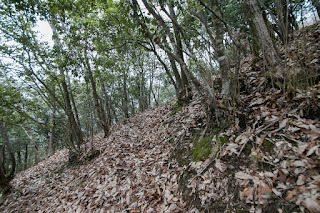 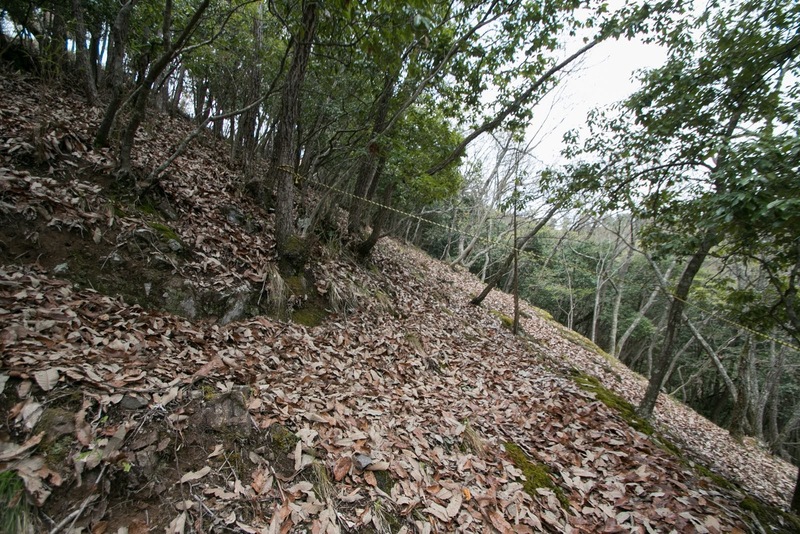 Stone walls spread along the ridge seems as if it is like famous Takeda castle (Hyogo prefecture). 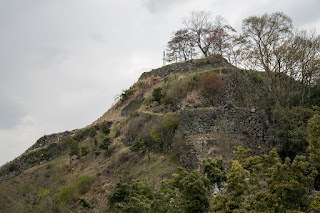 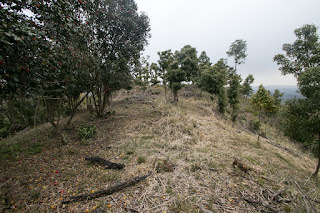 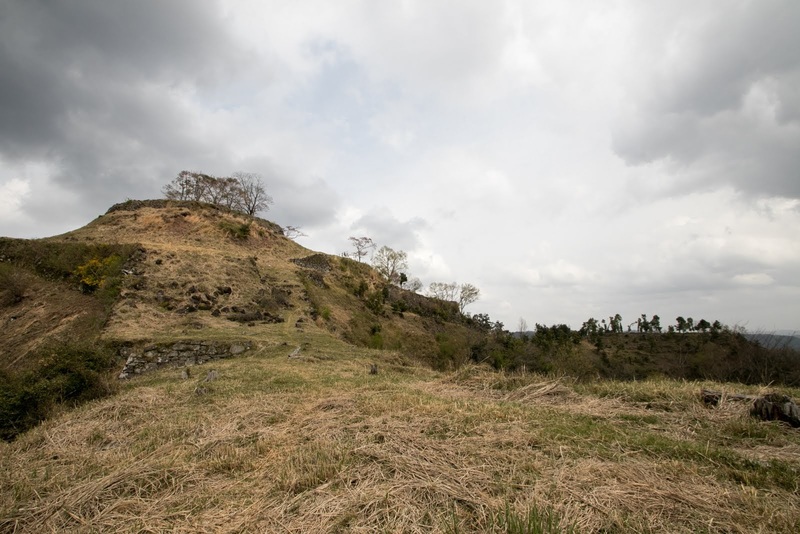 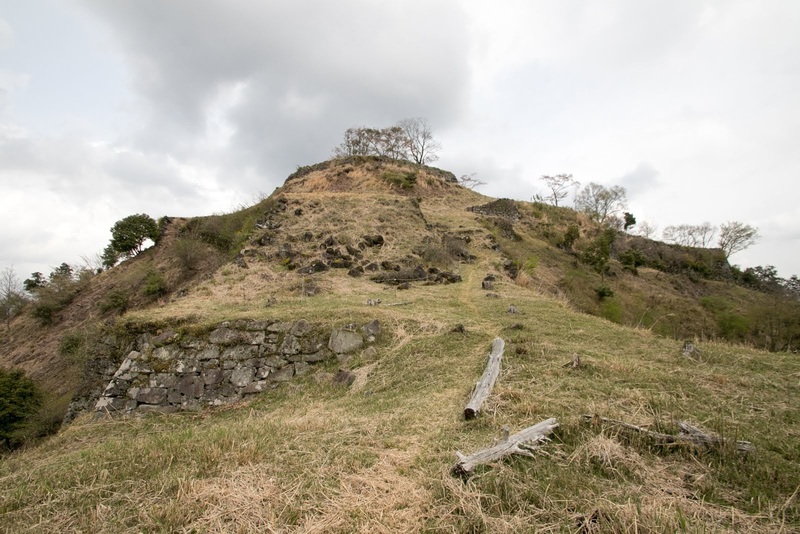 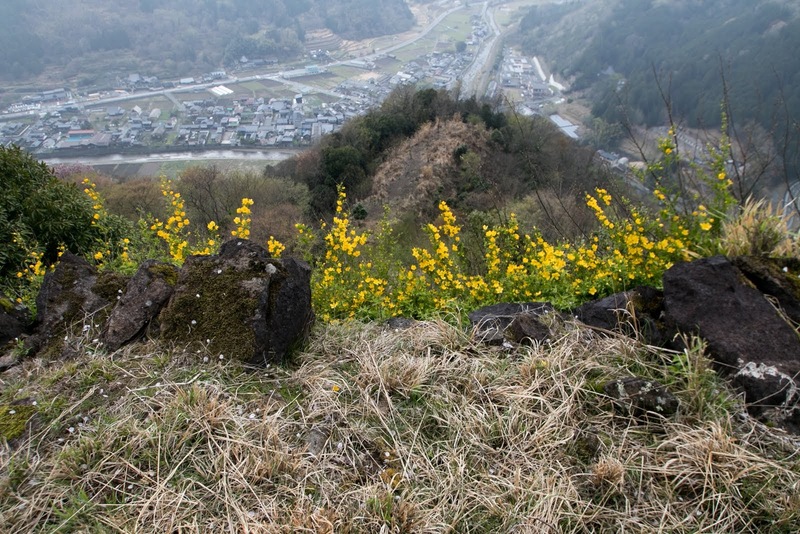 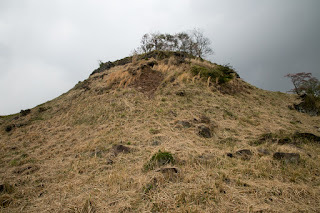 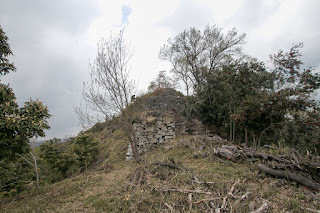 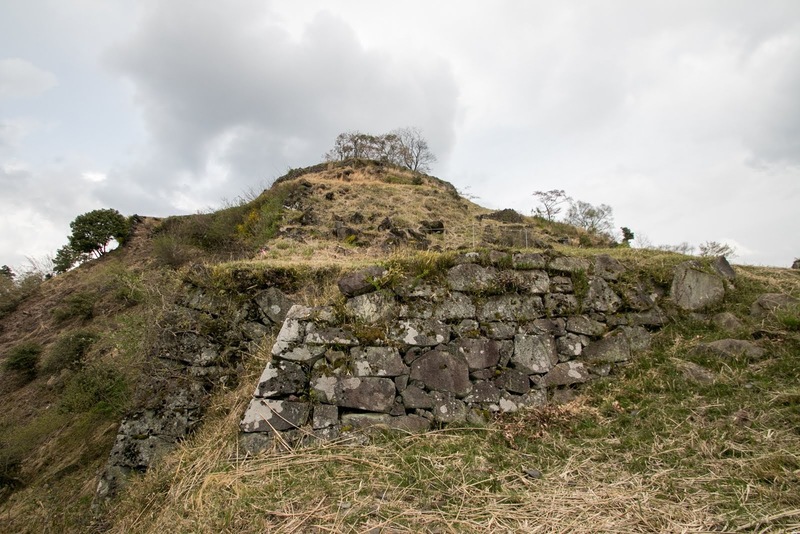 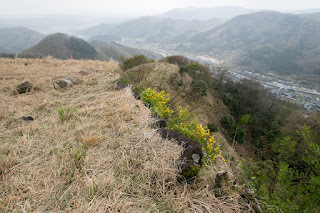 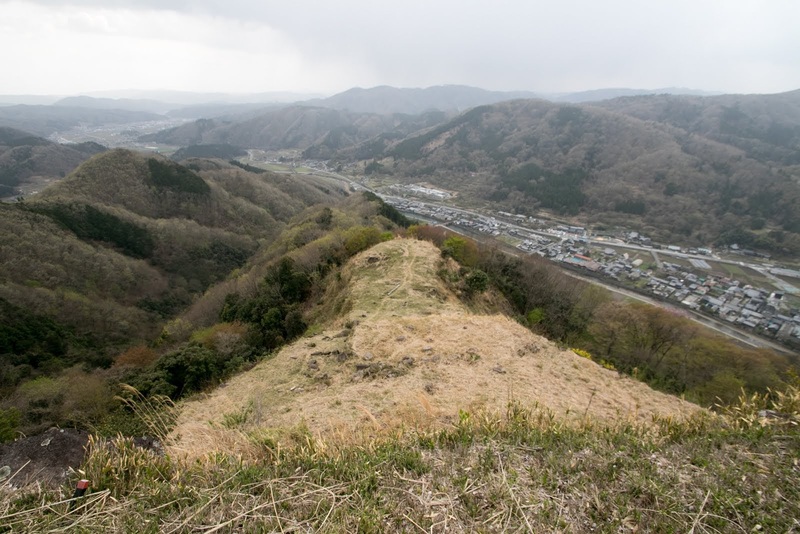 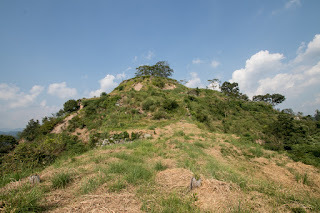 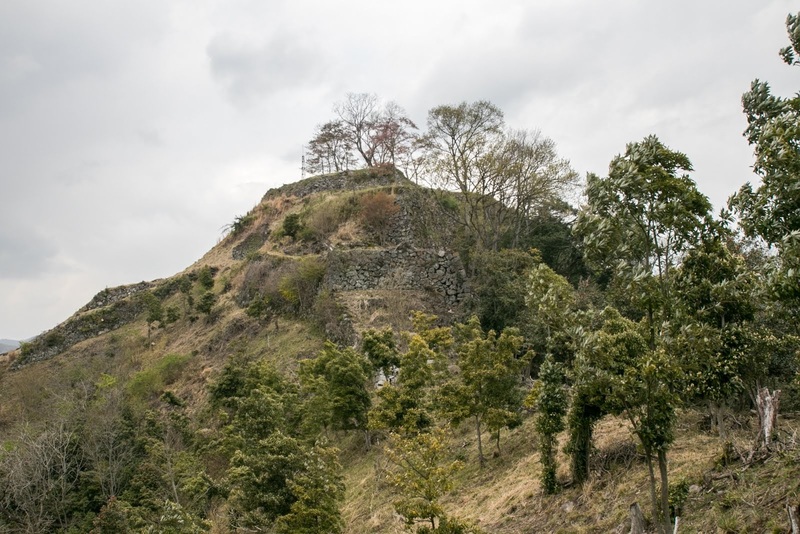 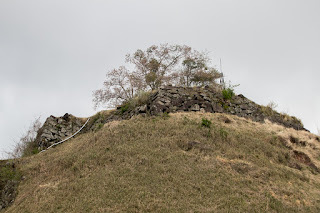 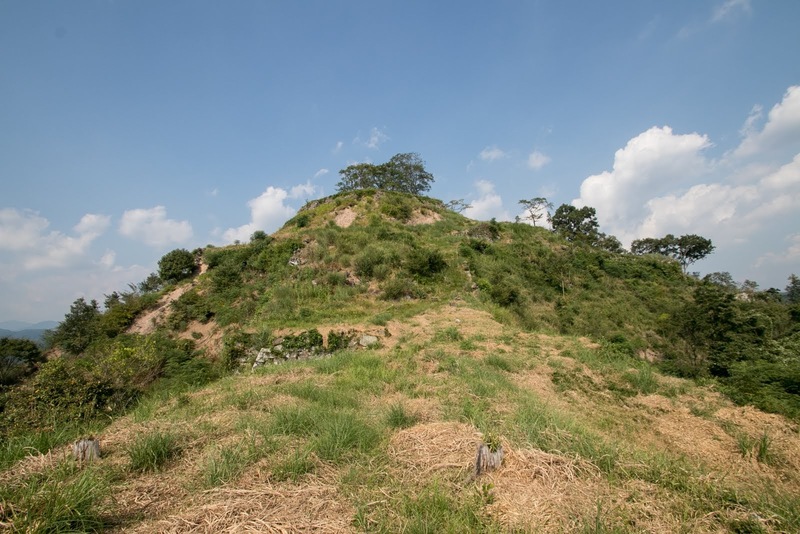 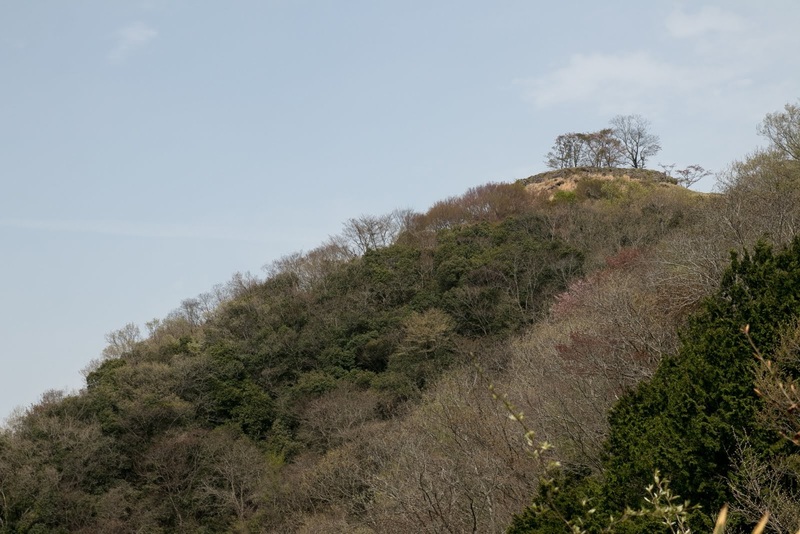 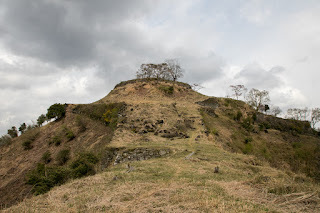 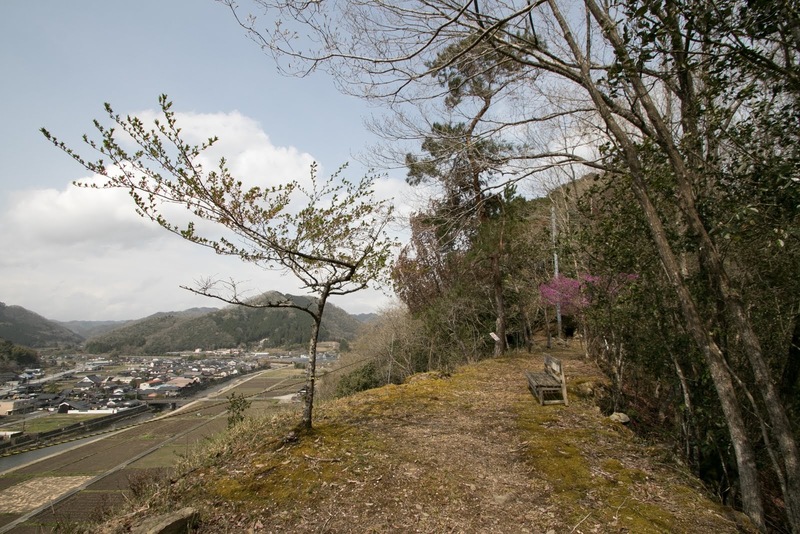 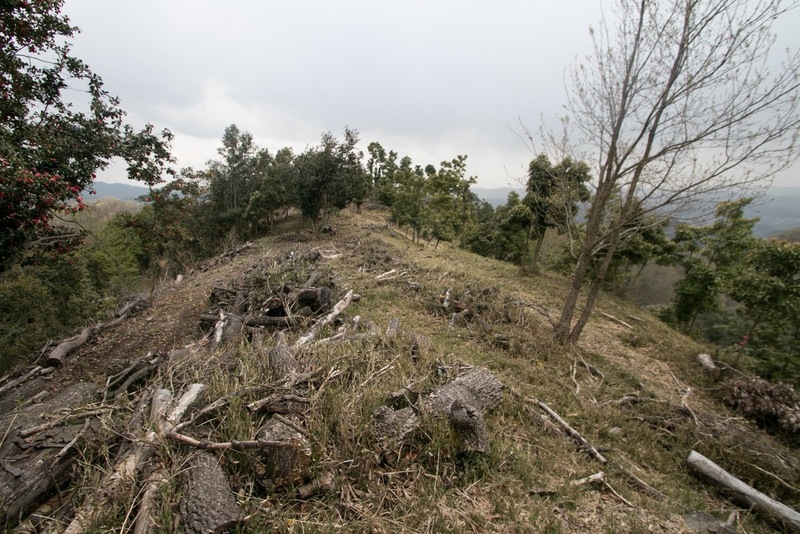 End of "castle penetrate over cloud"
As west side slope of this mountain is steep, layer of main tower area, surrounding corridor and third area decorated by stone walls is well seen from hillside castle town as if it is a huge step. 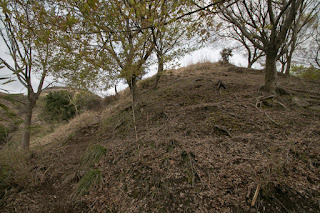 Formerly main tower stood on this basement, and magnificent view of this castle is praised as “Kumotsuki castle” (castle penetrates over cloud). 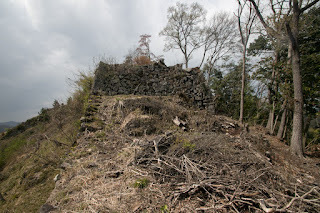 But it is said that when Terumasa Ikeda saw this castle he was surprised by security of this castle, and ordered to destroy main part of this castle not to stimulate Edo Shogunate. Later in 1613 Yoshiyuki moved to the commander of Shimotsui castle (Okayama prefecture), and Teruoki Ikeda (1611-1647) became the lord of the castle. But in 1631 Teruoki became the lord of Ako castle (Hyogo prefecture), and Rikan castle which lost its lord was finally destructed. 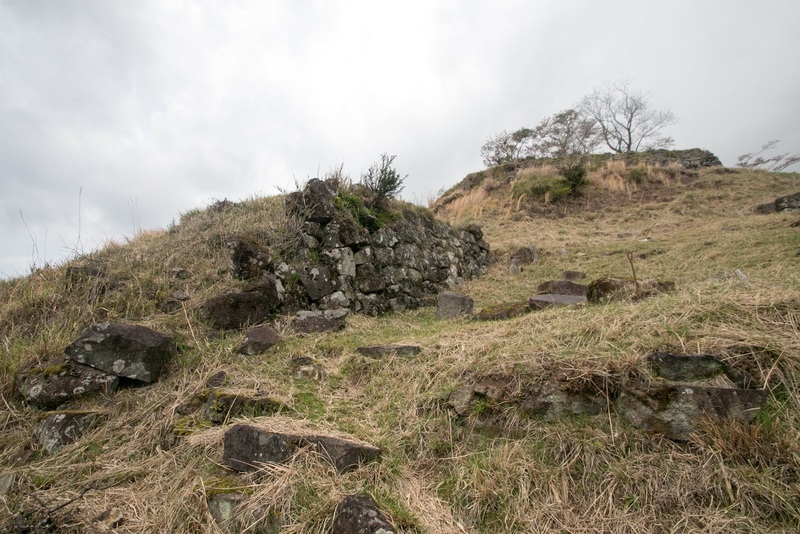 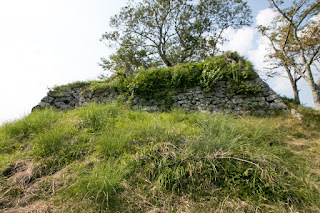 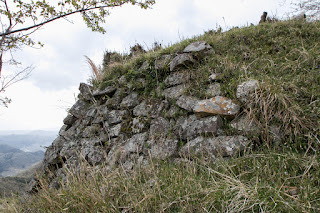 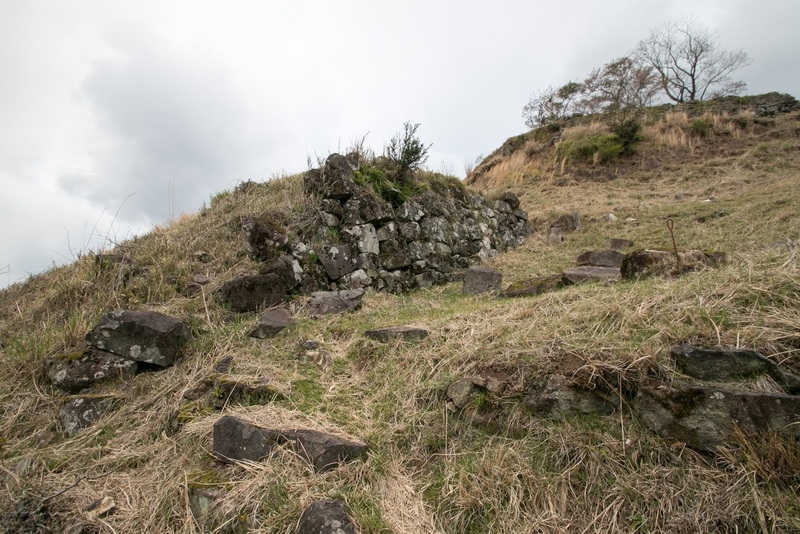 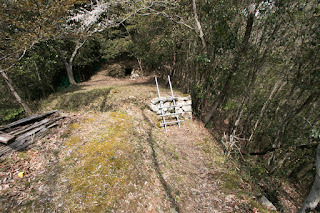 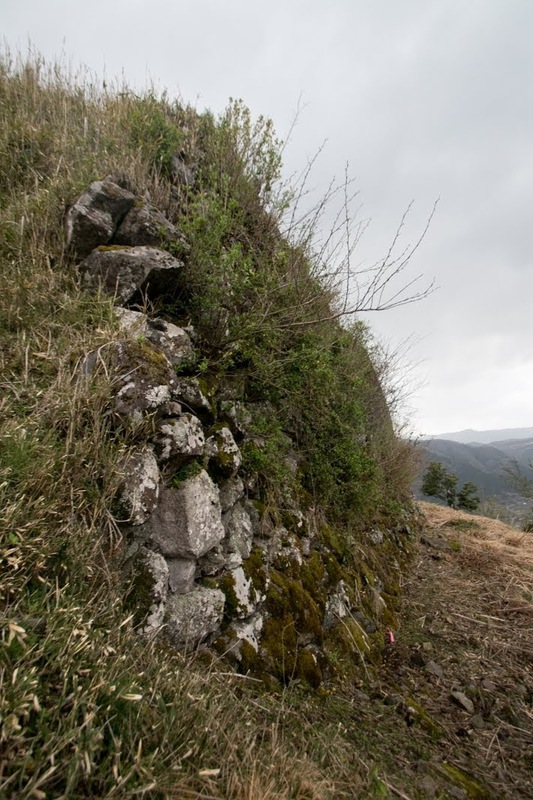 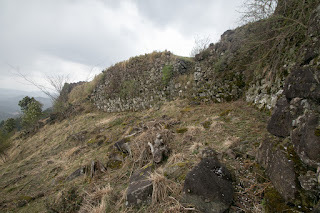 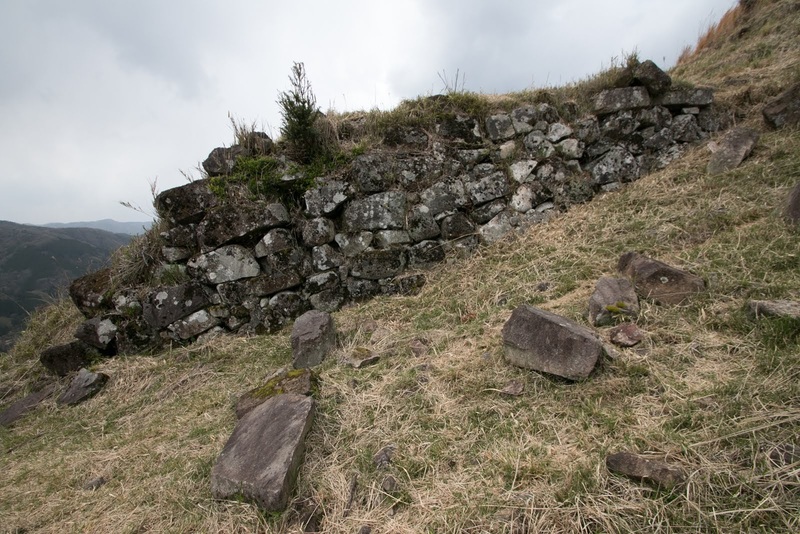 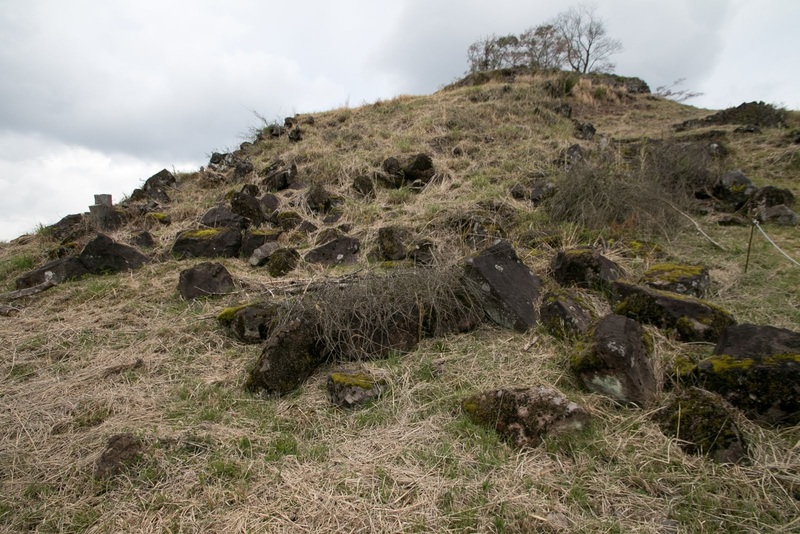 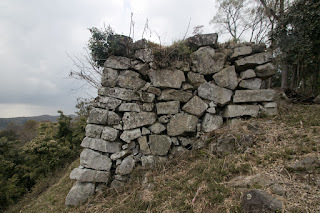 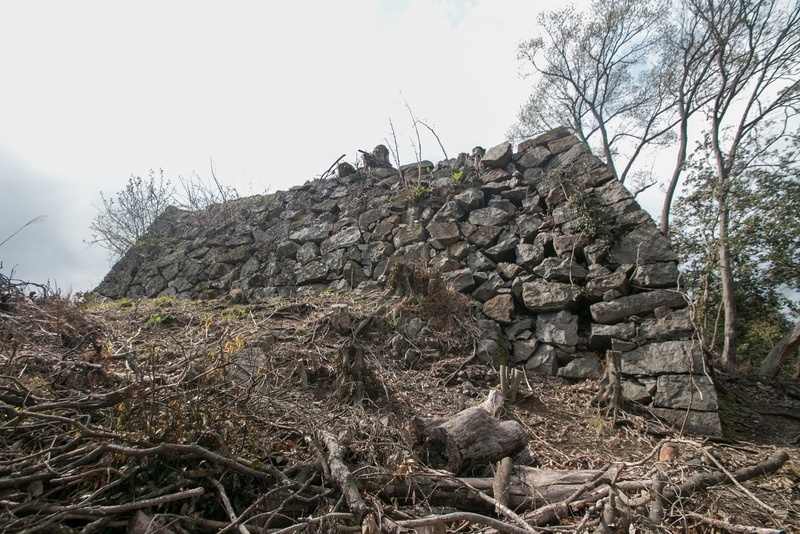 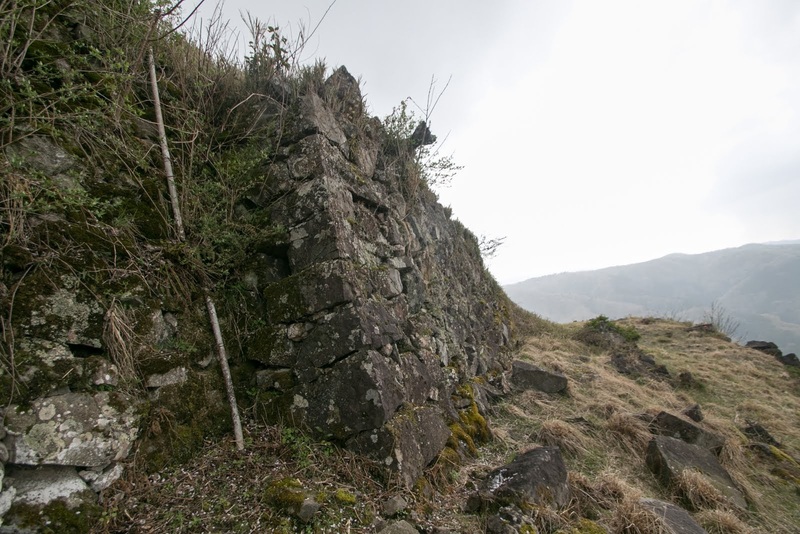 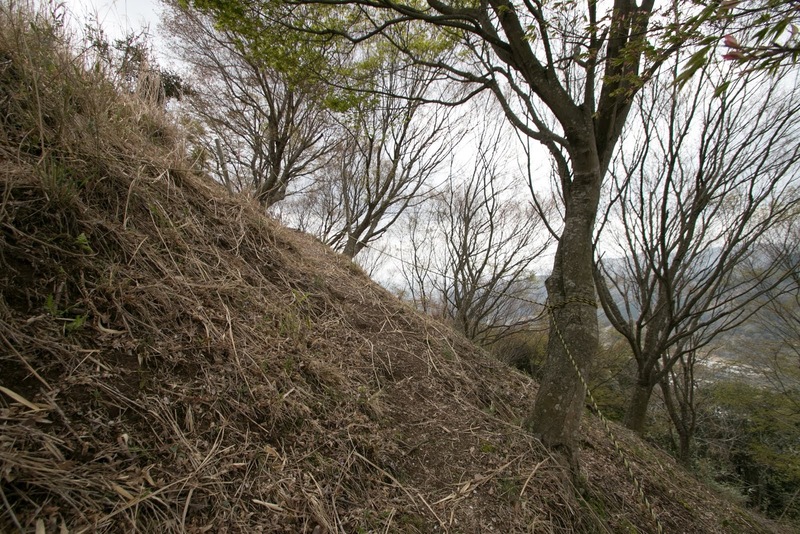 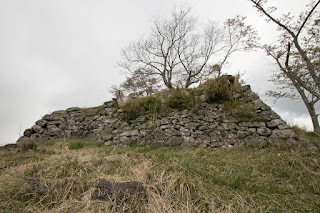 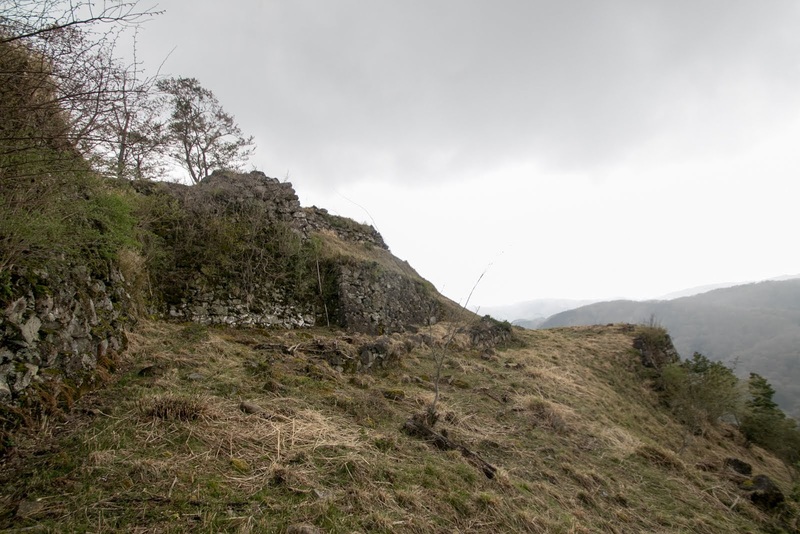 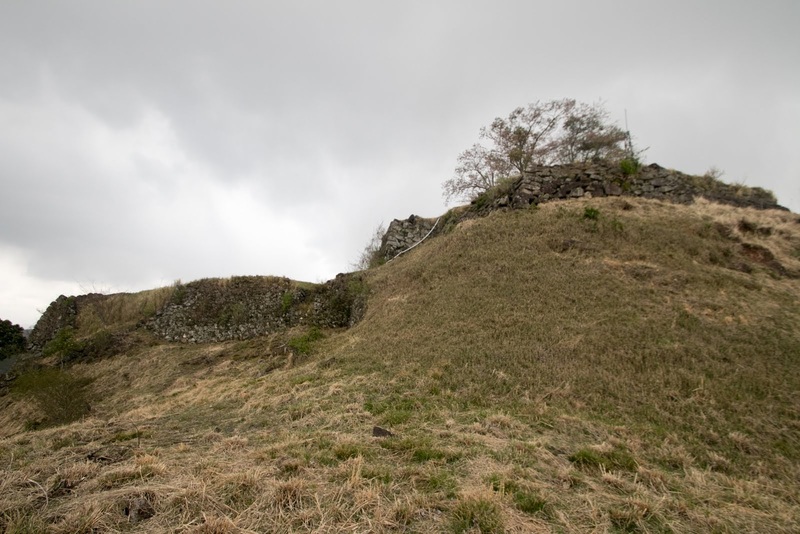 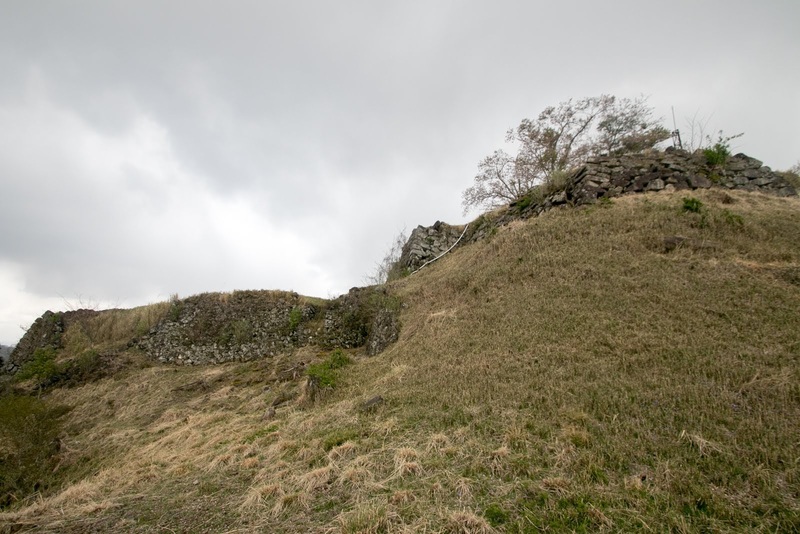 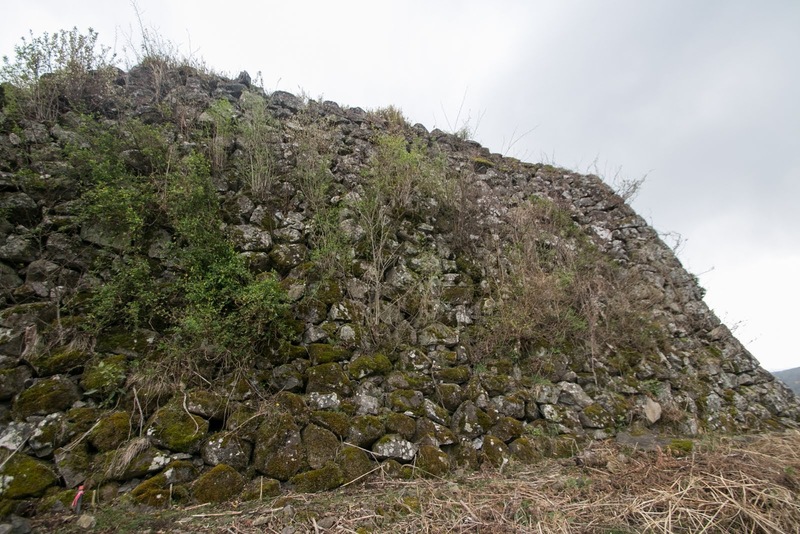 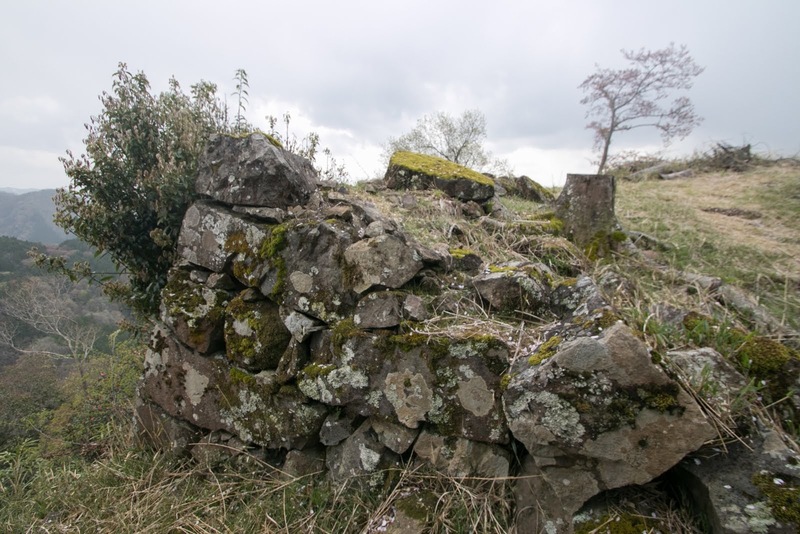 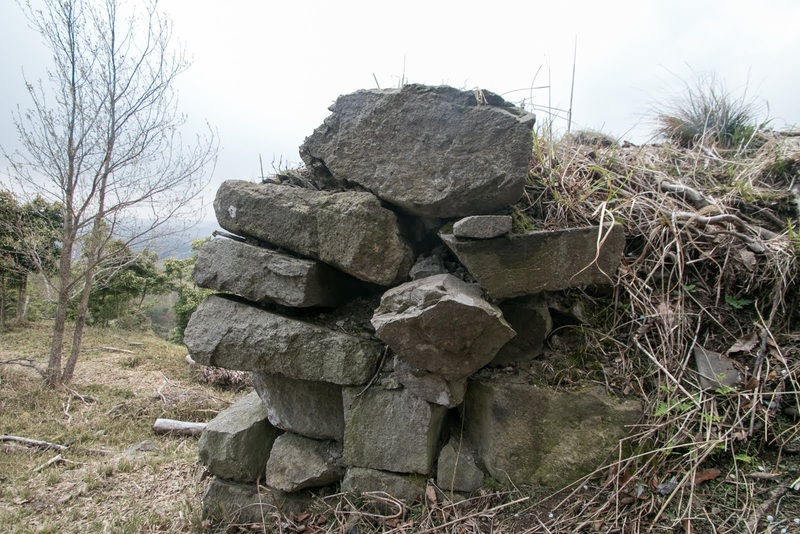 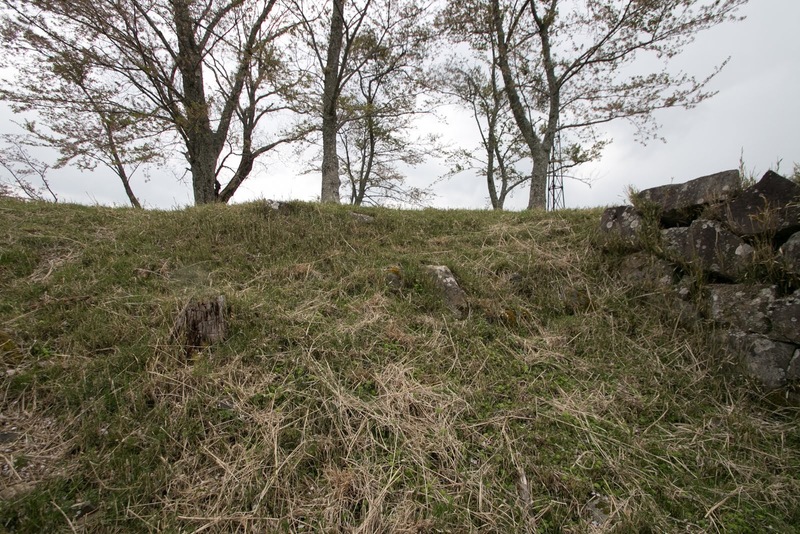 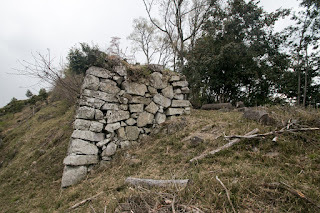 To show disappearance of the castle stone walls at west side of the castle directly faced to castle town were thoroughly demolished, but stone walls at other sides is certainly remaining. 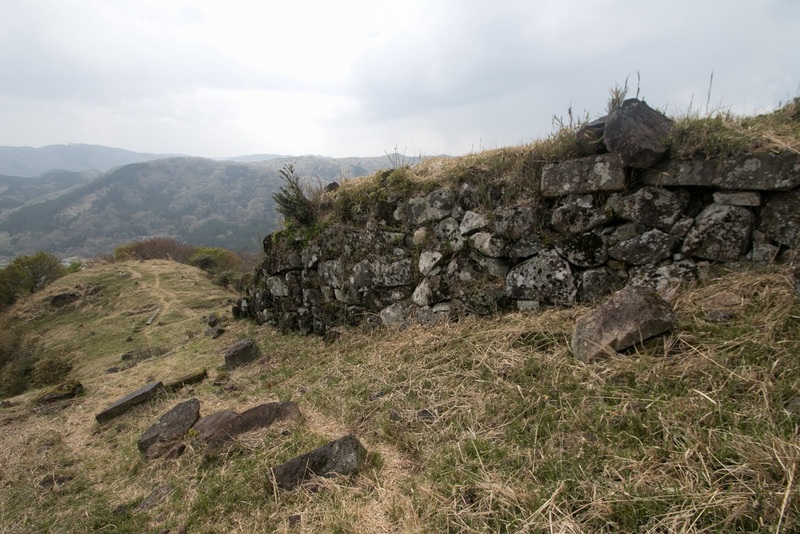 Even though losing its castle, castle town prospered as a posting town of Inaba Kaid way throughout Edo era. 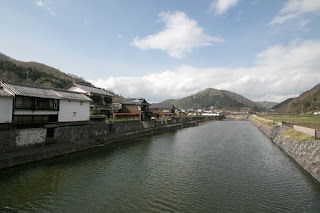 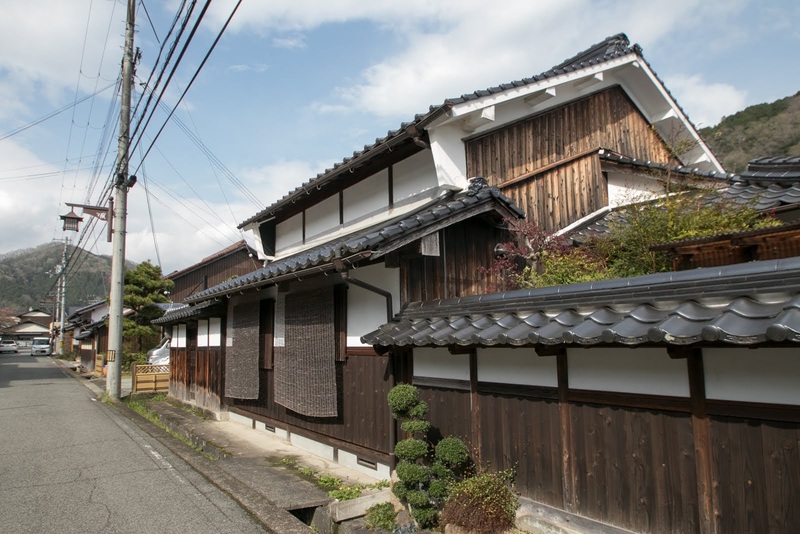 Old merchant houses and storehouses spread along Sayo river still well remain until now and kept old atmosphere. 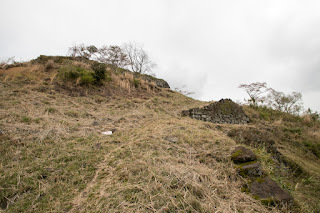 Currently half broken stone walls spread around peak of the mountain. Combination of broken stone walls and scenery of castle town under the eye is a beautiful scenery, and if condition allows this castle will flow the sea of the mist. 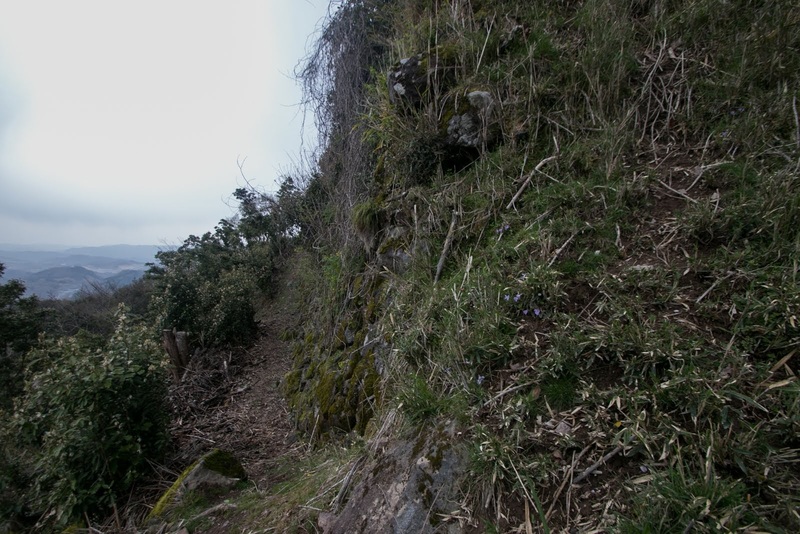 But because of sheer cliff and past demolition, there is a risk of slipping or fall to walk around this castle. 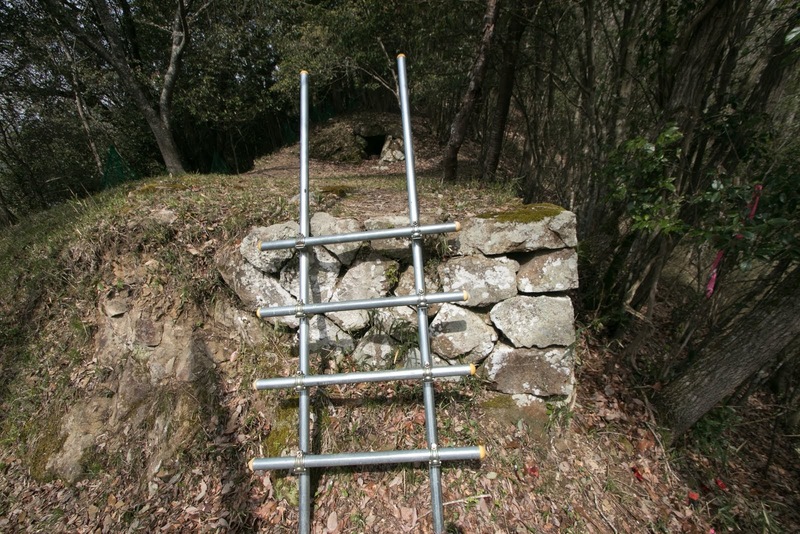 Visitors are required to visit this castle at their own risk. 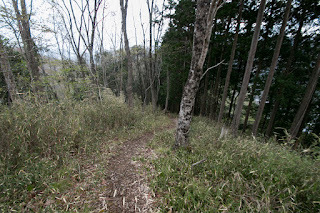 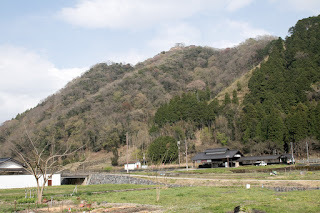 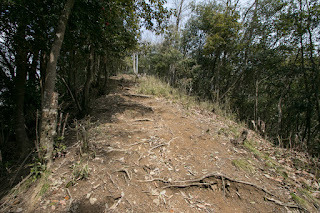 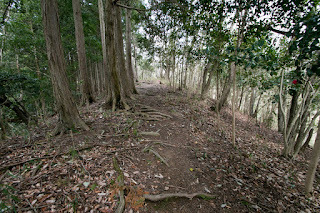 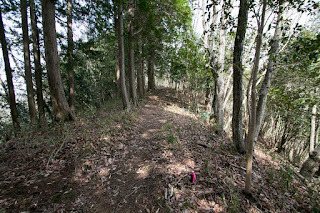 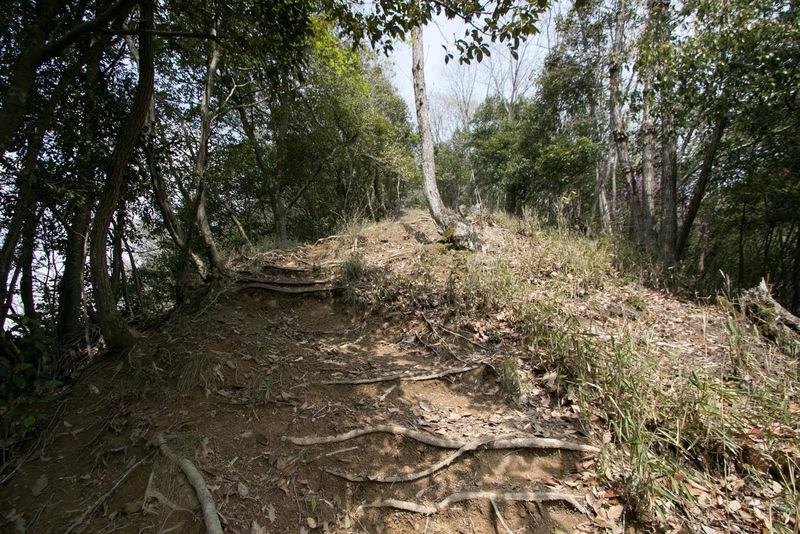 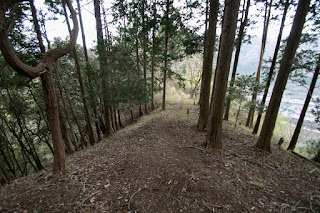 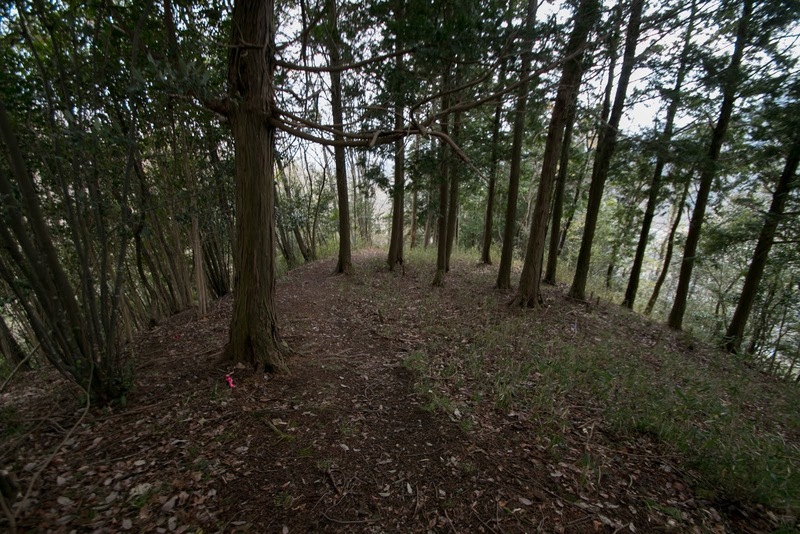 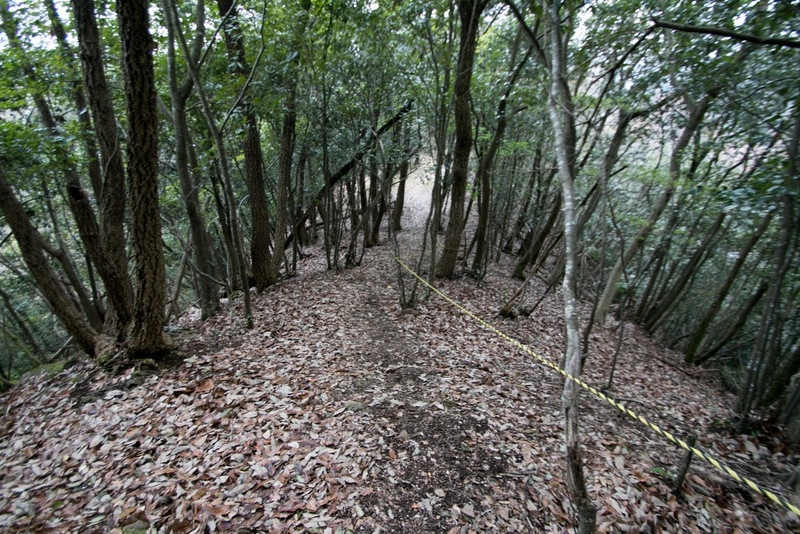 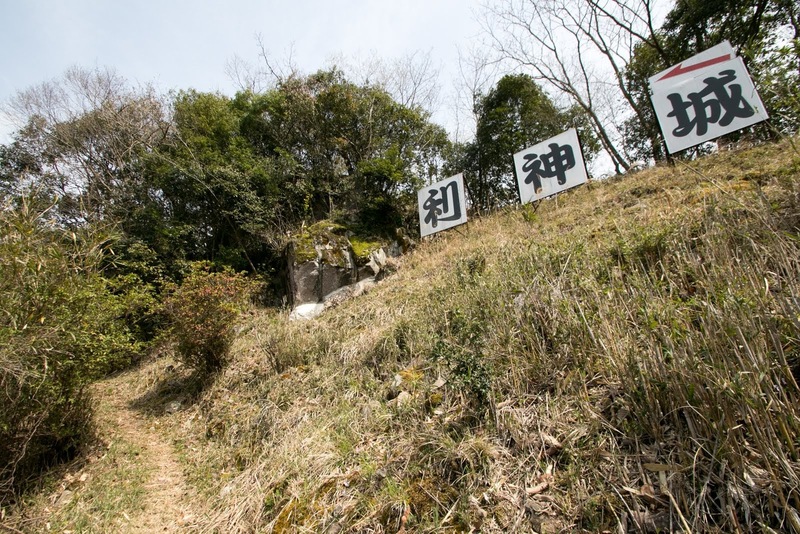 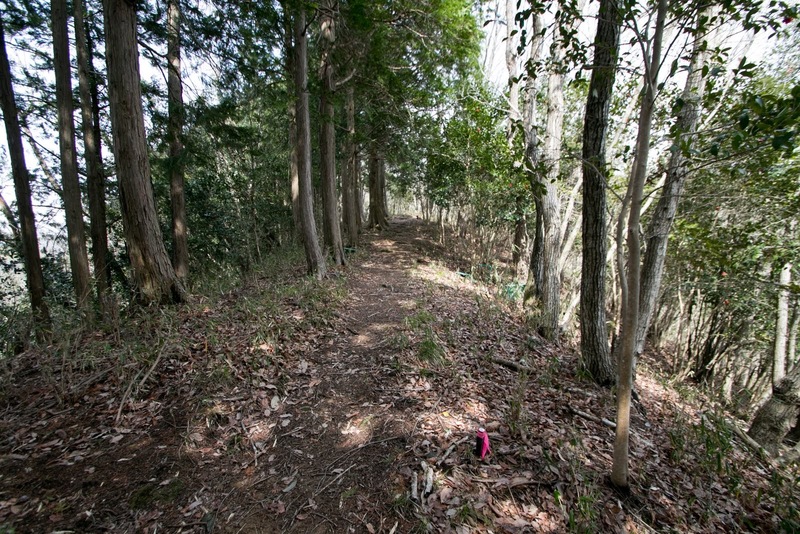 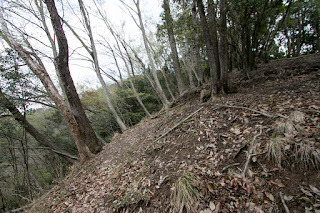 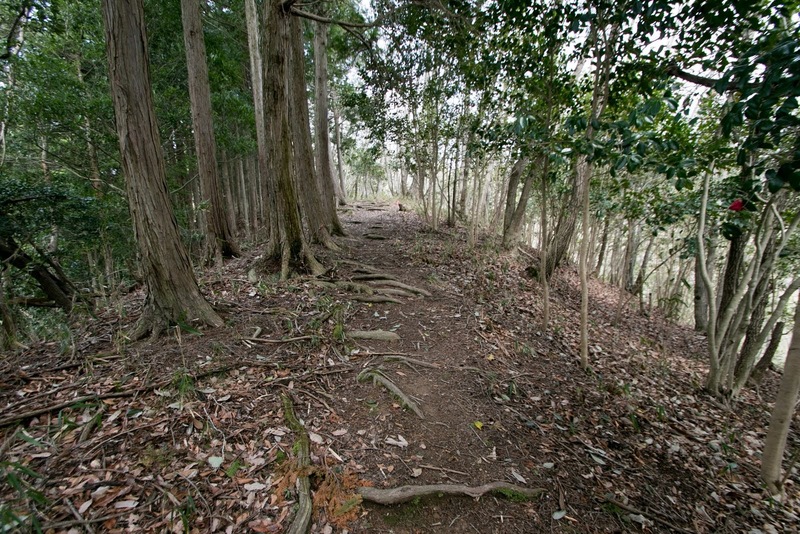 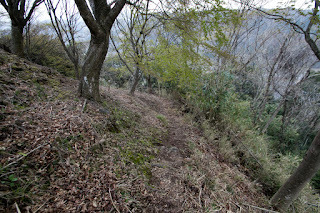 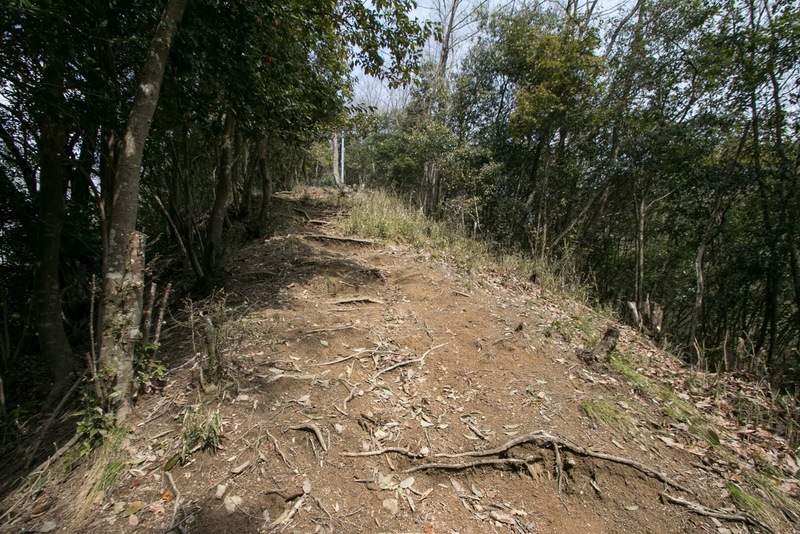 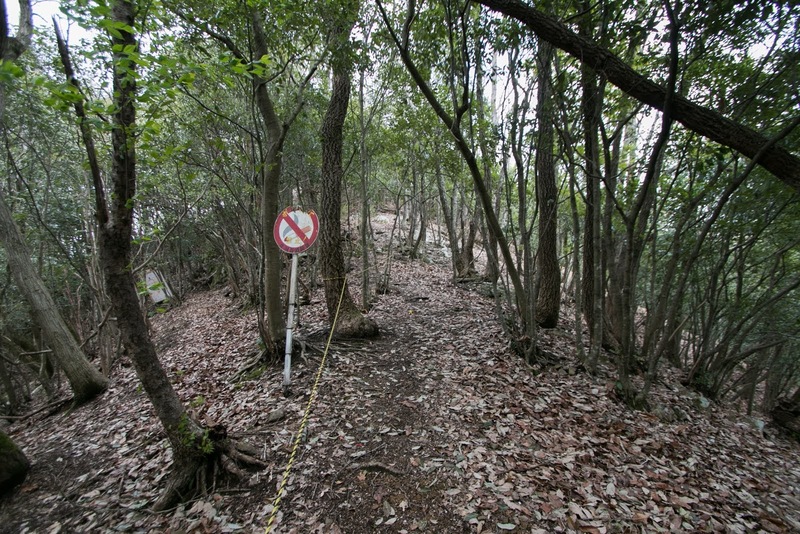 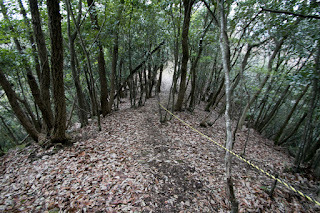 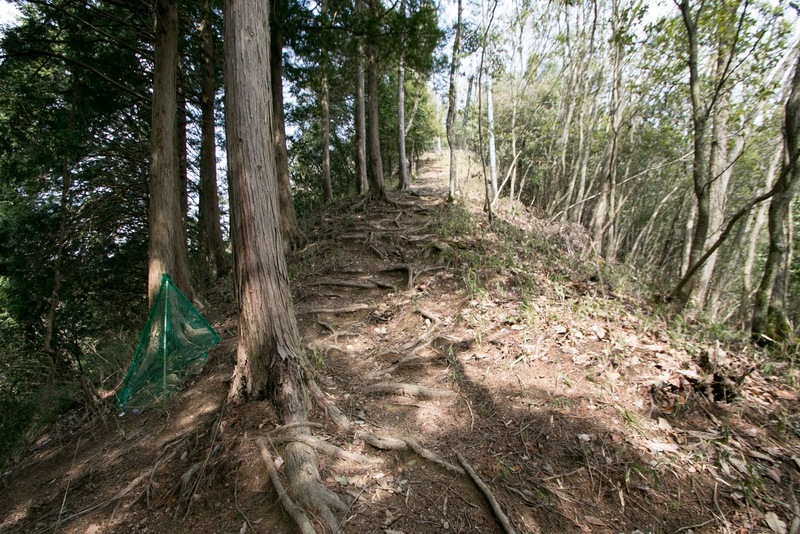 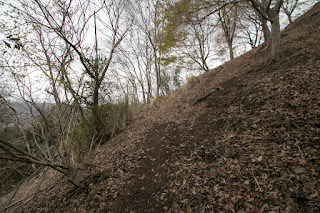 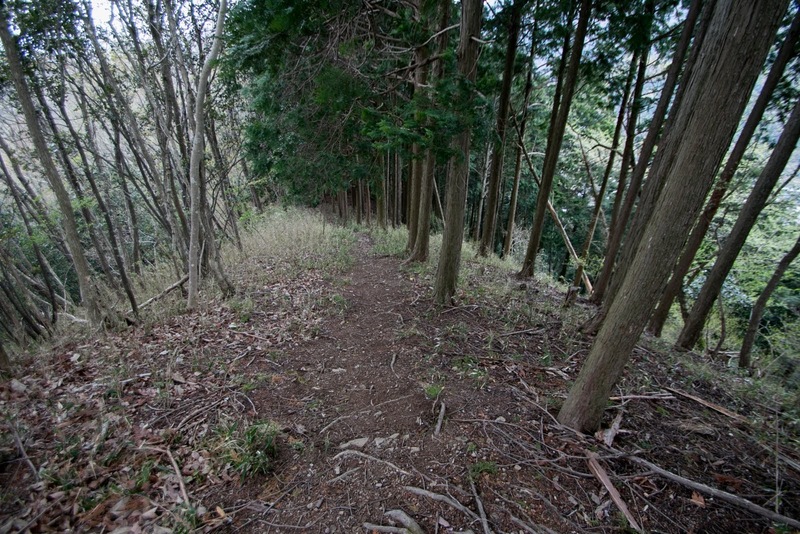 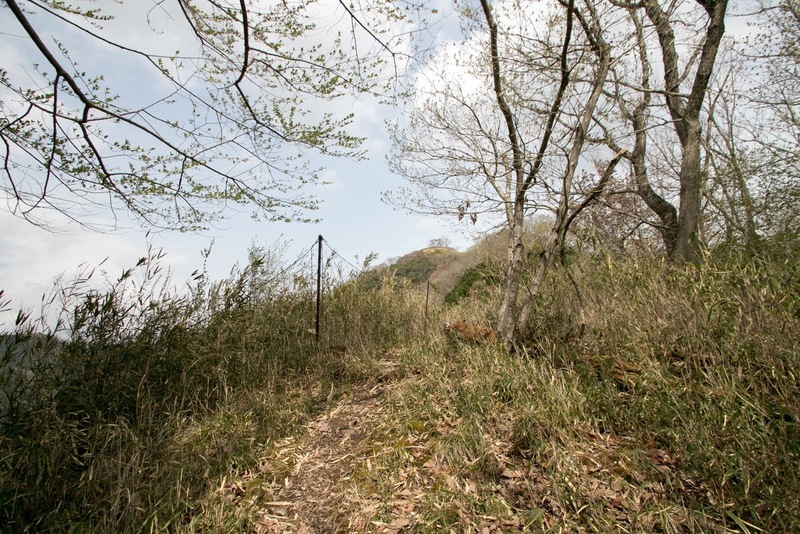 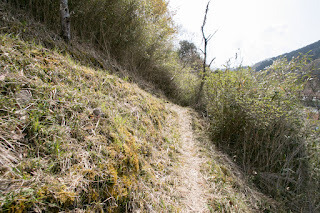 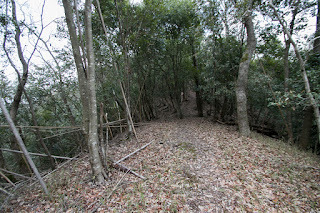 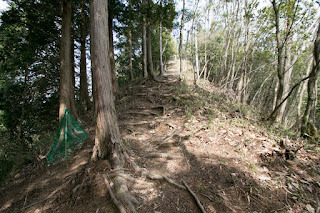 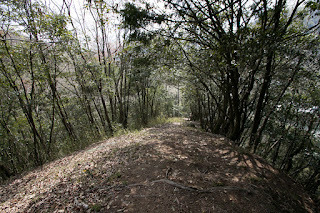 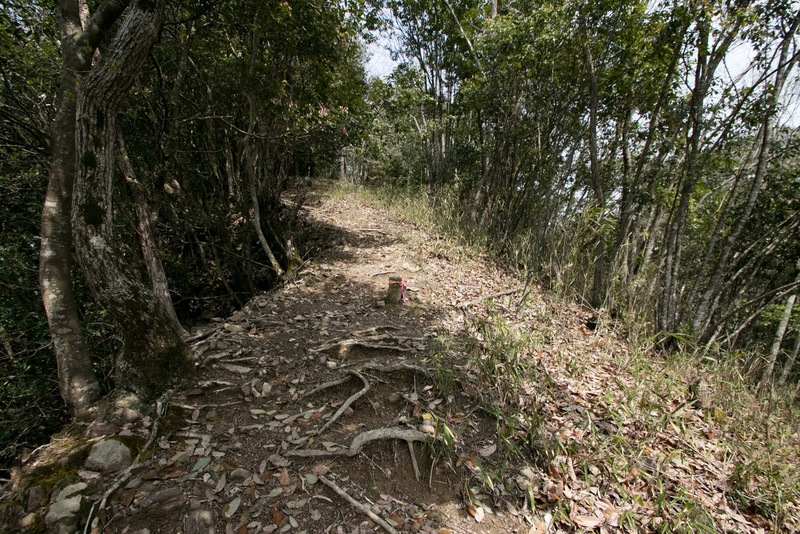 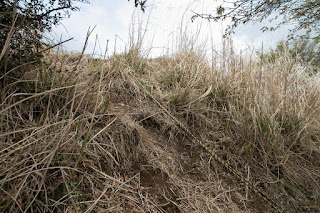 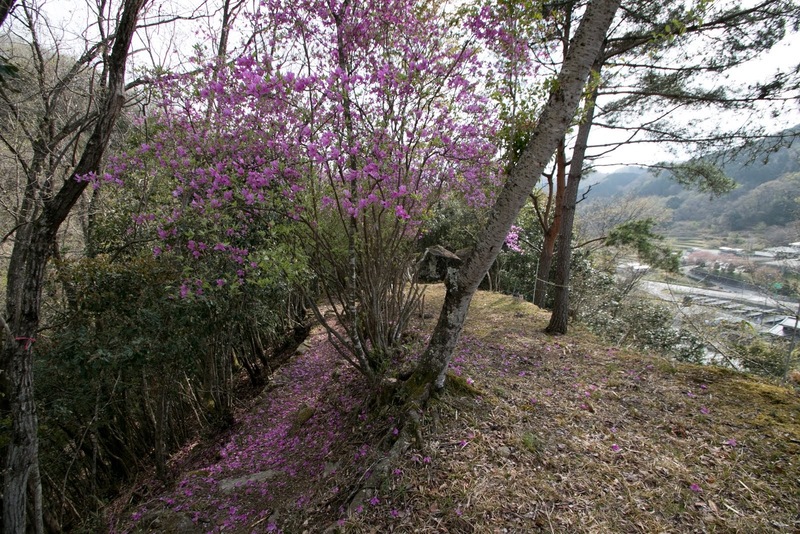 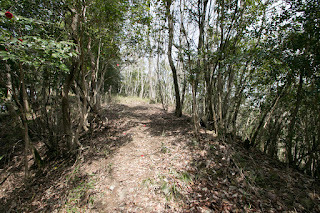 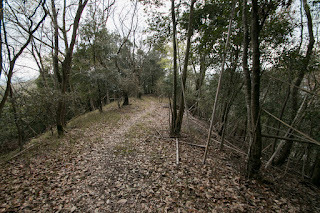 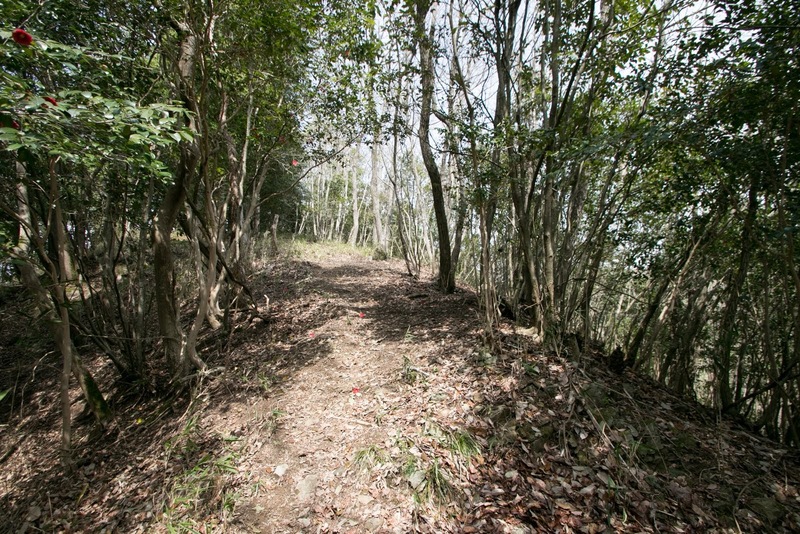 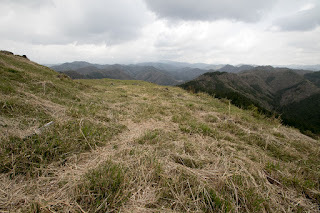 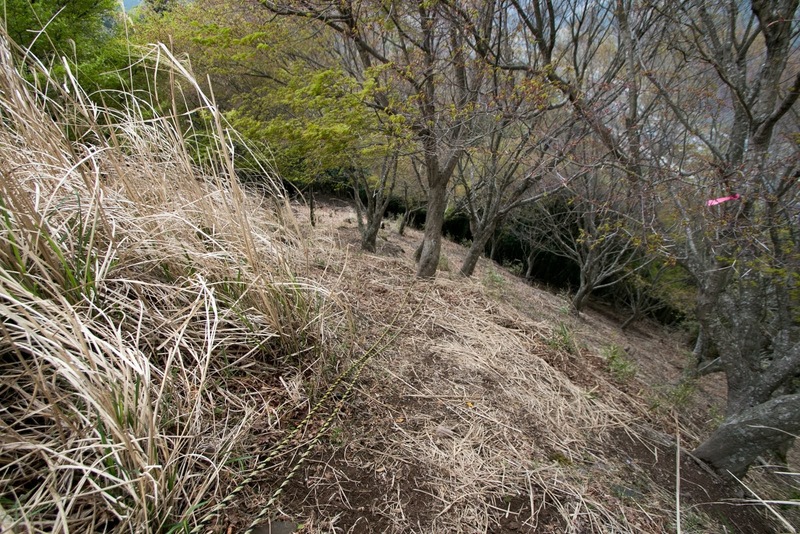 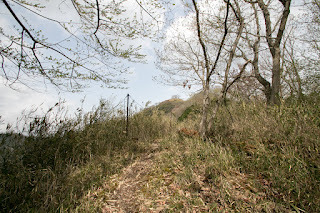 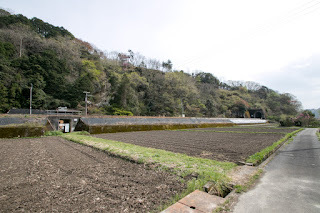 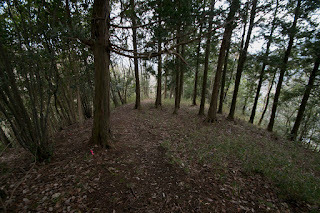 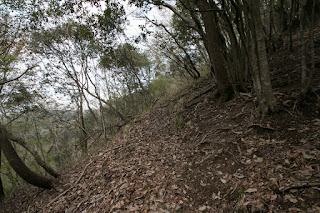 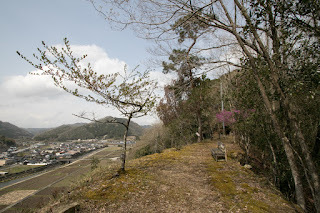 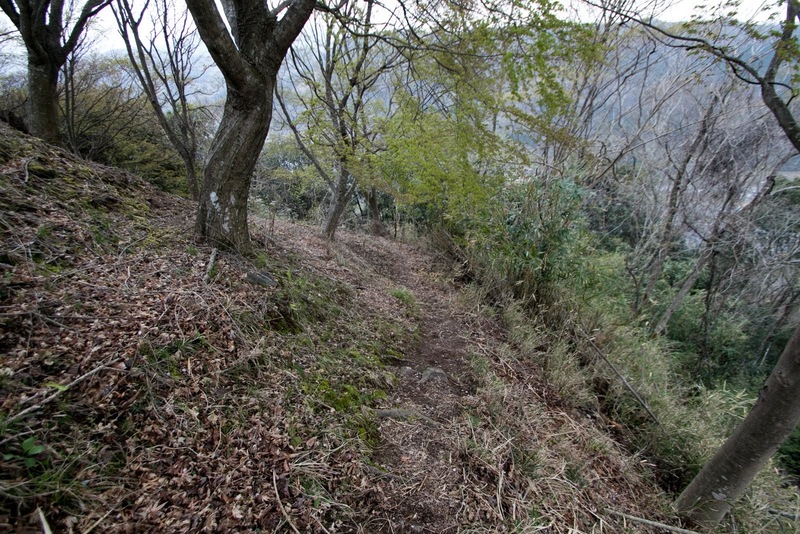 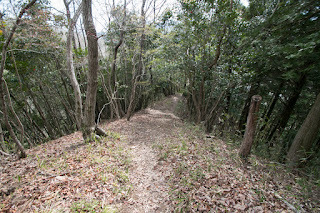 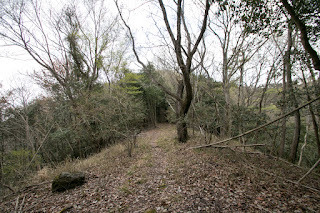 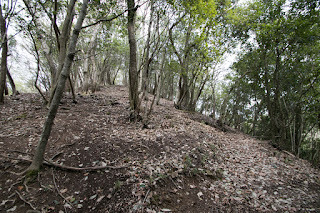 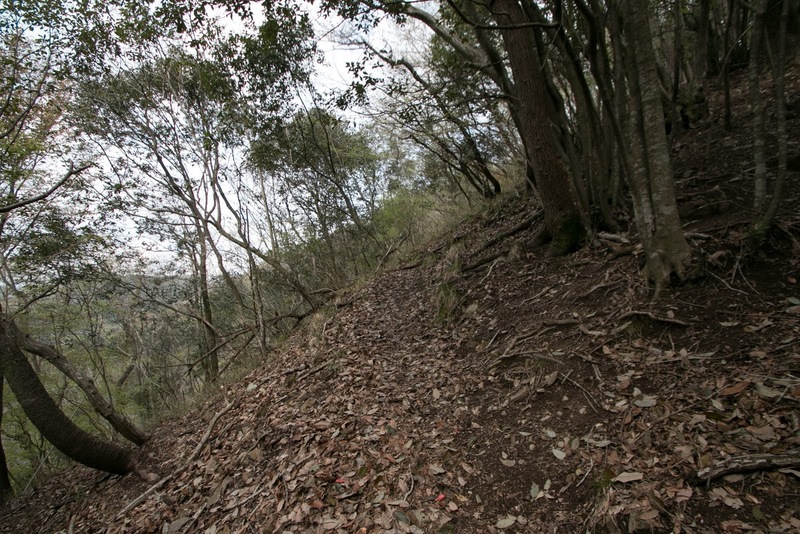 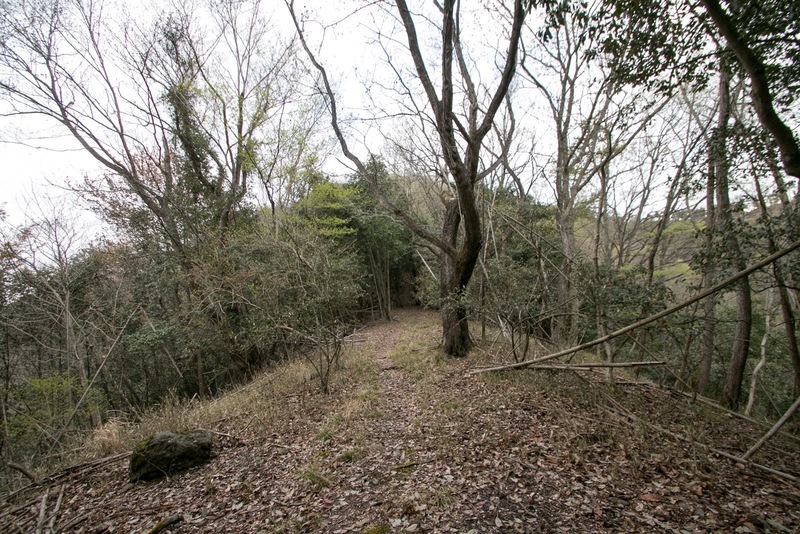 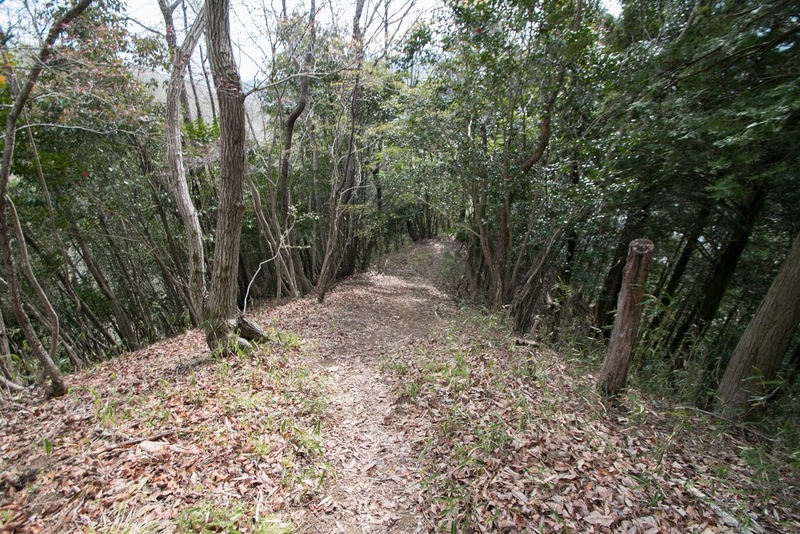 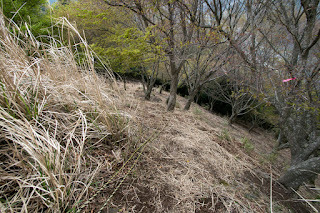 15 minutes walk to hillside entrance of climbing road from Chizu Kyuko Chizu line Hirafuku station. 10 minutes drive to nearest parking (Michi no Eki Hirafuku) from Chugoku Jidoshado Expressway Sayo interchange. 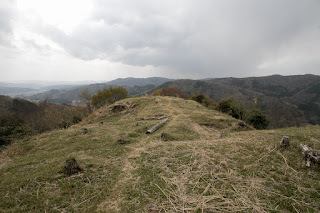 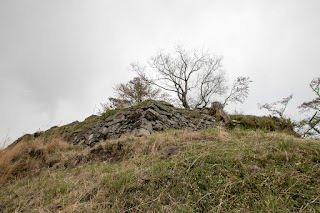 40 minutes walk from hillside entrance to hilltop castle.